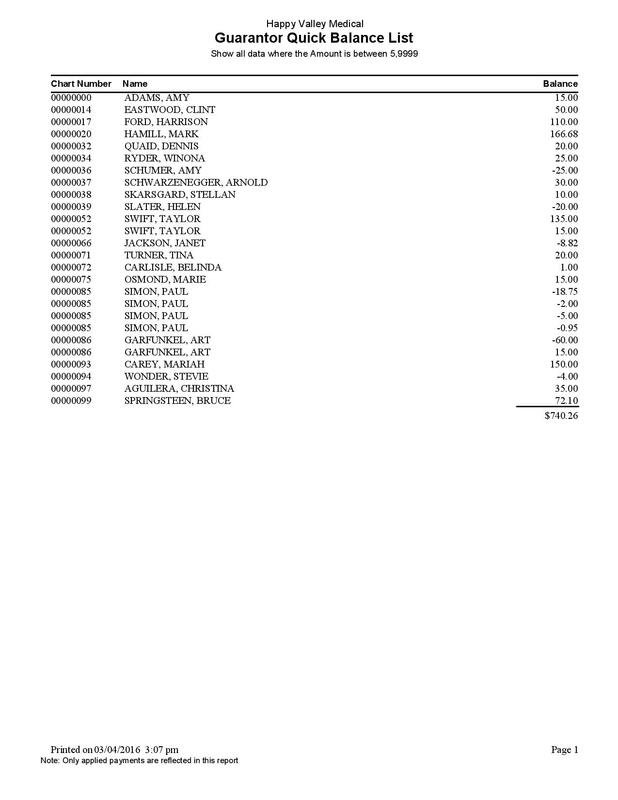 The Unapplied Deposit Report by Payor Name report lists all deposits that have not been applied. 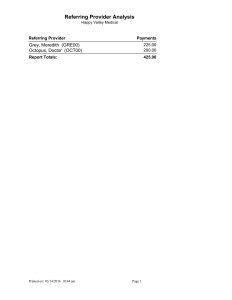 This report provides the deposit date, the insurance code, payor name, payor type, amount of the payment, and the amount of the payment that is still unapplied. 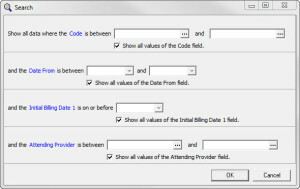 The Referring Provider Analysis report provides a list of your referring providers, their code, and the total payments received from their patients. 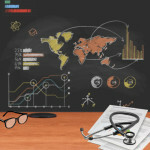 This is a beneficial report to see where your patients are coming from, and which referring provider has helped you generate the most income. 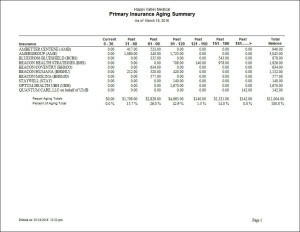 The Primary Insurance Aging is a report that provides aging information on primary insurance balances. 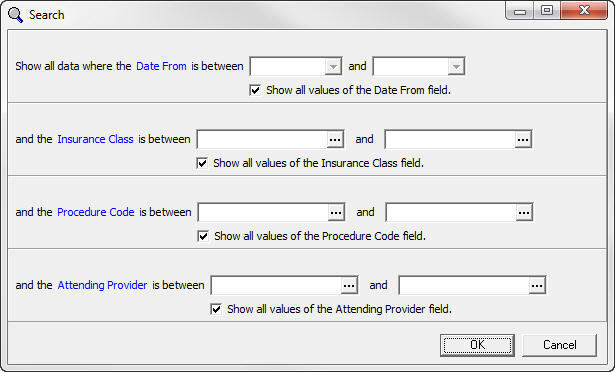 This differs from the Primary Insurance Aging report in Medisoft by also reporting the patient’s insurance policy number. 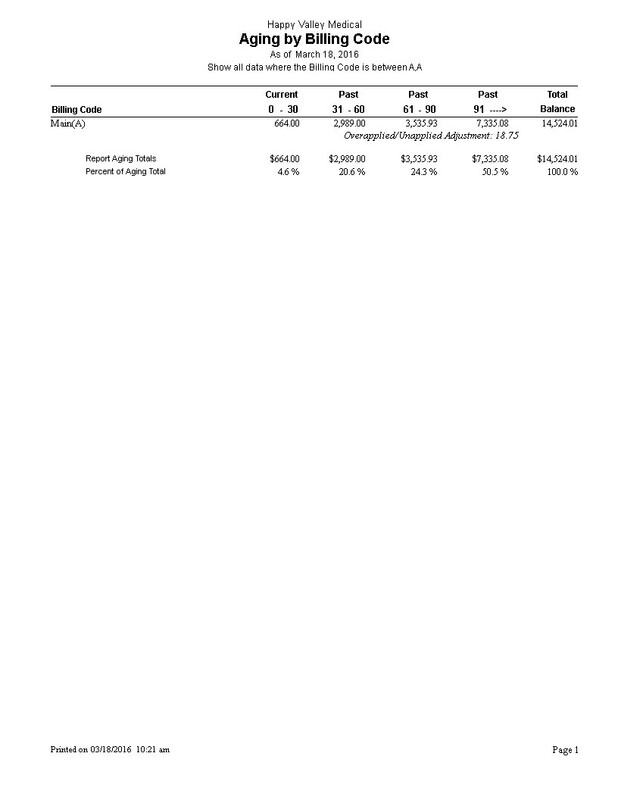 This report includes information on the Primary Insurance Aging report and also includes the percentages of the aging total for each time frame. 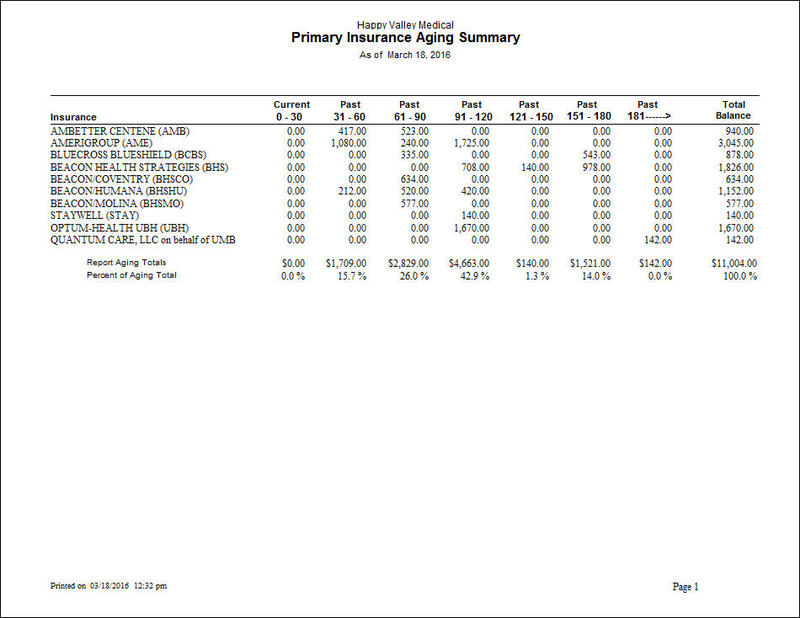 This report includes all information from the Primary Insurance Aging report, and includes the % total for each time frame total balance as well as any transaction notes enter in transaction entry. 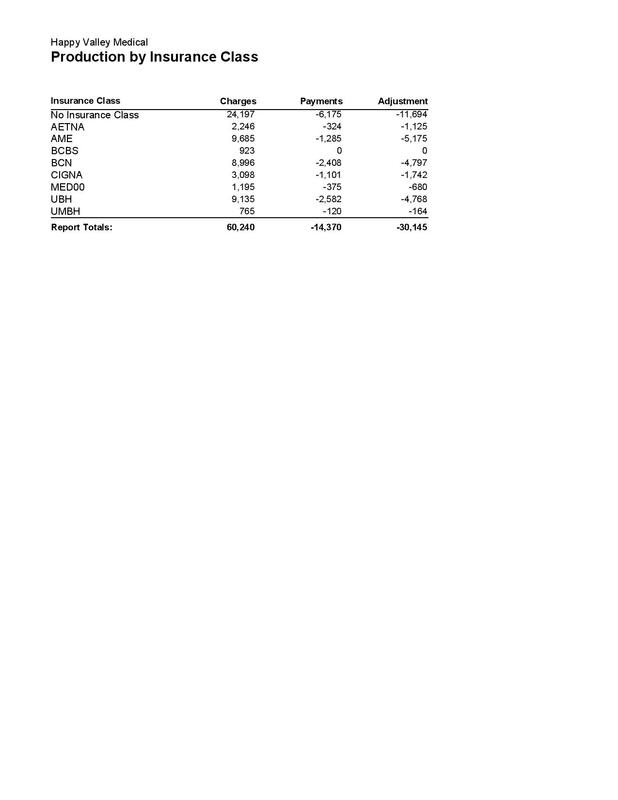 This report includes all information on the Primary Insurance Aging report and also lists the patient policy number and the % total for each time frame balance total. This report also allows you to filter for any primary insurance aging balances incurred on or after a specific date. 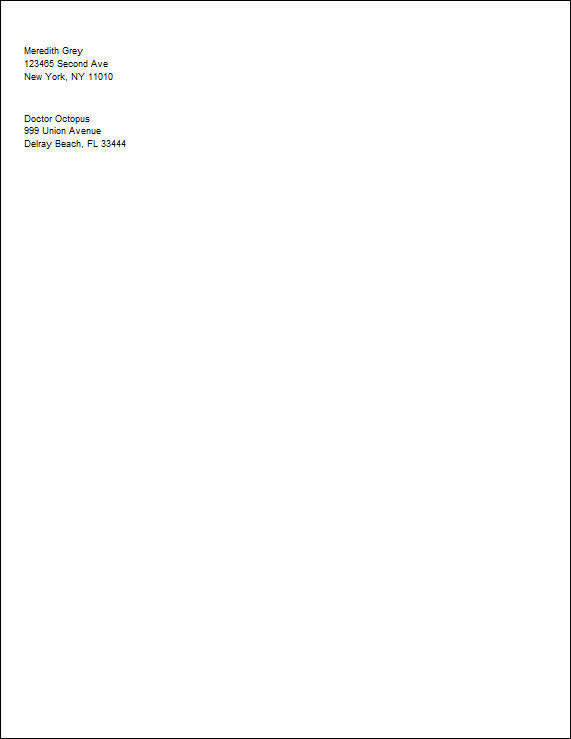 This report is a concise summary of aging by insurance company. 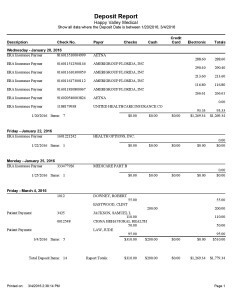 It provides the insurance company name, the breakdown of the aging up to 180 days past due, the total balance for each insurance, and the totals for each aging category. 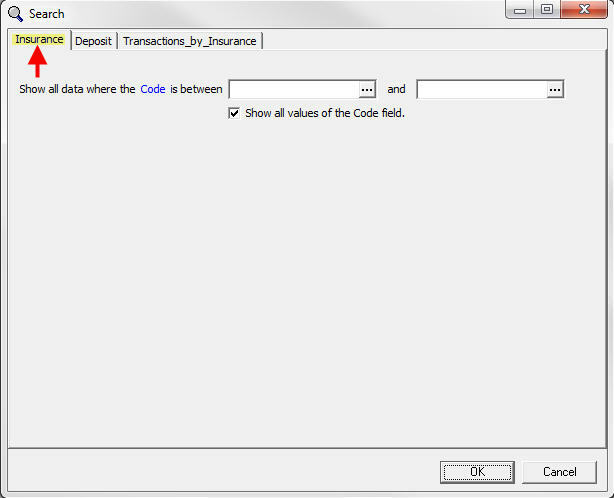 This is a primary insurance aging report that allows you to filter by Biling Code; located in the Case, under the Account tab. 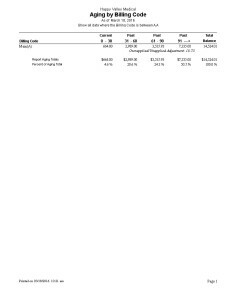 This report provides a summary primary aging report that calculates balances based on responsibility. 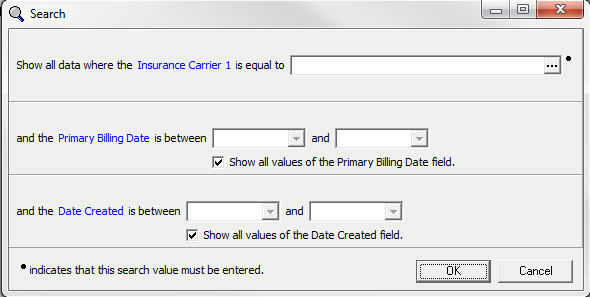 It includes both a line for insurance responsibilities and a line for patient responsibilities. 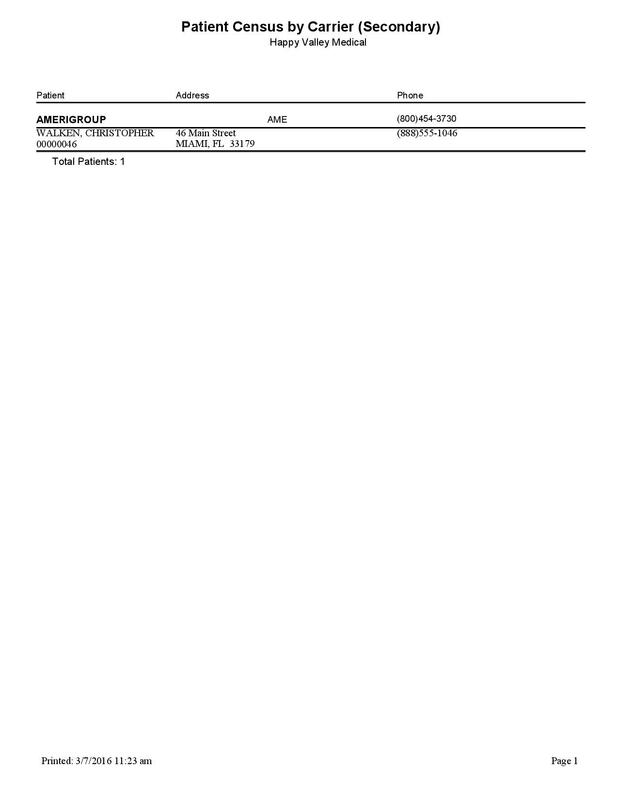 This report provides detailed patient aging information ordered based on the date of service. 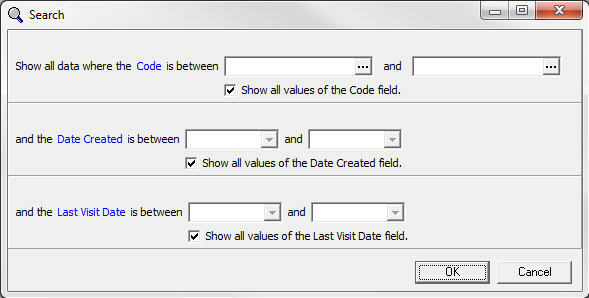 The filter will default to any charges on or before today’s date. 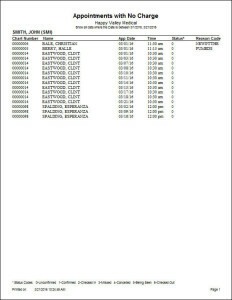 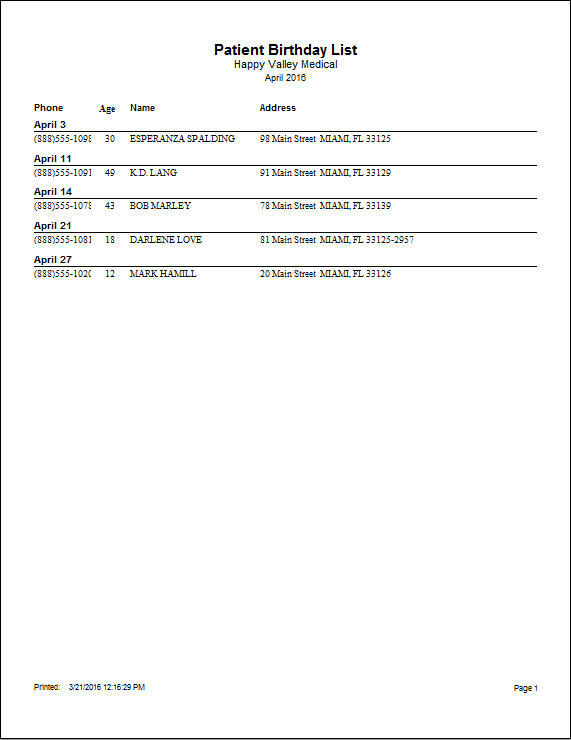 You can change this to see charges entered on or before a specific date. 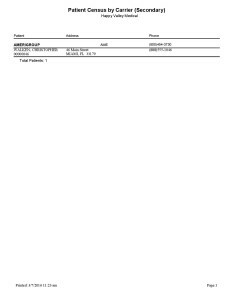 This report provides patient aging information organized based on the date the first statement was issued. 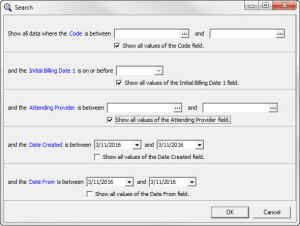 The filter will automatically populate with today’s date, but can be changed to reflect charges/payments/adjustments on or before a specific date. 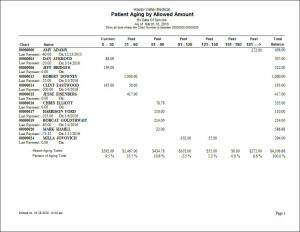 This report provides patient aging information ordered by date of service based on the payors allowed amounts. 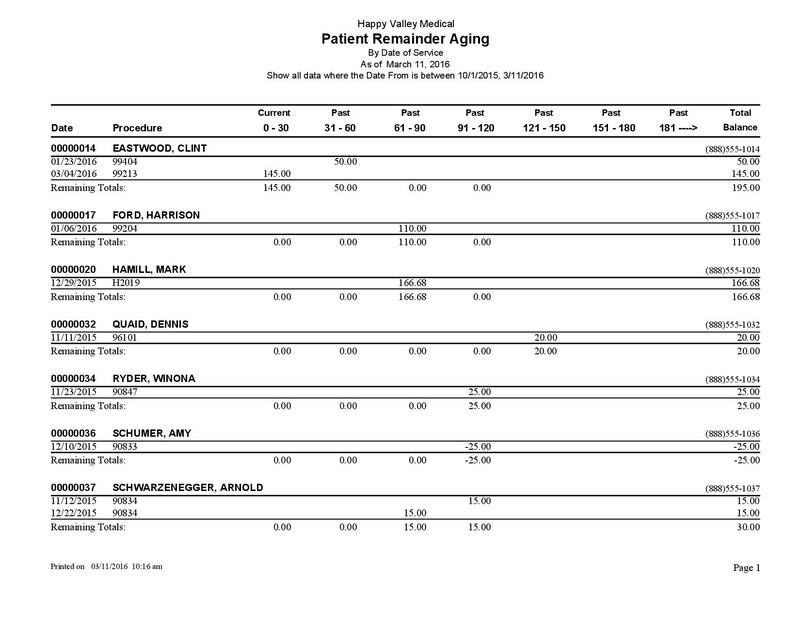 This report provides patient aging information based on the date of service. 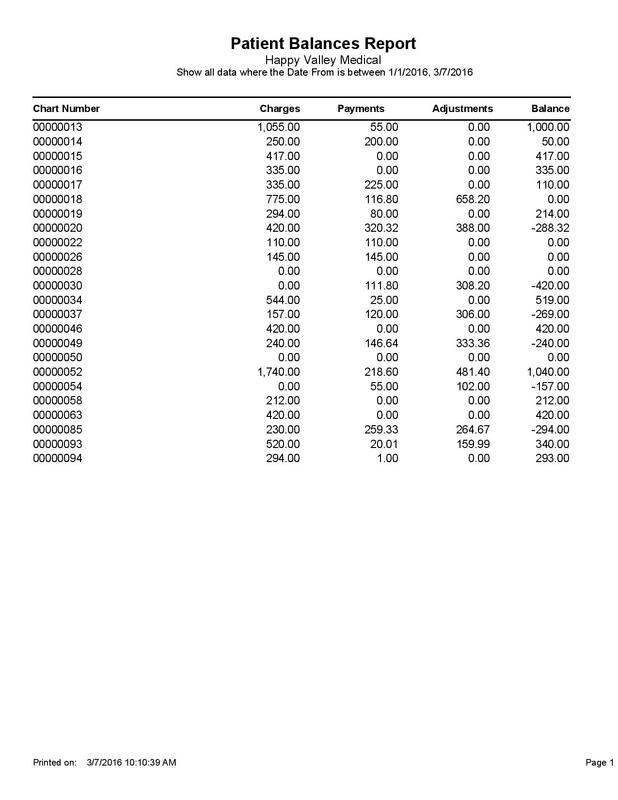 It is ordered by the account balance, in descending order. 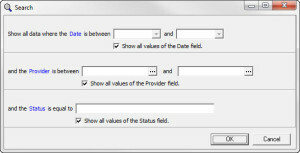 Aging categories include 0-30, 31-60, 61-90, and 91+ days past due. 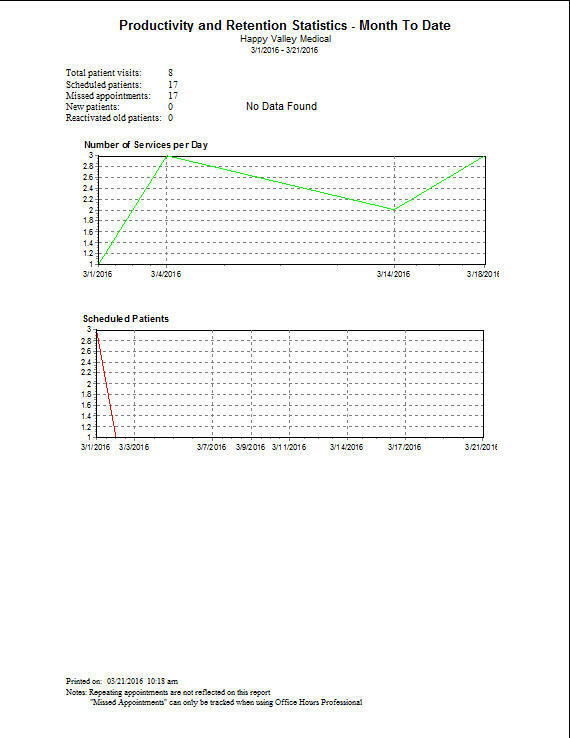 This report provides patient aging information that falls into the 31-60 days past due from the date of service category. 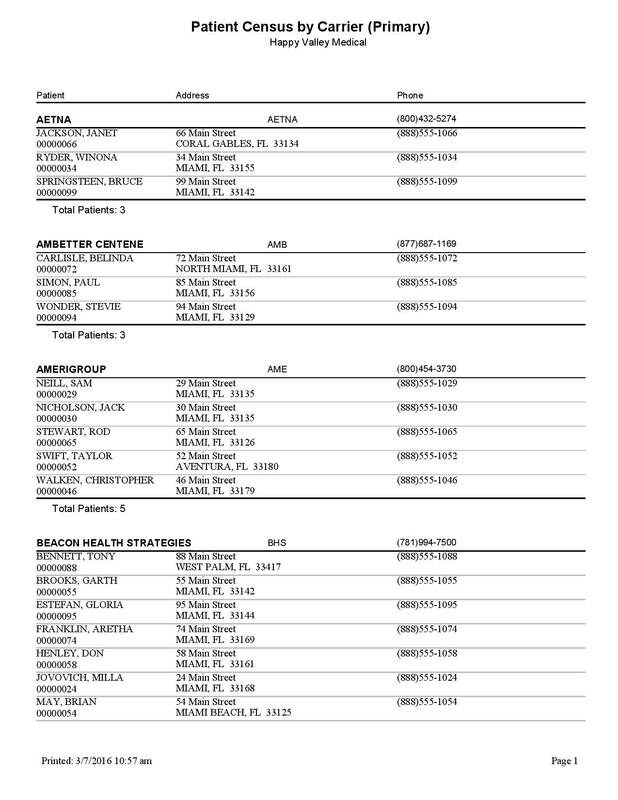 If any of these patients have older balances, the 61-90 days and 91 days and over past due categories will report those amounts. 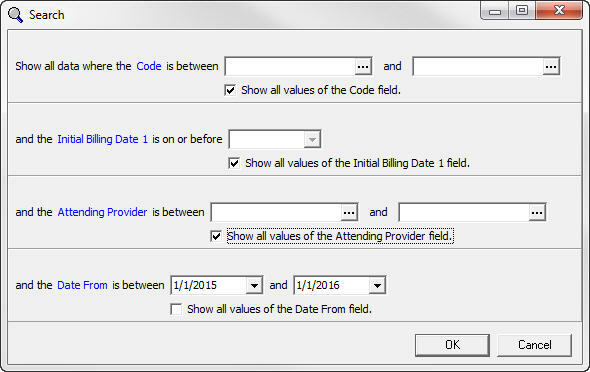 This report shows patient aging information that falls into the 61 days past due category from the date of service. 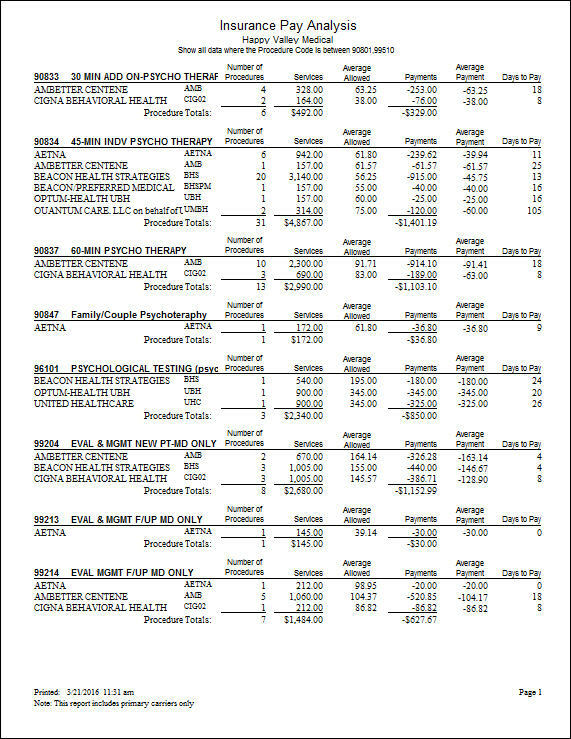 If these patients also have an older balance, the 91 days and over past due column will report the amount due. 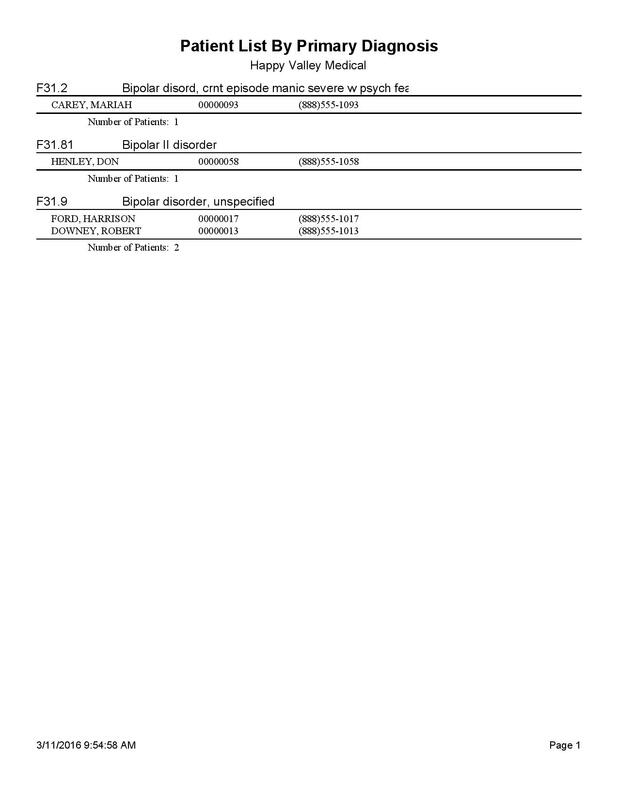 This report provides patient aging information for the category of 91 days or more past due from the date of service. 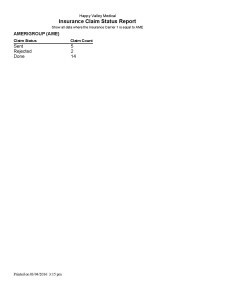 This report provides patient aging information from the date of service and also includes more aging categories. 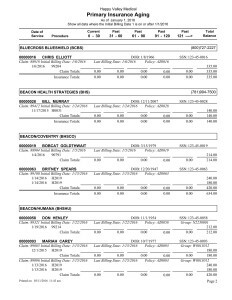 Additional categories are 91-120, 121-150, 151-180, and 181+ days past due. 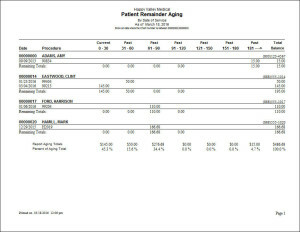 This report shows patient aging information from the statement date. 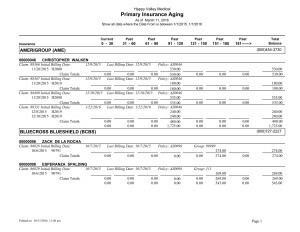 Extended aging categories are included with 91-120, 121-150, 151-180, and 181+ days past due. This report shows primary insurance aging information with extended aging categories of 91-120, 121-150, 151-180, and 180+ days past due. 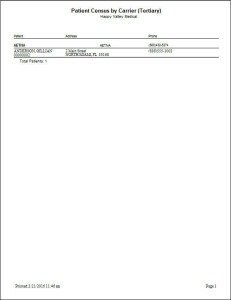 This report is ordered by insurance company and allows you to filter the report for one insurance company or a group of insurance companies. 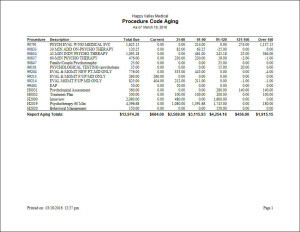 This report provides patient remainder balance aging information with additional aging cateogies. 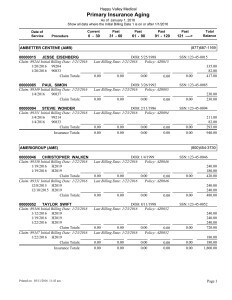 Extended aging includes 91-120, 121-150, 151-180, and 181+ days past due. This report provides patient remainder balance aging information sorted by the largest patient remainder balance. 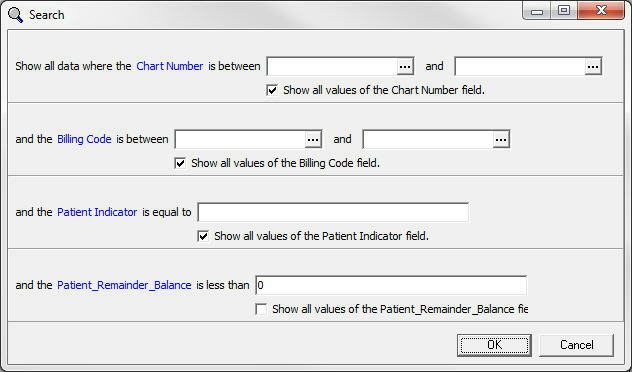 The patients are listed in order of descending balance amount. 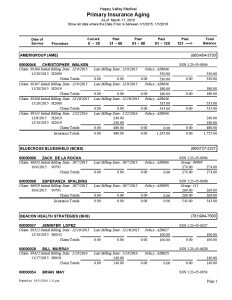 This report provides primary insurance aging information with extended aging categories of 91-120, 121-150, 151-180, and 181+ days past due. 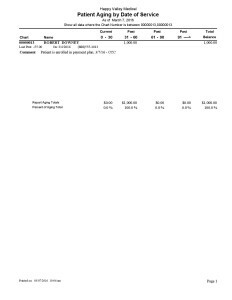 This report provides a summary of primary insurance aging information organized by insurance company. 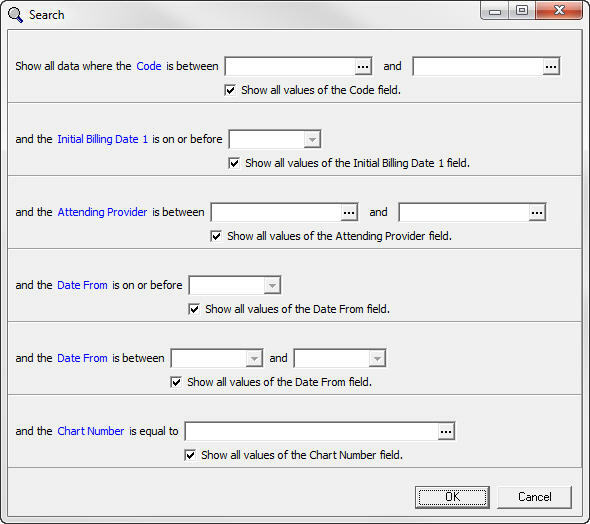 This also includes extended aging categories of 91-120, 121-150, 151-180, and 180+ days past due. 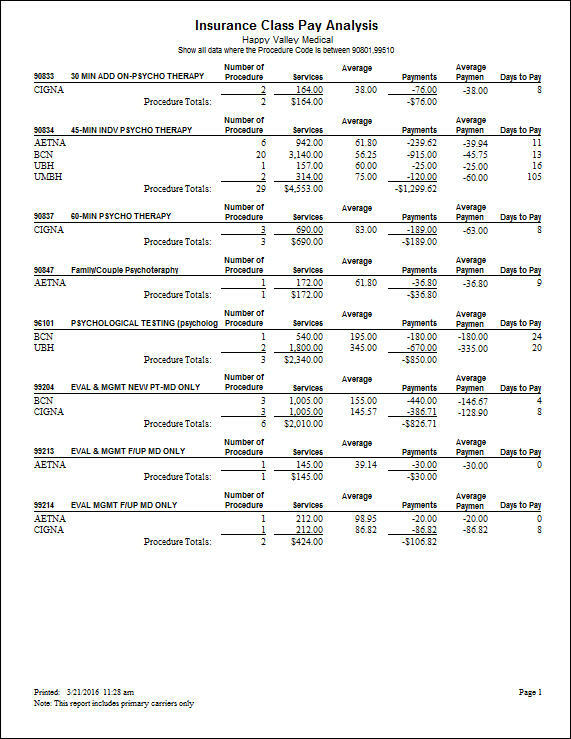 This is helpful to compare the aging between insurance companies. 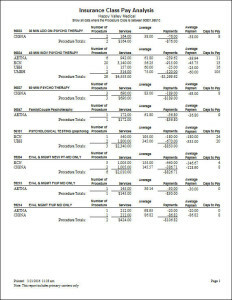 This report provides primary insurance aging organized by insurance class. 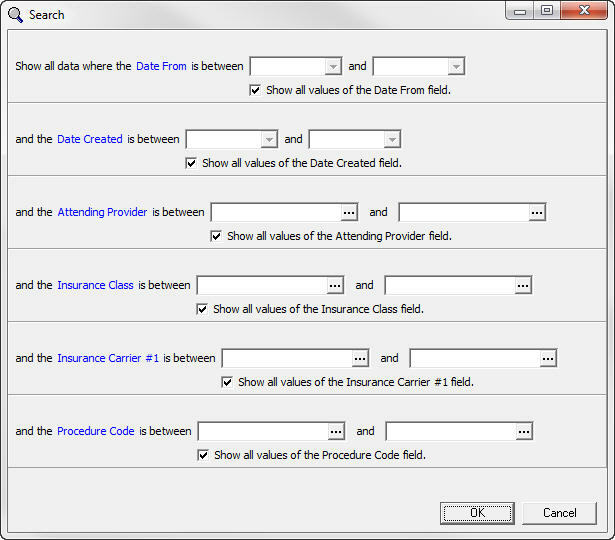 This also gives you the option to filter the report for a specific insurance class, or a group of insurance classes. 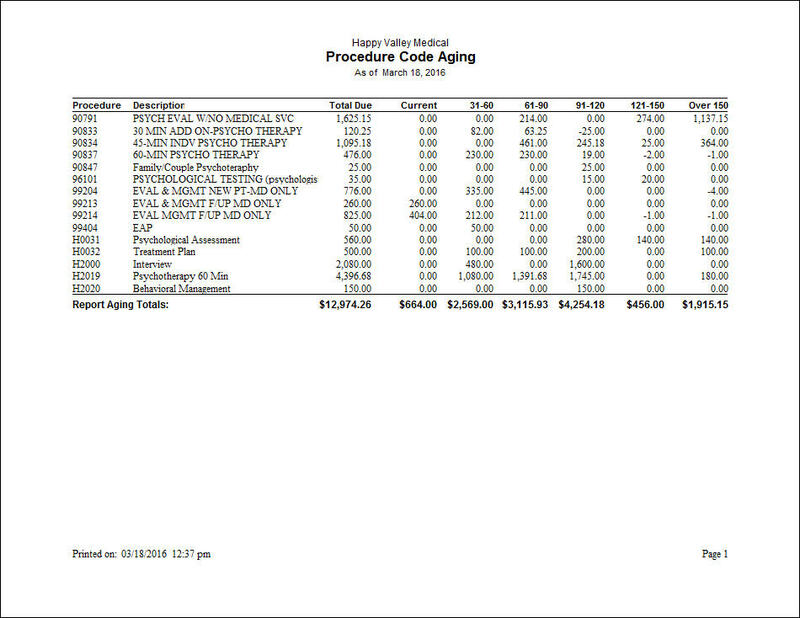 This report shows summary aging information organized by procedure code. 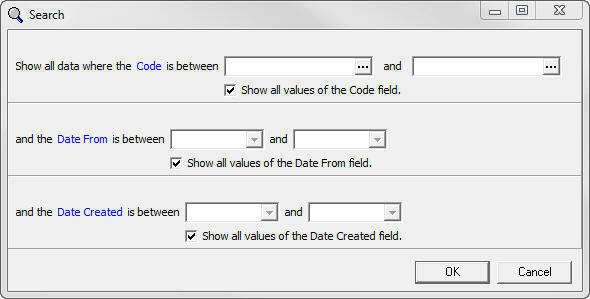 It also includes extended aging categories of 91-120, 121-150, and 150+ days past due. 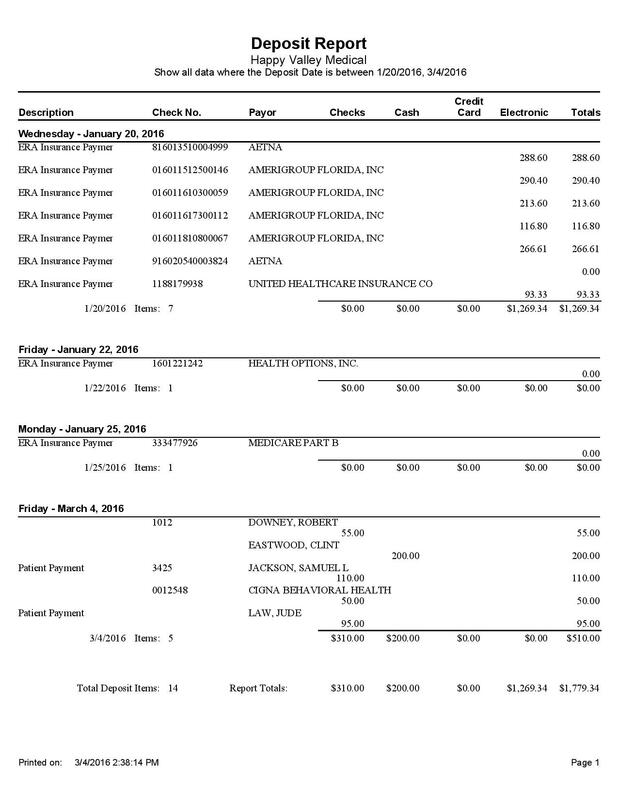 This is a good report to show which procedures are taking longer to get paid. The Primary Insurance Aging Detail (aged by DOS) includes primary insurance aging information with the patient’s policy number and the % total for each aging category. 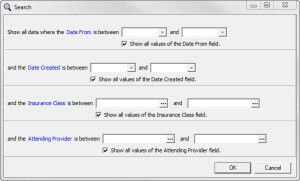 It is organized by primary insurance company and allows more filtering options including filter by code, billing date, attending provider, date from (or or before), date from (range), or chart number. The Primary Insurance Aging Detail Extended (180+) DOB, SSN report includes detailed primary insurance aging with extended time categories up to 181+ days past due. 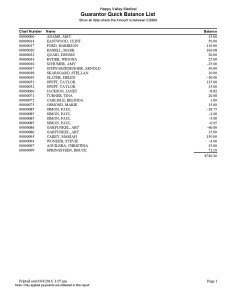 This also shows the patient’s insurance policy number, date of birth, social security number, and % total for each aging category. 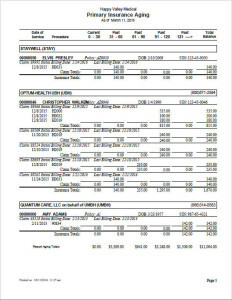 The Primary Insurance Aging Detail (Extended 180+) Date of Service report includes primary insurance aging detail with additional columns for 121-150 days past due, 151-180 days past due, and 181+ days past due. 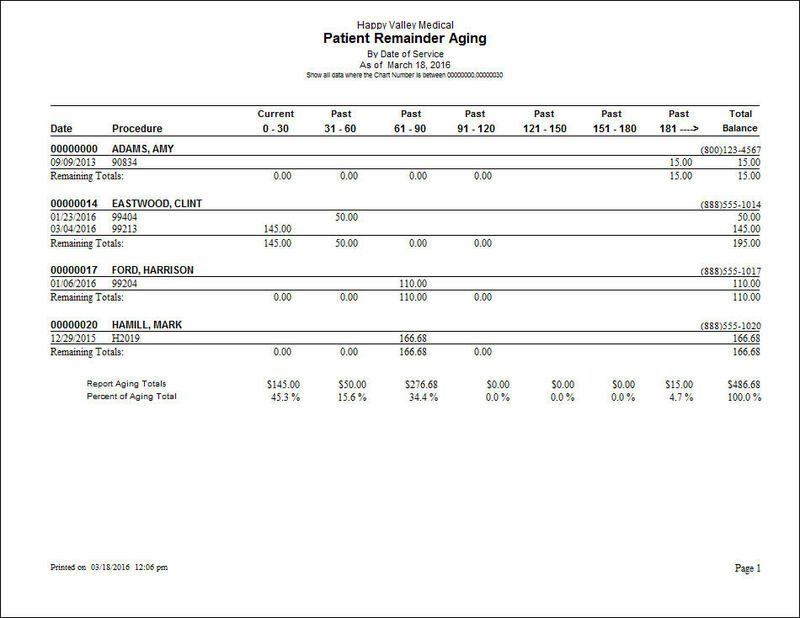 This report also shows the patient policy number and the % totals for each aging category. The Primary Insurance Aging Detail (Extended 180+) DOB Date Range report includes detailed primary insurance aging with additional past due categories up to 180+ days past due. This report also includes the patient’s policy number, date of birth, and % totals for aging categories. 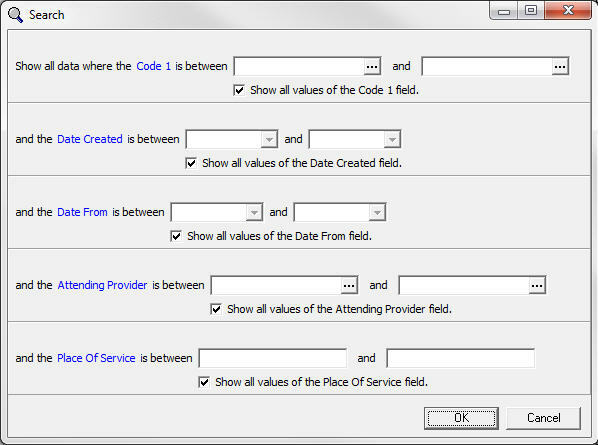 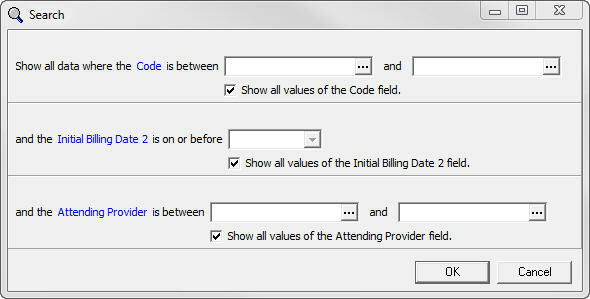 It also allows for further filtering by offer an option to filter by inital billing date range. 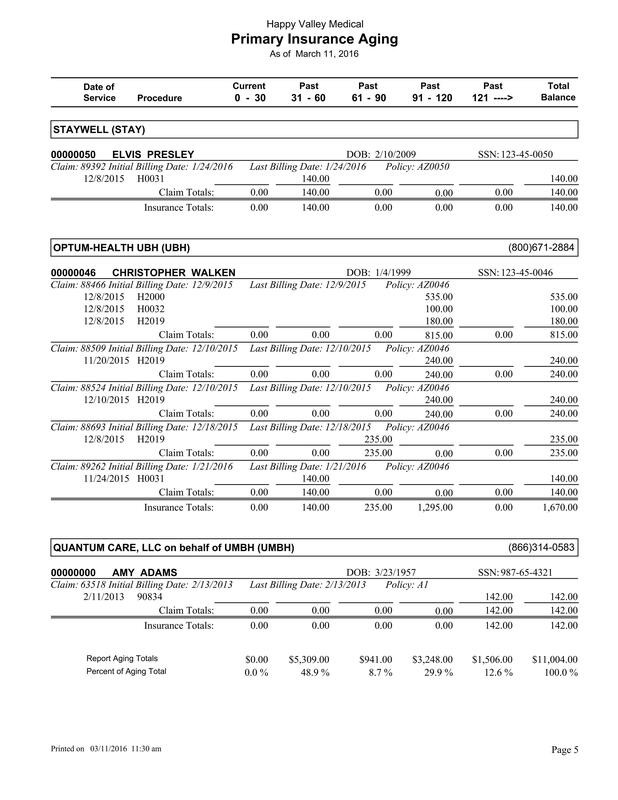 The Primary Insurance Aging Detail (Extended 180+) DOS report provides detailed primary insurance aging information with extra date ranges up to 181+ days past due. 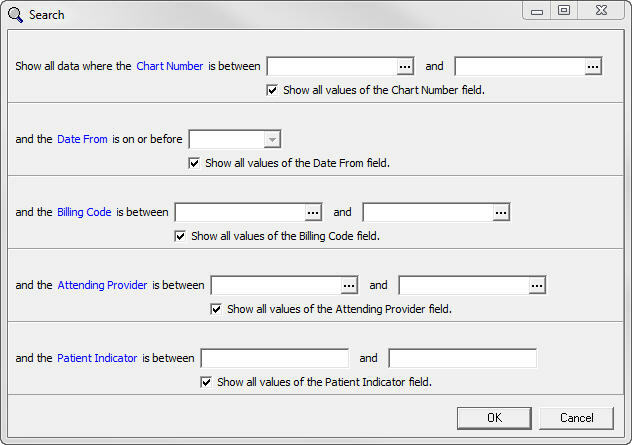 It also includes the patient’s policy number, the % totals for each aging category, and the ability to filter by date of service within a specific time range. 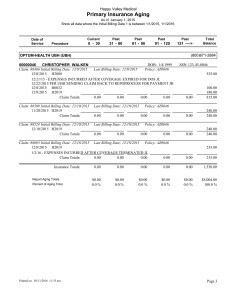 The Primary Insurance Aging Detail (Extedned 180+) MW report gives detailed primary insurance aging information with the patient’s policy number and % total of each aging category. This report has filters for date created and date from that default to today’s date, but these can be edited to search for different ranges. 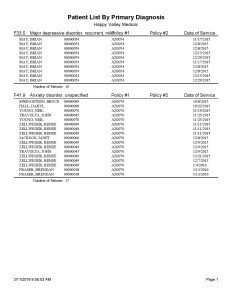 The Primary Insurance Aging DOB report includes primary insurance aging information with the patient’s insurance policy number, date of birth, and social security number. 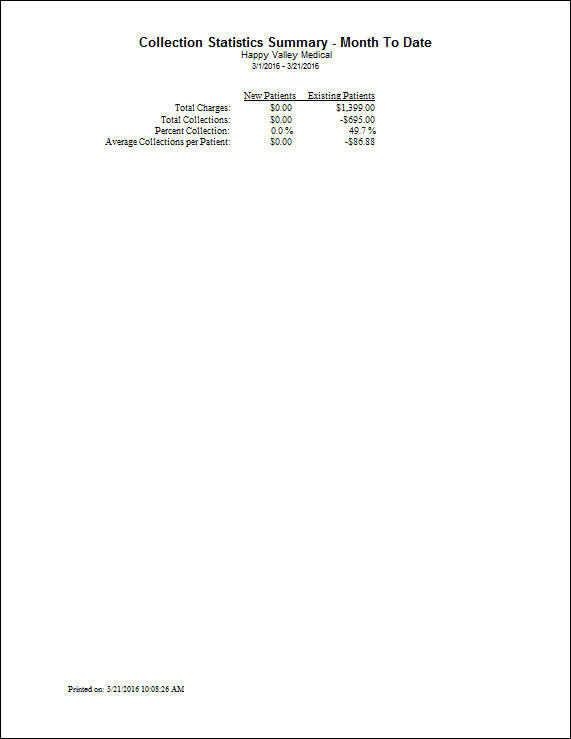 The end of the report also states the % total for each aging category. 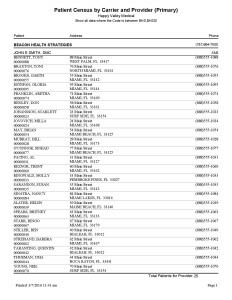 The Primary Insurance Aging DOS Aging report includes primary insurance aging information that includes the patient’s policy number, social security number, and group number. 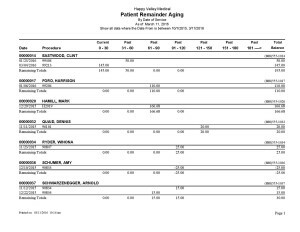 It also includes the % total for each aging category. 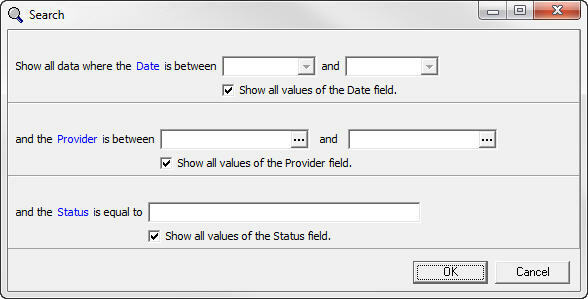 The report provides an additional filter to select a specific date of service or date range. 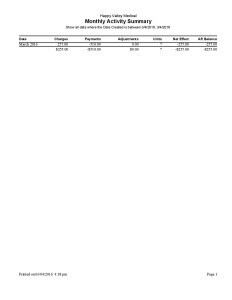 The Primary Insurance Aging DOS Search report is a detailed primary insurance aging with patient’s insurance policy number and group number, along with the social security number. 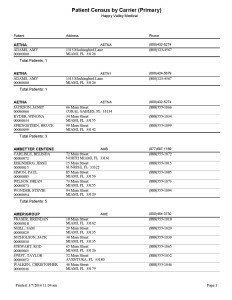 The patients are organized by primary insurance company. 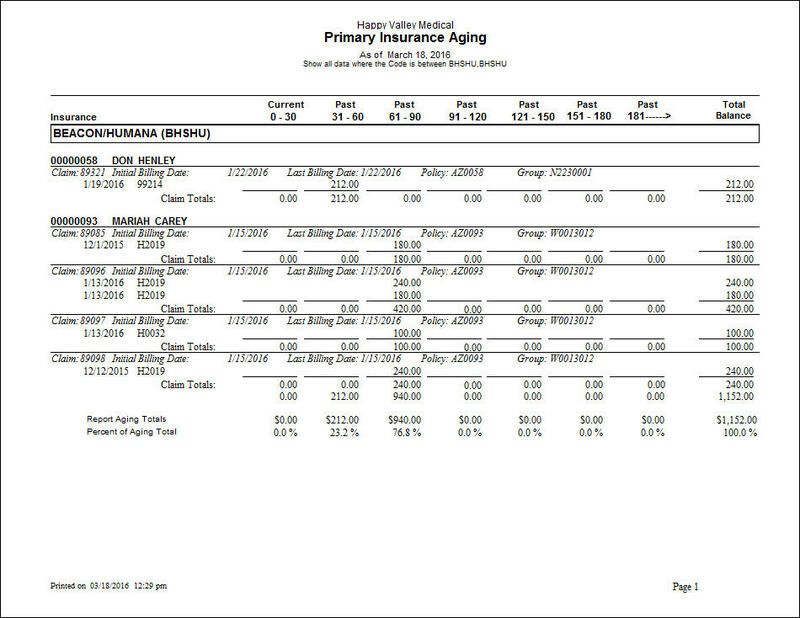 The report also includes the % total for each aging category. 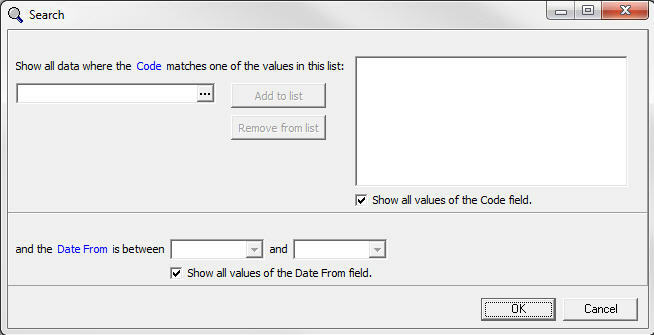 The filters allow you to search for a specific date or date range. This report is a very concise summary of aging by insurance company. 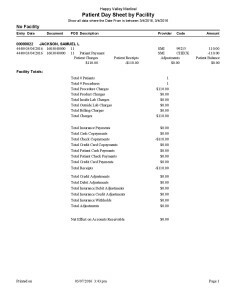 It provides the insurance company name, the breakdown of the aging up to 180 days past due, the total balance for each insurance, and the totals for each aging category. 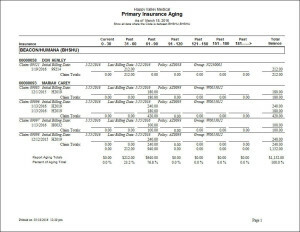 It also provides a % total for each aging category. 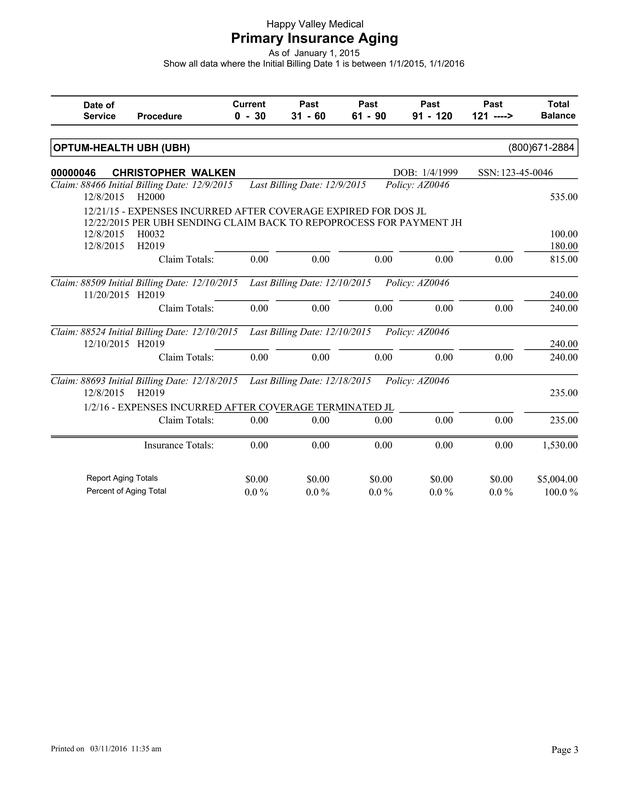 The report allows you to filter by insurance company (or a group of companies), initial billing dates, attending provider, or facility. 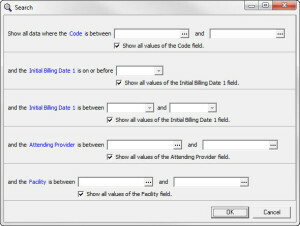 This differs from the Patient Aging reports by offering additional filters of Date From, Billing Code, and Patient Indicator. 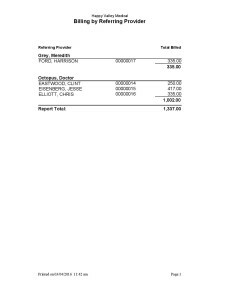 The report that is generated also includes additional details including the last payment amount, last payment date, and patient’s phone number. 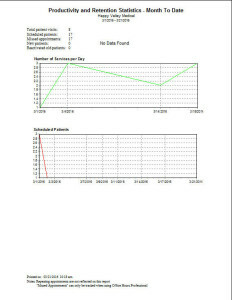 The Patient Remainder Aging (Date Range and DOB) report provides a patient remainder aging report with the date of birth. 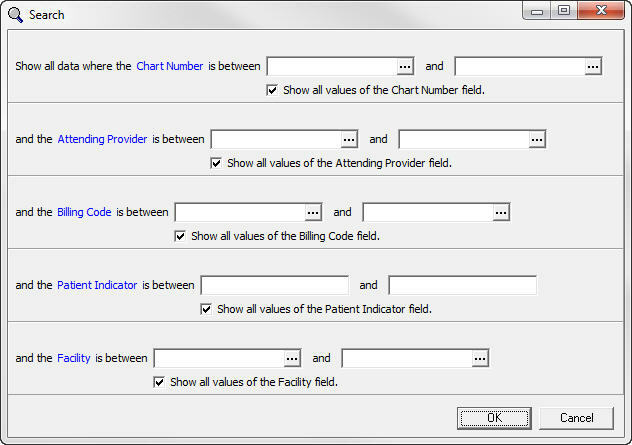 This report allows you to filter by patient chart number, billing code, or patient indicator. 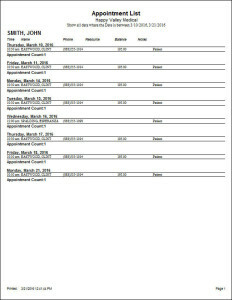 The Patient Aging by Date of Service (With Comments) report shows patient aging with any comments entered in the Case, under the tab “Comment” in the comment box on the bottom half of the screen. 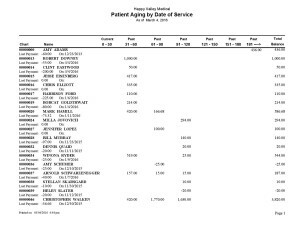 For example, the sample report shows the Patient Aging by Date of Service (With Comments) run for only one chart number, with a comment regarding the payment plan for this patient. 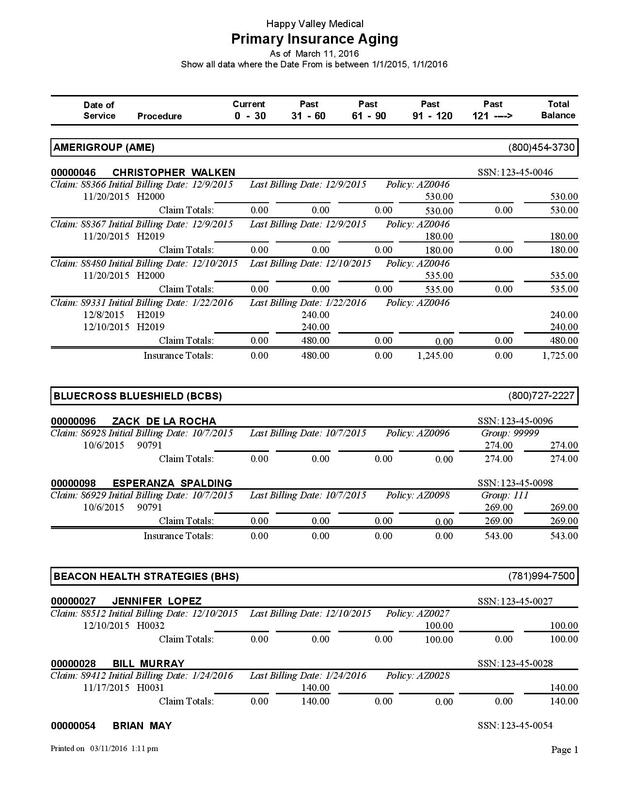 The Patient Aging by Date of Service (Extended 180+) MW report consists of the patient aging information, but instead of stopping at 91 or 120 days, there are additional columns for 91-120 days, 121-150 days, 151-180 days, and 181 days and over. 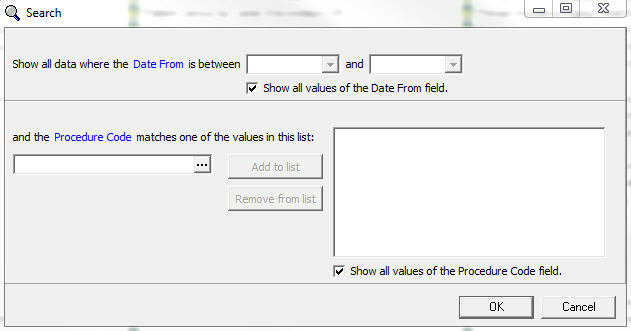 This report also allows you to filter for additional fields such as facility, date created, and date from. 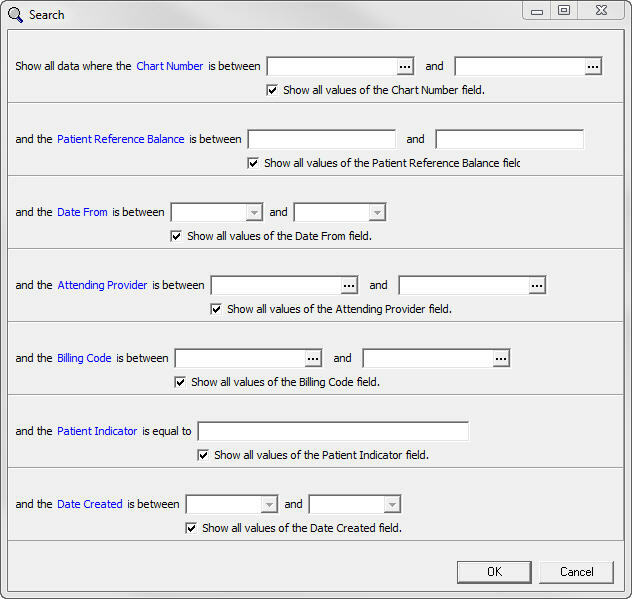 The Patient Remainder Aging (Extended 180+) Date Range report provides a patient remainder aging report that has additional columns to view balances that are between 121-150, 151-180, and 181 + days old. 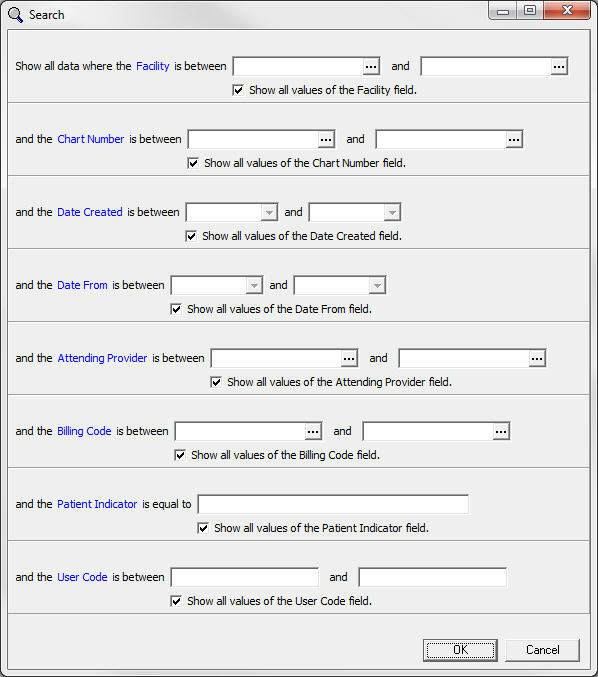 This report also has more filtering options, including patient chart, billing code, patient indicator, facility, date created, and date from. This report provides a pie chart of the adjustments posted for each facility. 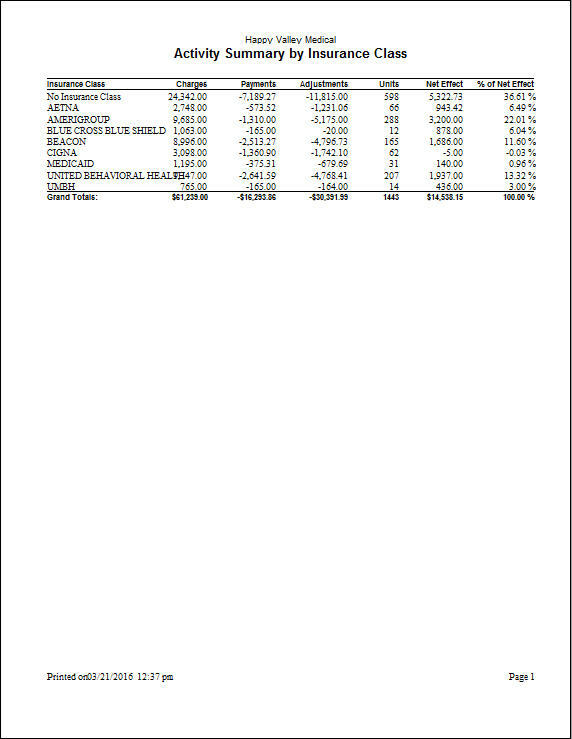 Totals amounts are listed facility in the key below the chart. 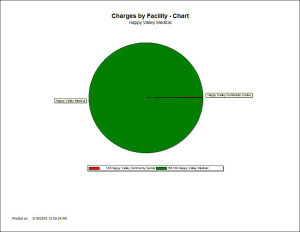 This report provides a pie chart that shows the charges by each facility. 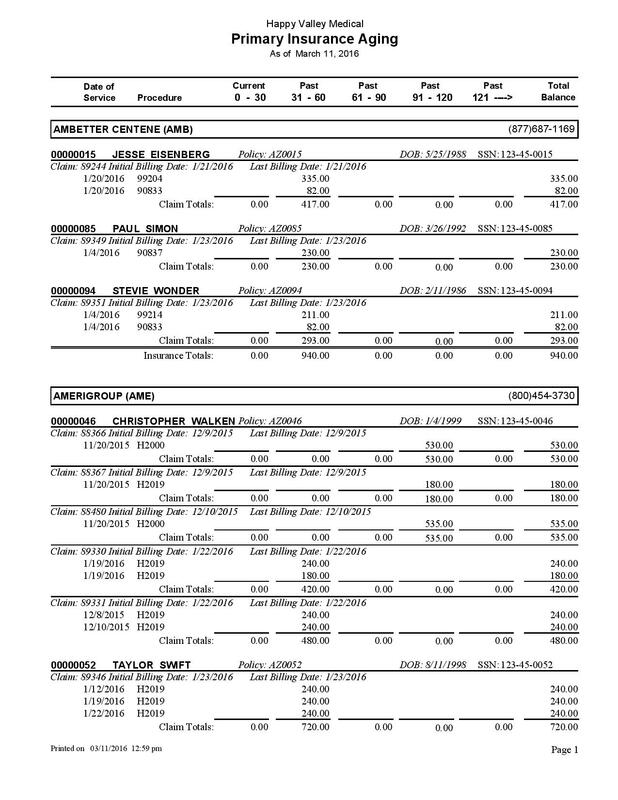 Totals for each facility are provided in the key below the chart. 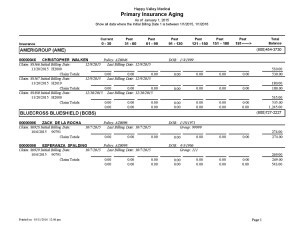 This report provides comparison information on multiple facilities’ activity. 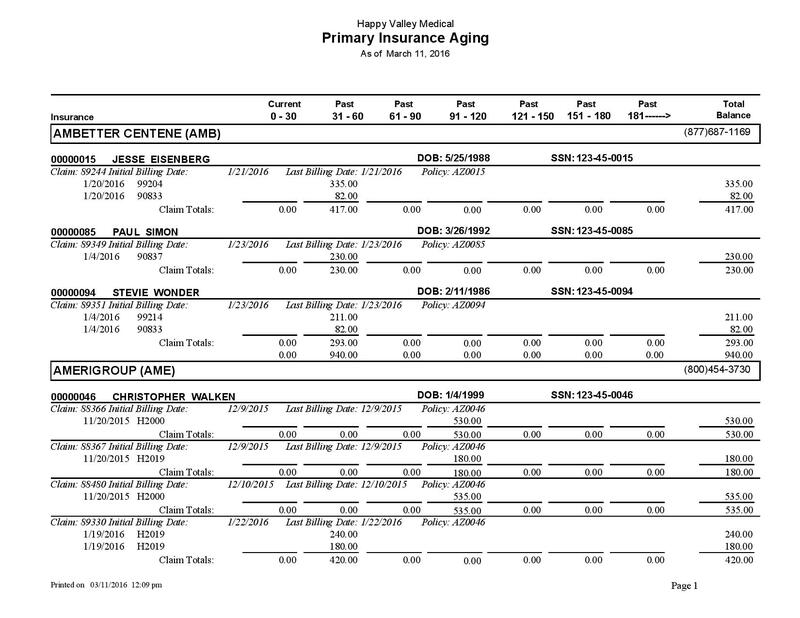 This includes a summary of charges, payments, and adjustments for each facility. 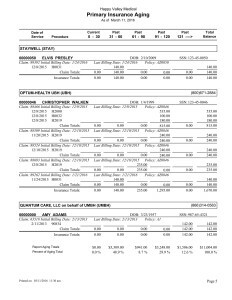 This is a great report to run if you are looking to compare basic A/R factors for a multiple-facility practice. 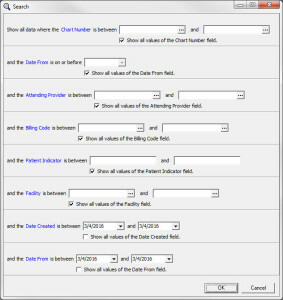 The Patient Day Sheet by Facility report shows the patients for a date or date range and organizes that list by facility. 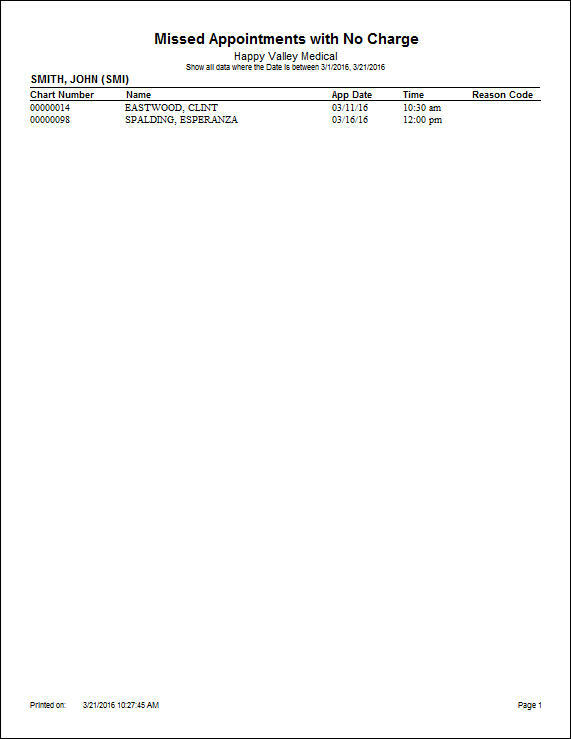 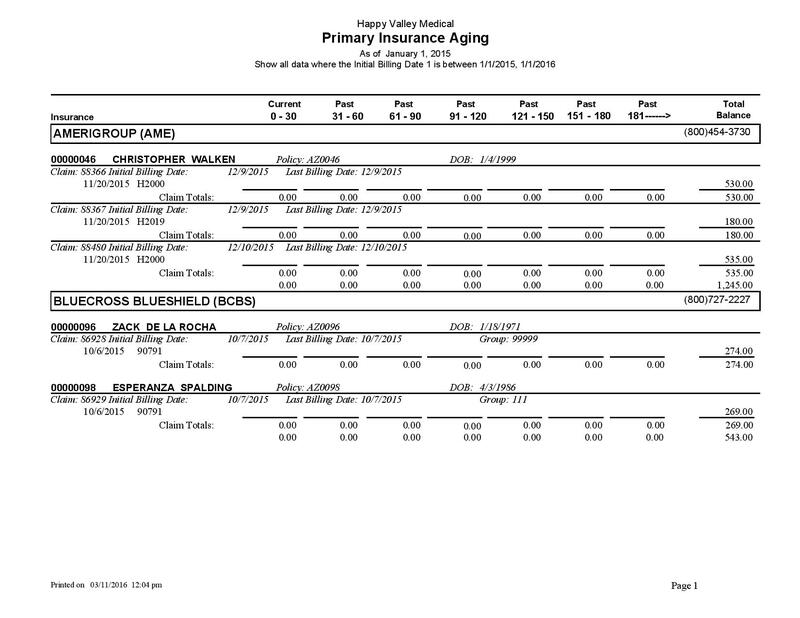 For example, in the sample report, there is one appointment that does not have a facility listed so it shows up as “No Facility” and then provides facility totals. 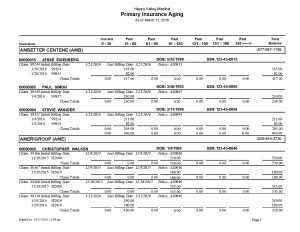 The next three appointments were assigned to the facility “Happy Valley Medical”, and facility totals are provided after those three appointments are listed. 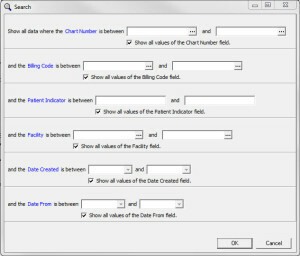 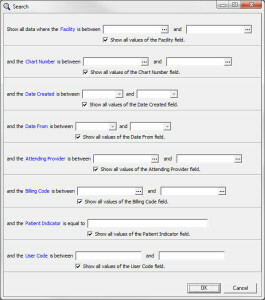 The Patient Day Sheet by Facility by User Code report shows the patients for a date or date range and organizes that list by facility and by User Code. 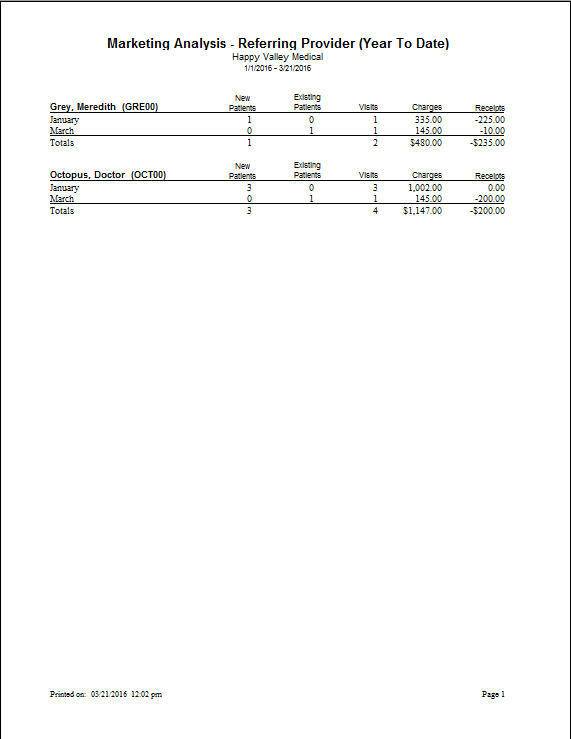 For example, in the sample report, there is one appointment that does not have a facility listed so it shows up as “No Facility” and then provides facility totals. 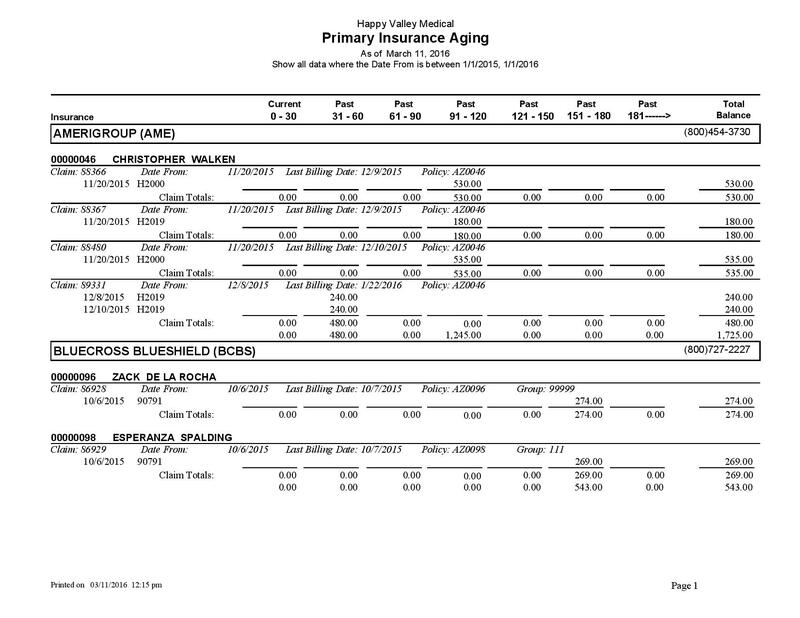 The next three appointments were assigned to the facility “Happy Valley Medical”, and facility totals are provided after those three appointments are listed. 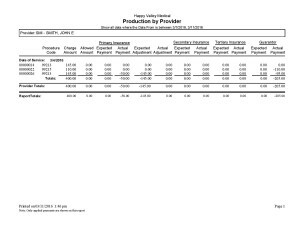 The Production by Provider and Facility report includes provider production sorted by date of service. 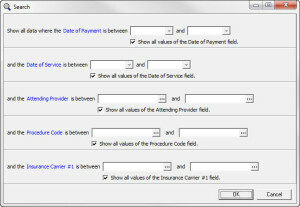 It note the patient’s chart number, the procedure code, charge amount, allowed amount, primary, secondary, and tertiary insurance expected/actual payments, expected/actual adjustments, and guarantor expected/actual payments. 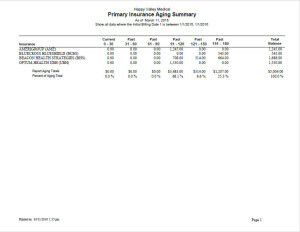 This report also lists totals of each category. 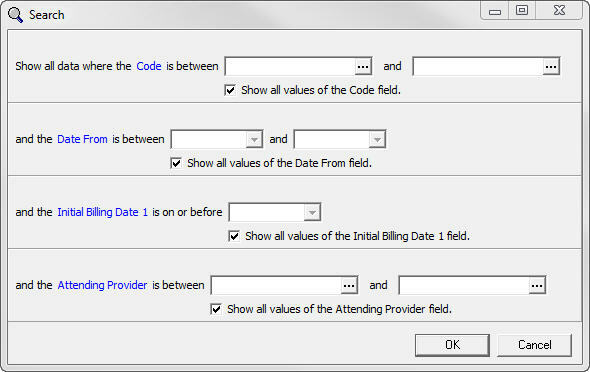 Filters include date of service, date created, attending provider, procedure code, insurance carrier, and facility. 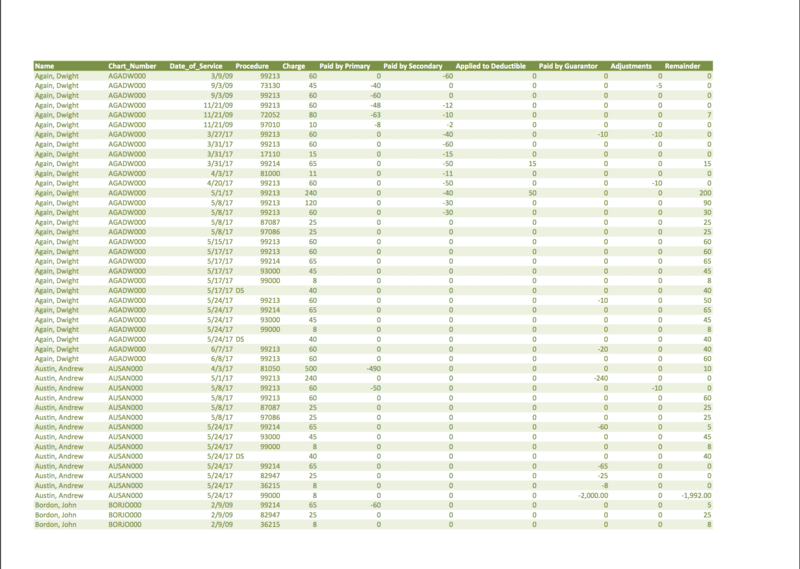 This report provides detail on patients seen within the last month to date. 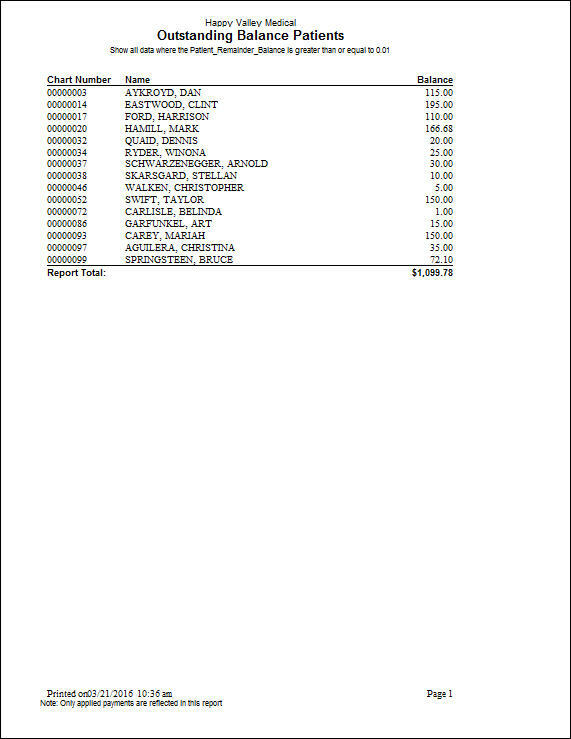 It includes which patients were seen, the amount charged, the amount collected, and the percent of charges collected. 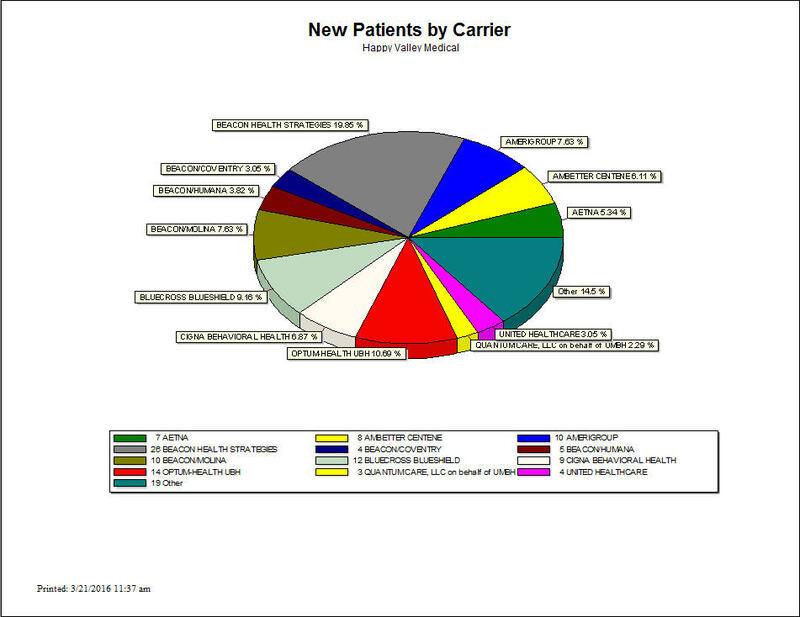 This report provides detail on patients seen within the year prior. 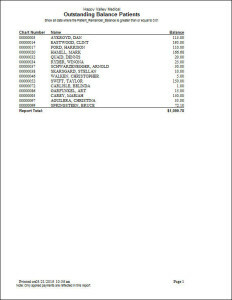 It includes which patients were seen, the amount charged, the amount collected, and the percent of charges collected. 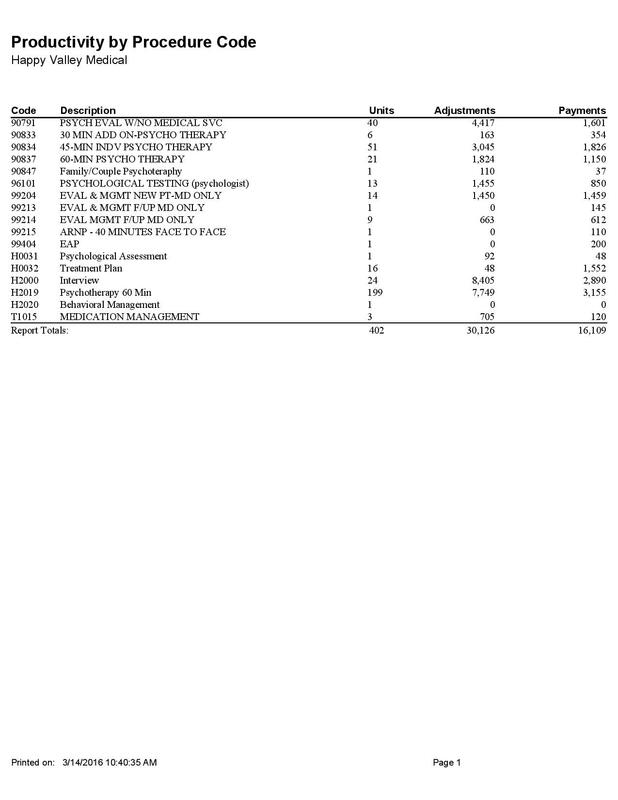 This report provides detail on patients seen within the last year to date. 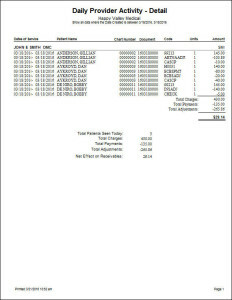 It includes which patients were seen, the amount charged, the amount collected, and the percent of charges collected. 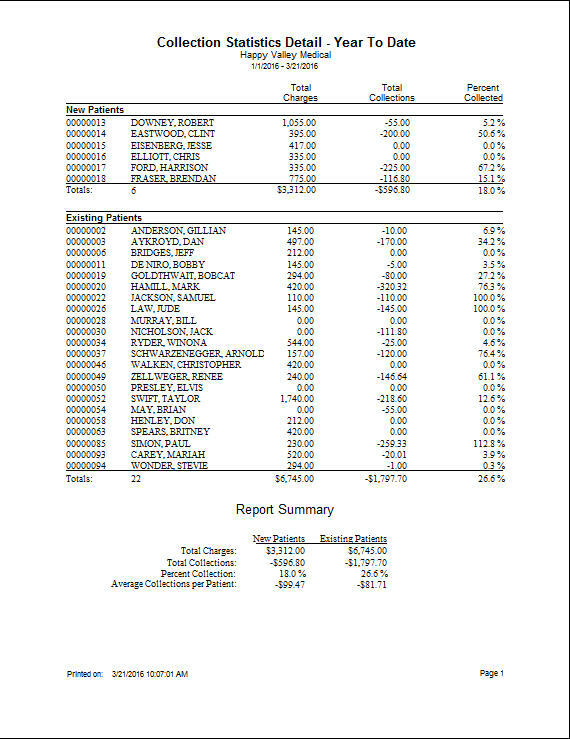 This report provides a summary of charges, payment collections, percent collected, and average collections per patient for the practice for the last month to date. 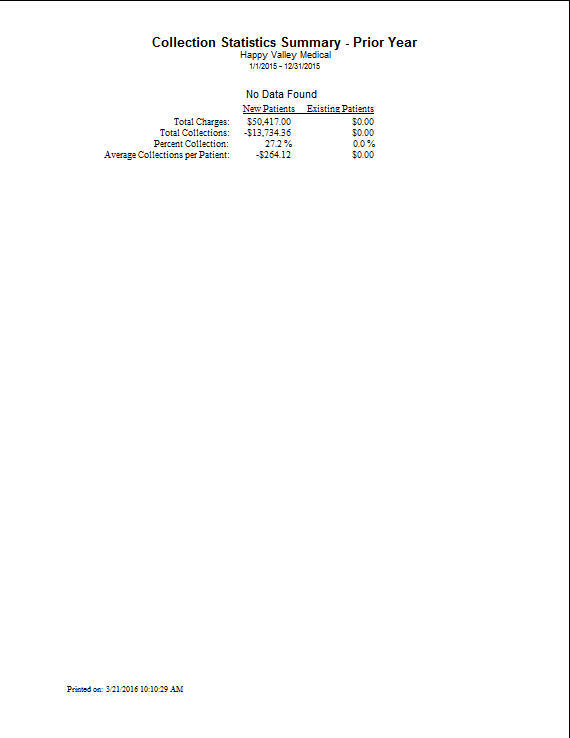 This report provides a summary of charges, payment collections, percent collected, and average collections per patient for the practice for the last year. 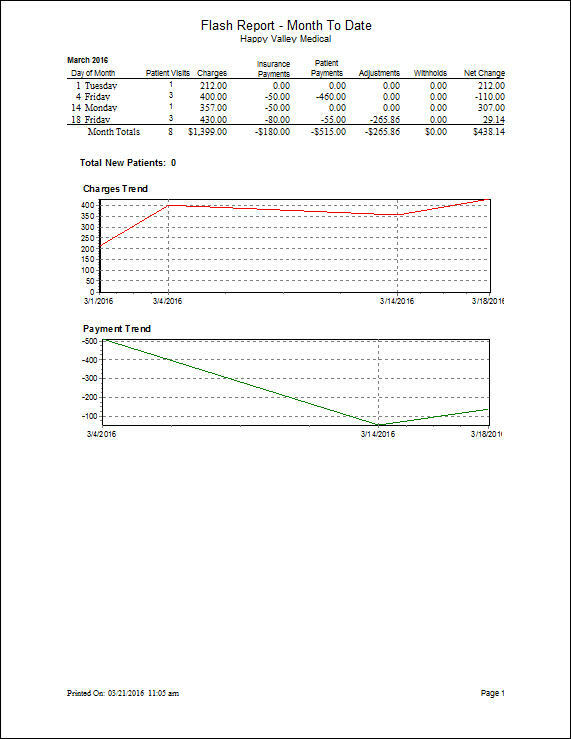 This report provides a summary of charges, payment collections, percent collected, and average collections per patient for the practice for the last year to date. 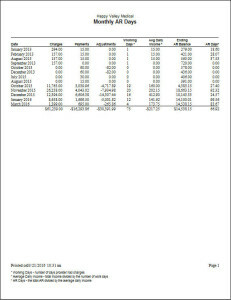 This report provides financial information for the practice in the last month to date. 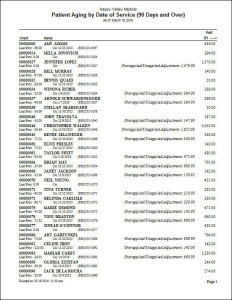 Charges are listed by the day of the month, and include payments, adjustments, collections, and number of visits. 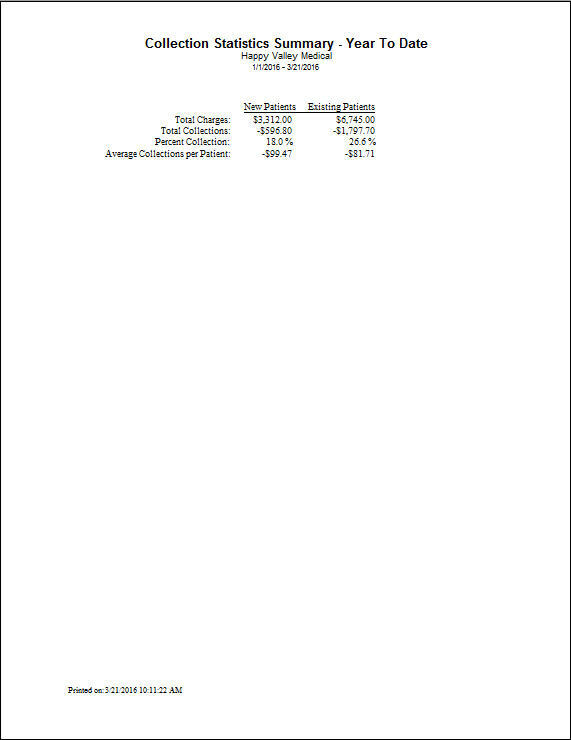 The report also includes three charts to show practice trends. 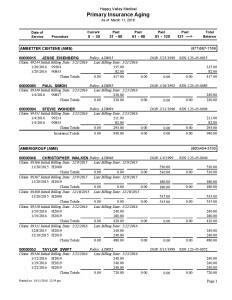 This report provides financial information for the practice in the prior calendar year. 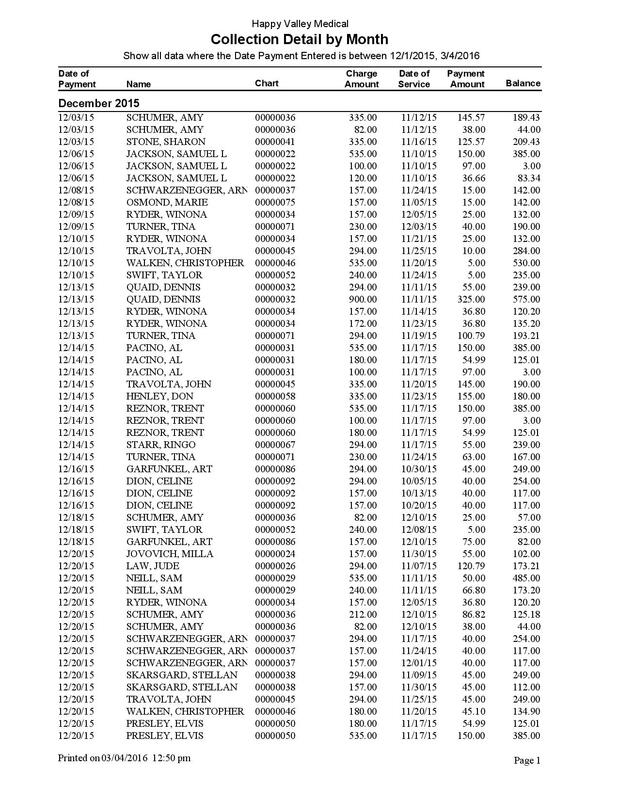 Charges are listed by month and then broken down to day of the month. 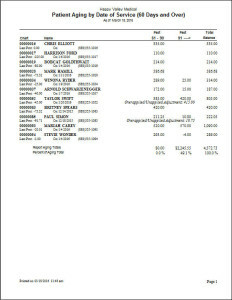 It include payments, adjustments, collections, and number of visits. 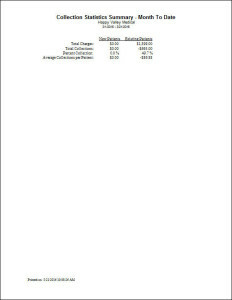 The report also includes three charts to show practice trends. 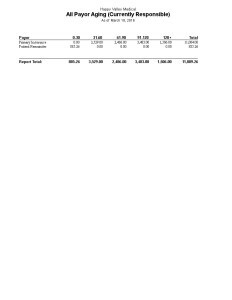 This report provides financial information for the practice in the last year to date. 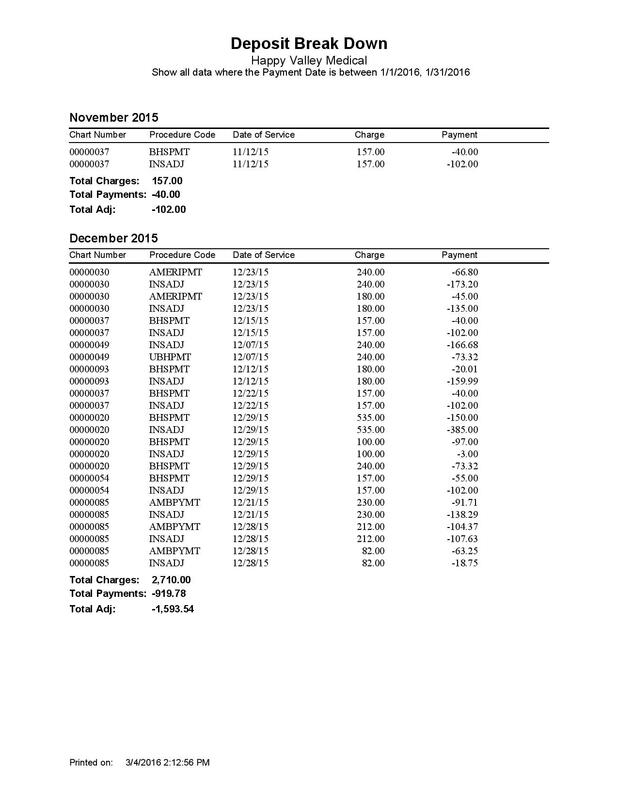 Charges are listed by month and then broken down to day of the month. 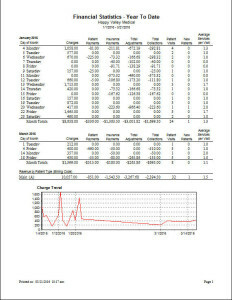 It include payments, adjustments, collections, and number of visits. The report also includes three charts to show practice trends. 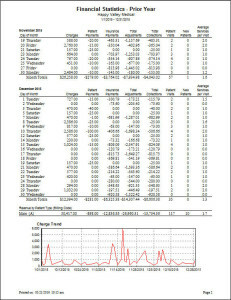 This report provides a consice summary of productivity in the last month to date. 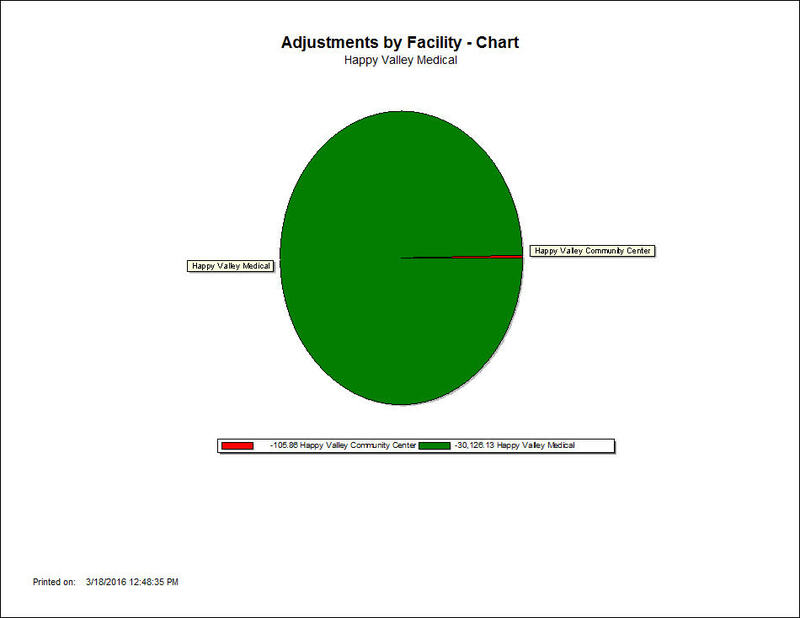 It shows the total visits, scheduled patients, missed appointments, new patients, and reactivated old patients. 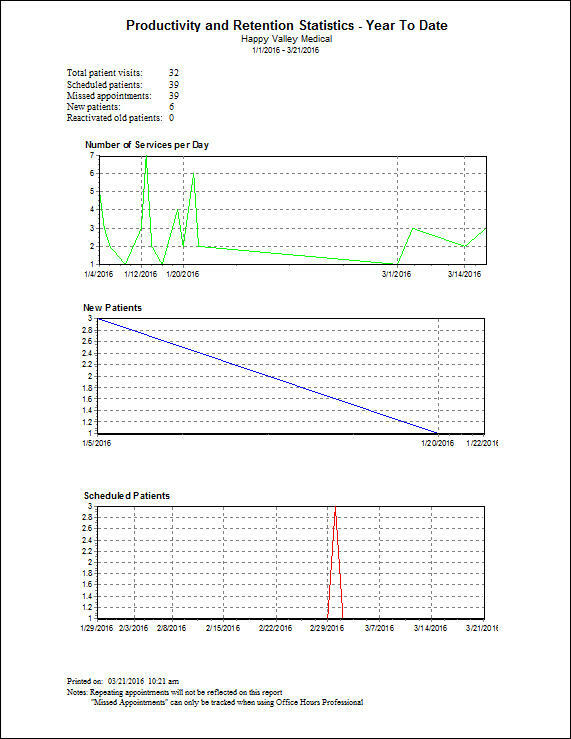 It also includes two charts to show the number of services per day, and the number of scheduled patients over the course of the month. 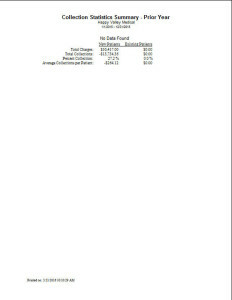 This report provides a consice summary of productivity in the last year to date. 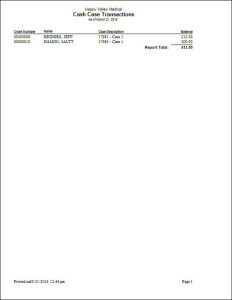 It shows the total visits, total scheduled appointments, missed appointments, new patients, and reactivated old patients. 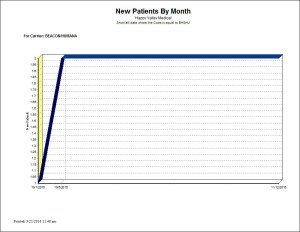 It also includes two charts to show the number of services per day, and the number of scheduled patients over the course of the year. 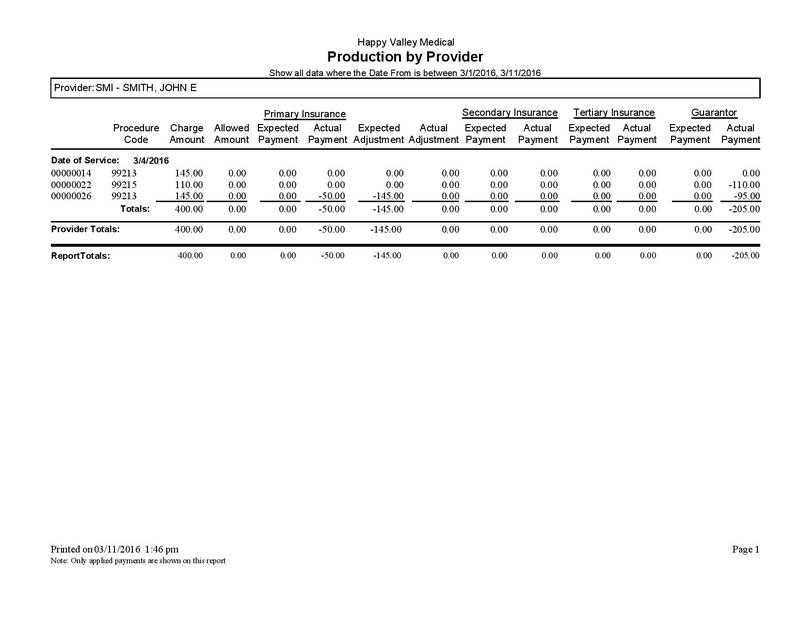 This report provides a consice summary of productivity in the last calendar year. 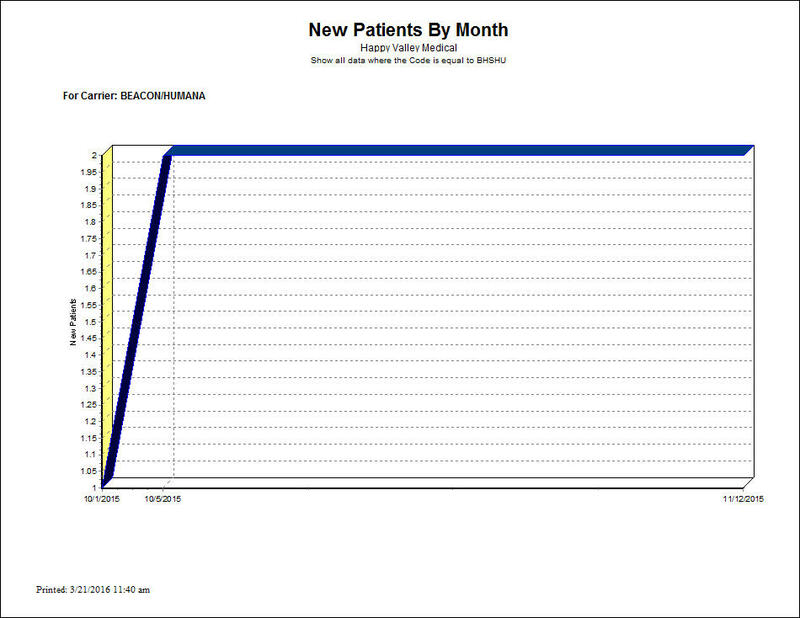 It shows the total visits, missed appointments, new patients, and reactivated old patients. 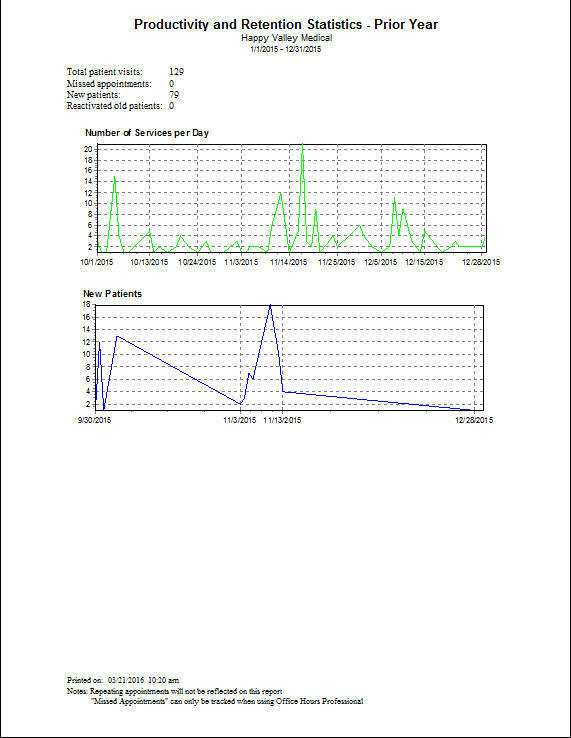 It also includes two charts to show the number of services per day, and the number of scheduled patients over the course of the year. 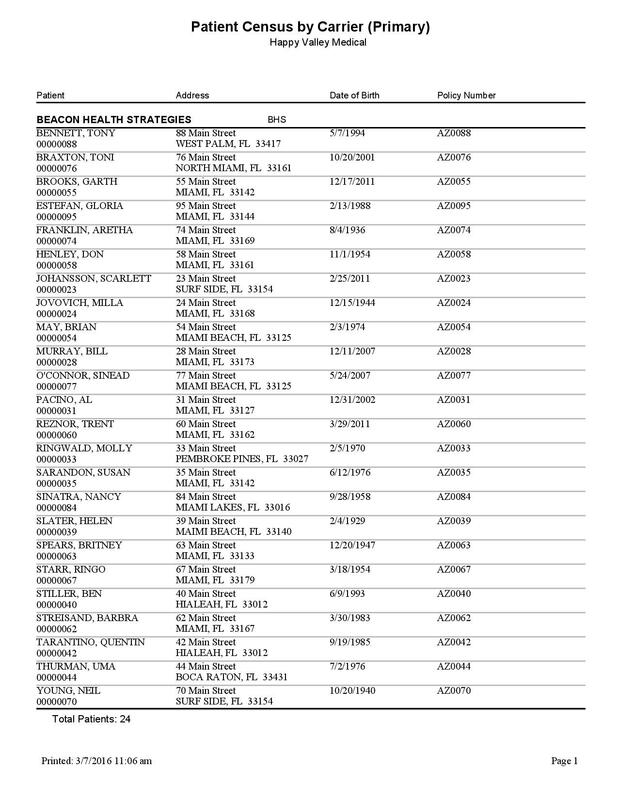 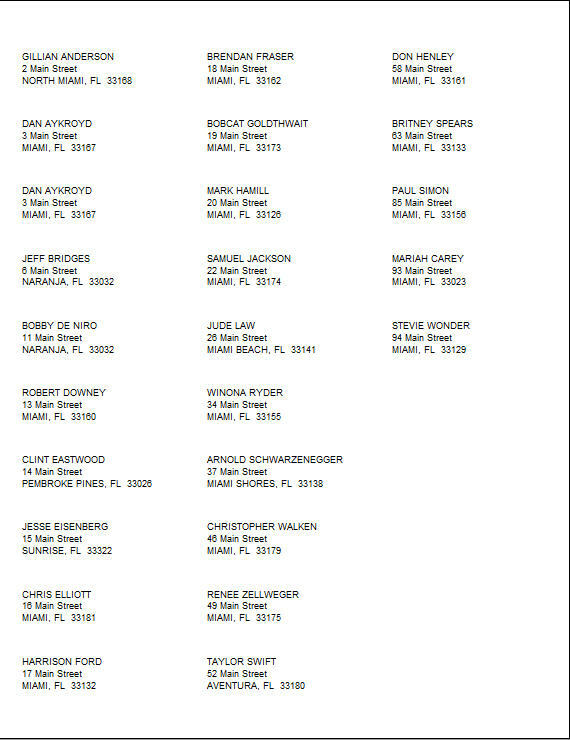 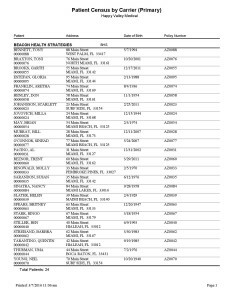 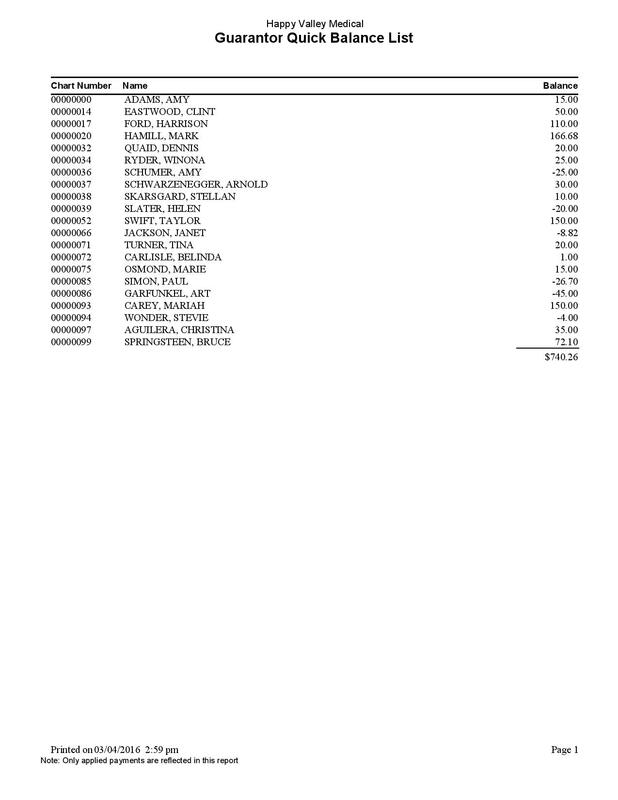 This report provides a list of all patients that have been seen that do not have any charges posted. This allows you to make sure each patient seen has charges posted on their account for that date of service. 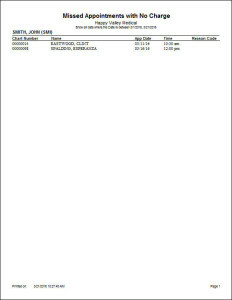 This report provides a list of all missed appointments for a specific date or date range that do not have any charges associated with the date of service. 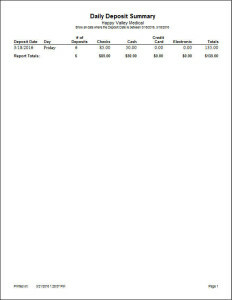 This is a good report to run if you want to make sure missed appointments are billed for a fee. 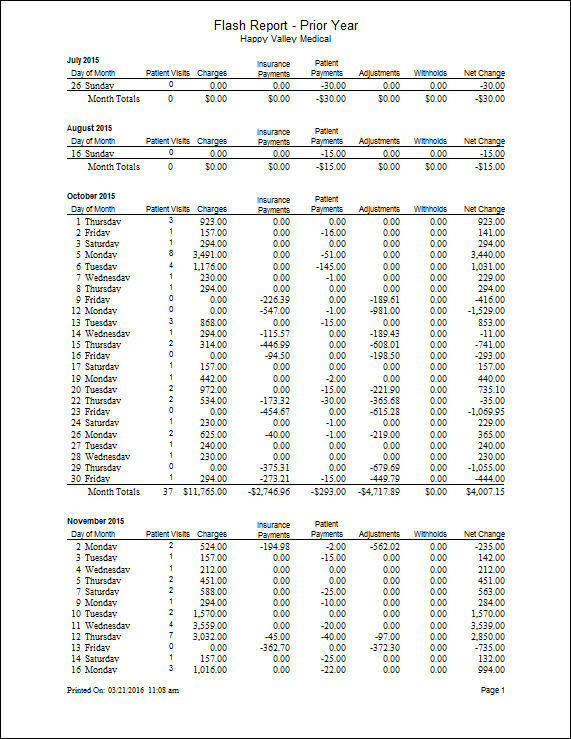 This report shows a summary of A/R information for each month. 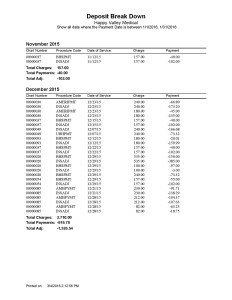 It includes charges, payments, adjustments, working days, average daily income, ending AR balance, and number of AR days for each month listed. 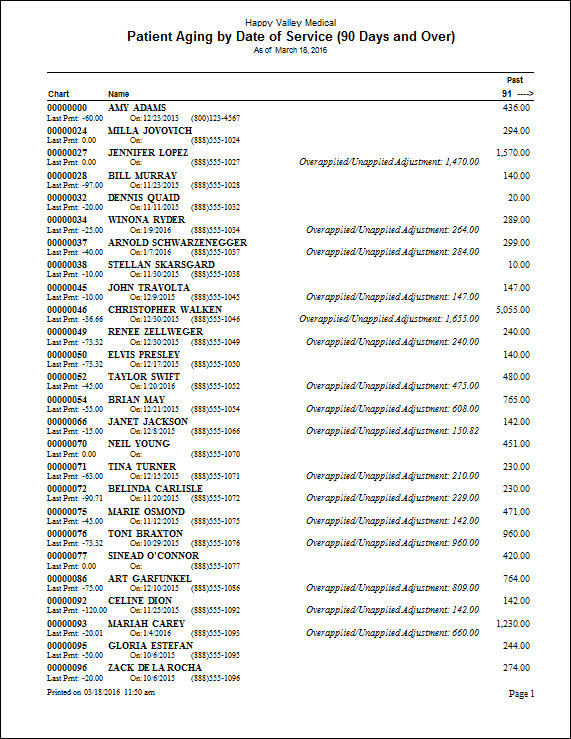 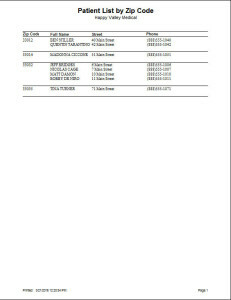 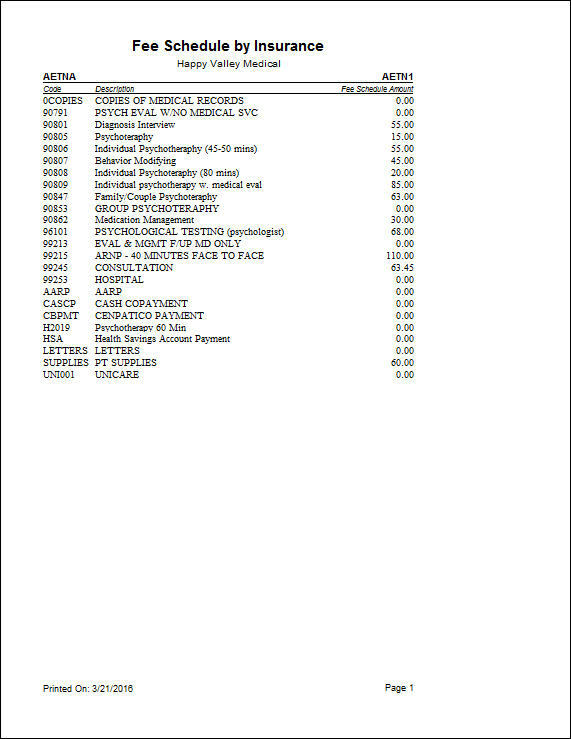 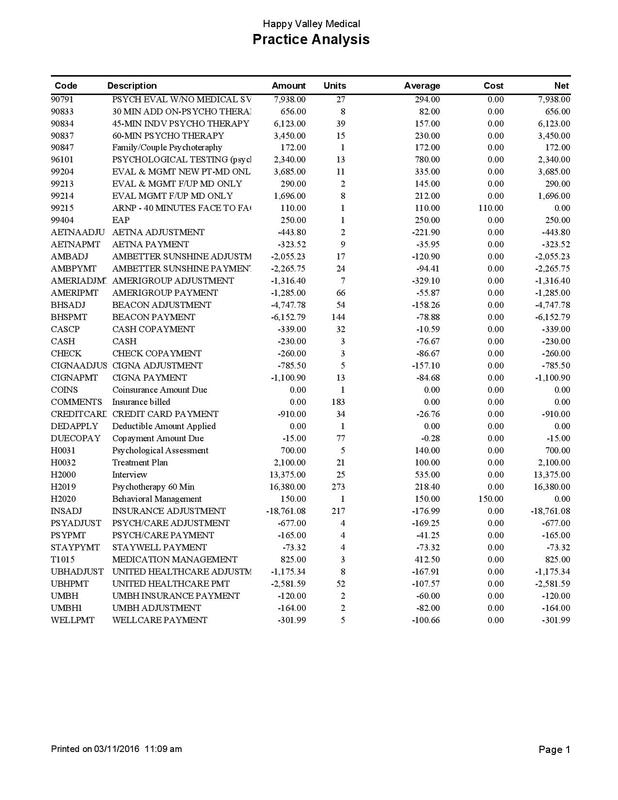 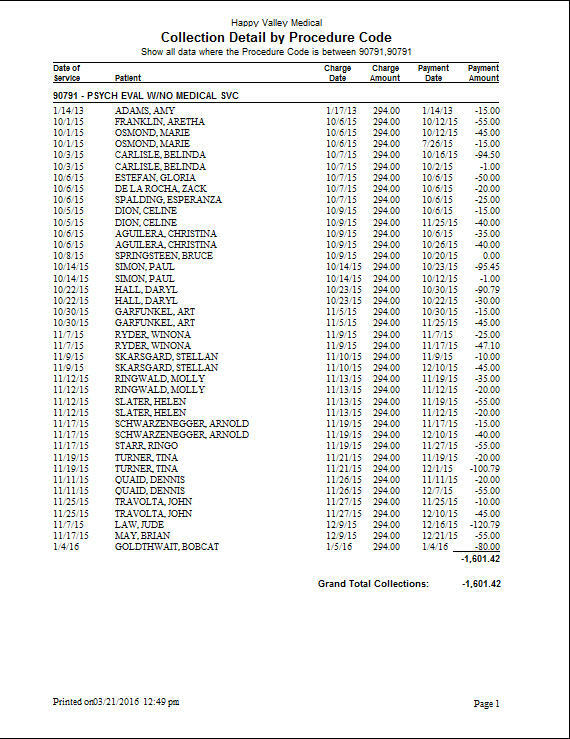 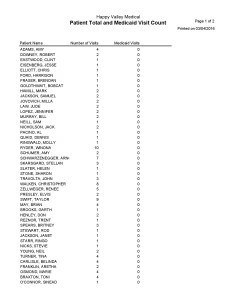 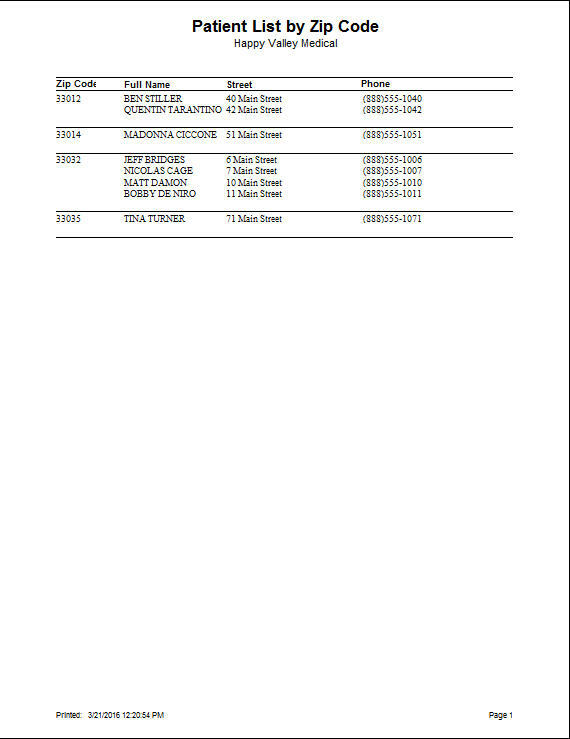 This report shows a list of patients that have outstanding balances but are not in the collections list. It provides the patient’s chart number, patient name, and balance for that account. The balances are totaled at the end of the report. 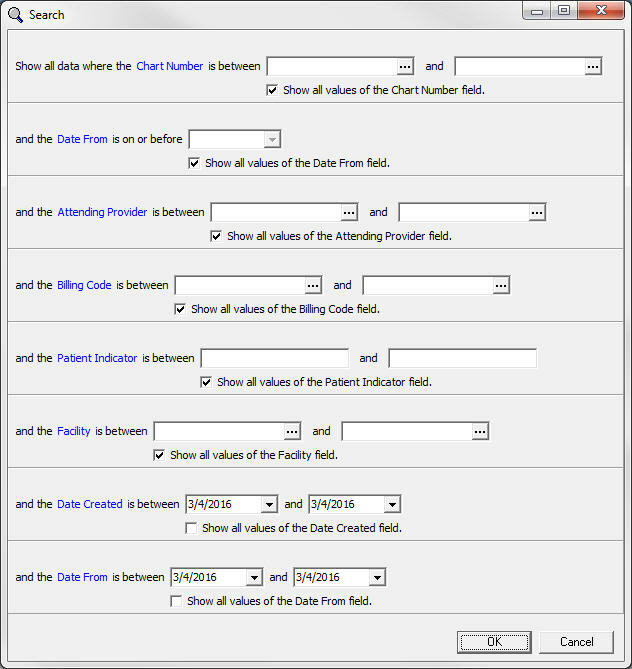 This report provides a patient list that have primary claims that are not marked done, with a zero patient remainder balance. 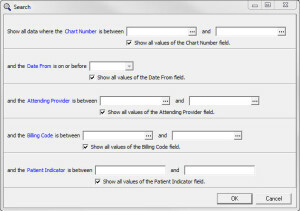 It lists the chart number, the patient’s insurance company, the claim number, case number, billing date, and the remainder amount. The Billing-Payment Status Report shows any Patient Reference balances for a selected date range. 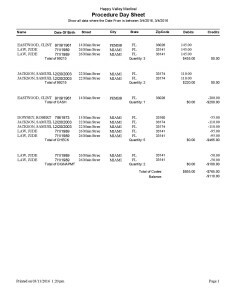 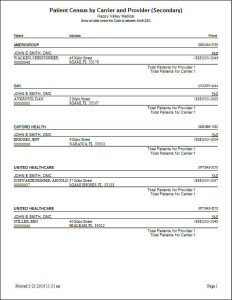 The report is broken down by patient and sorted by the chart number and includes the following details: the patient chart number, name, and phone number, case number, insurances, charge date, document number, procedure codes, amount charged, what was charged to or paid by the insurance or guarantor, adjustments, and the balance for each line item. 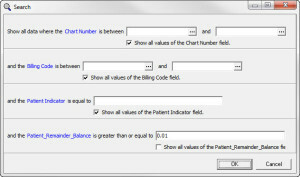 It will give a total for each patient reference balance, and a total of all balances listed on the report. 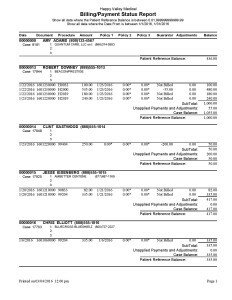 The Billing-Payment Status Report (All Balances) gives information on the charges for each patient, broken down by case. 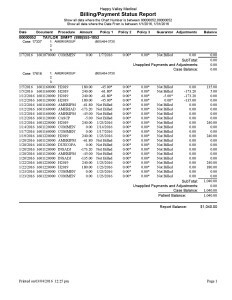 Under each case, you will be able to see the date of the transaction, the total amount, what was billed to the insurance(s) or guarantor, any adjustments that have been posted, and the final balance. 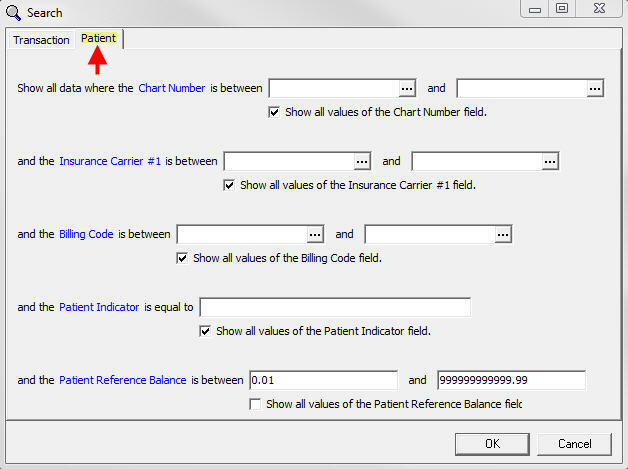 It will then total the line items to provide a Case Balance and a final Patient Balance. 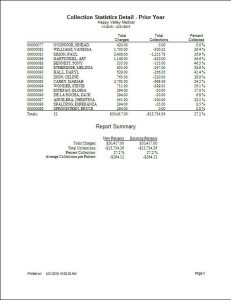 The report will also list a total Report Balance. 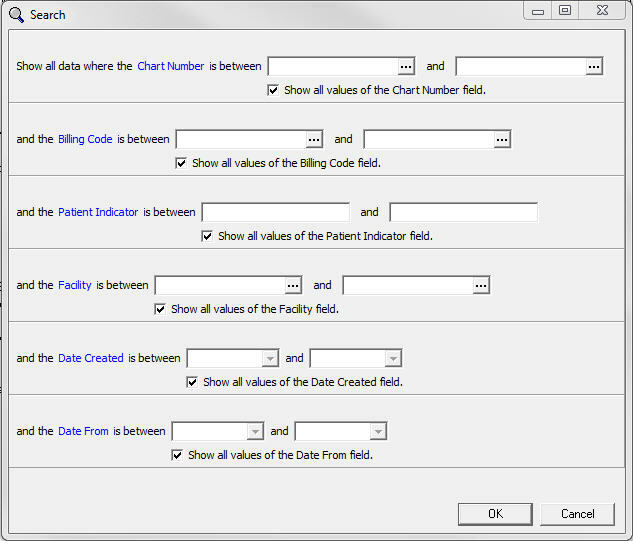 You can use various filters to narrow it down, for example you can filter the report for a specific patient or date range. The Billing-Payment Status Report (All Balances) Provider is the same report as the Billing-Payment Status Report (All Balances) with the addition of an additional filter for Assigned Provider. 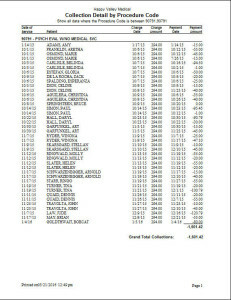 The Collection Detail by Month allows you to see the payments that have been received in a given month. 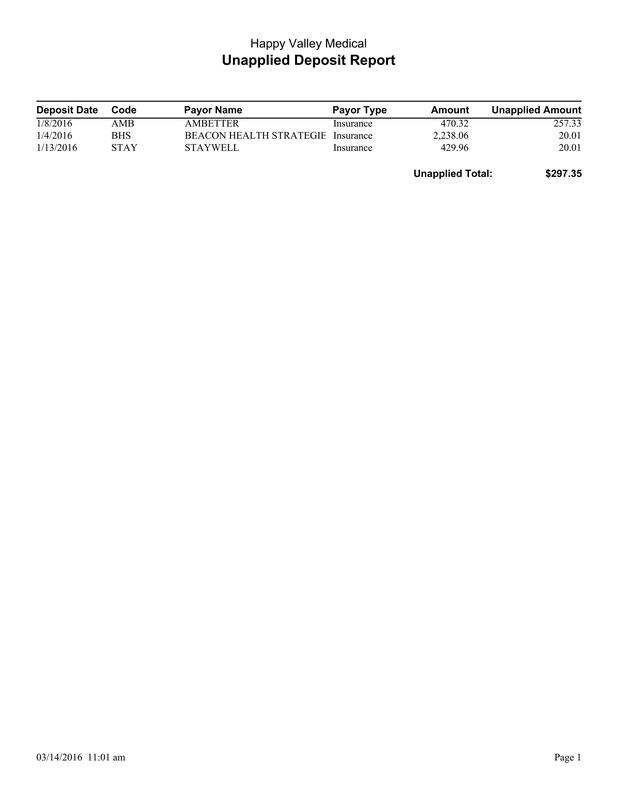 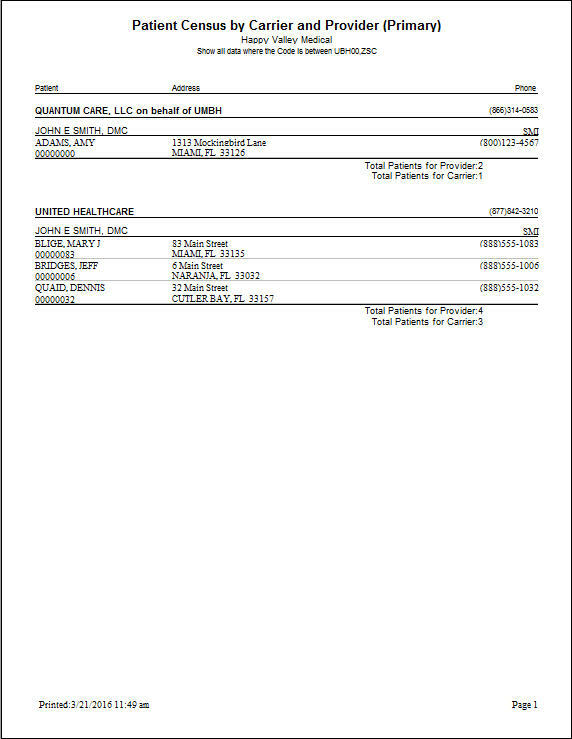 The report then lists the date of payment, patient name, chart number, original charge amount, date of service, payment amount, and the remaining balance. 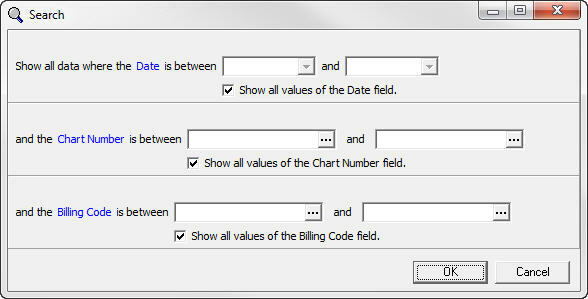 You can look at single or multiple months depending on the date range entered. 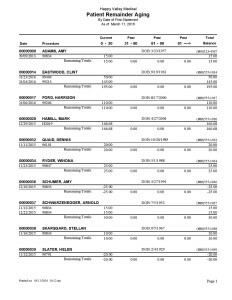 The Collections Report shows you a detailed breakdown of a patients account to see what has been billed and what has been paid or adjusted. Each line item that has been billed will list the date of service, the procedure, the amount billed, primary and secondary insurance payments, patient payments, and adjustments. 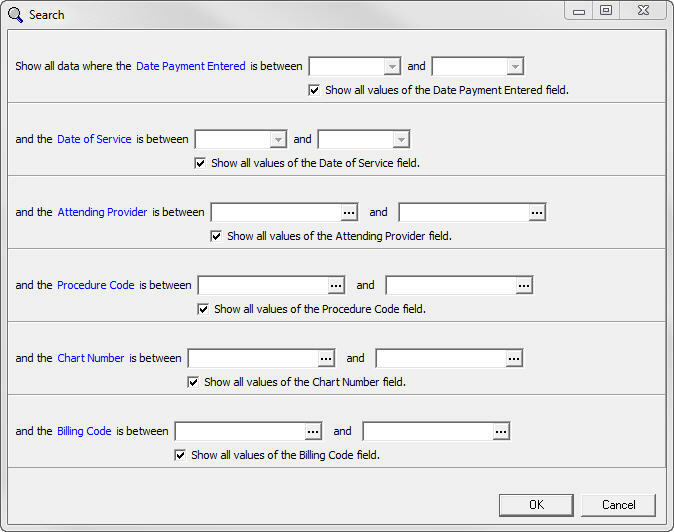 It will then total the charges, payments, and adjustments to provider you with a total collection balance. 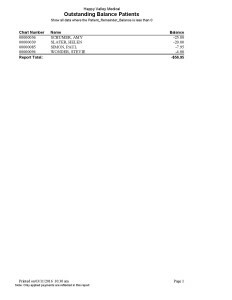 This report differs from the Patient Collection Report or Primary Insurance Collection Report in that it will give all line item details, not just the total owed. 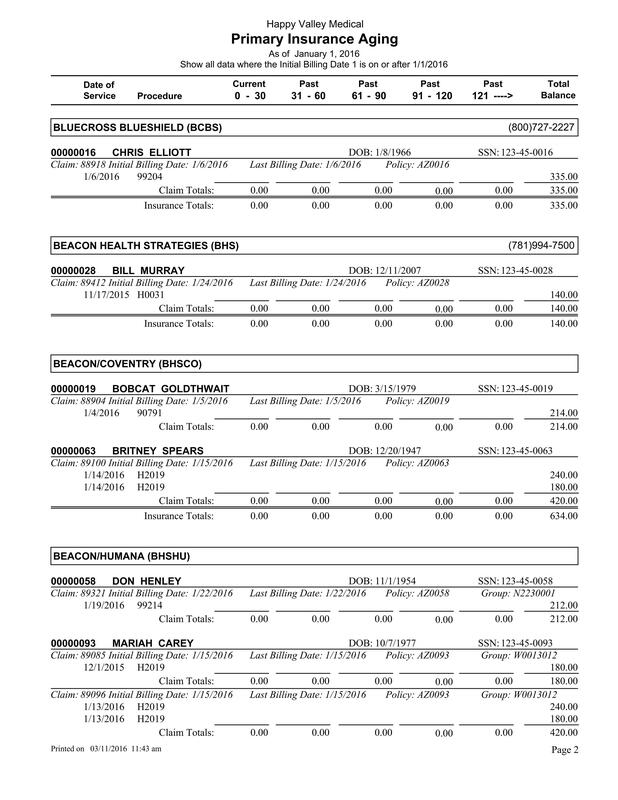 The Guarantor Quick Balance List shows the balance owed by each guarantor. 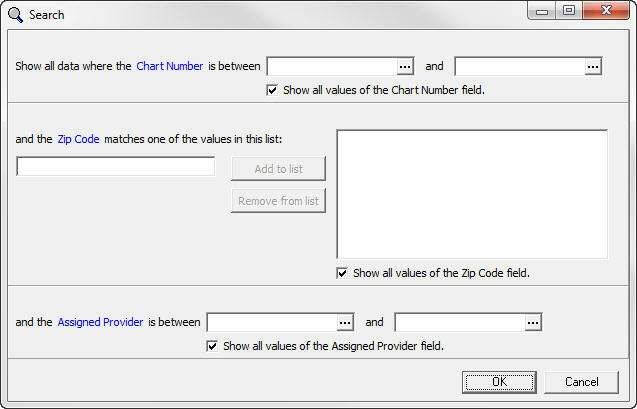 It indicates the chart number, name, and balance. 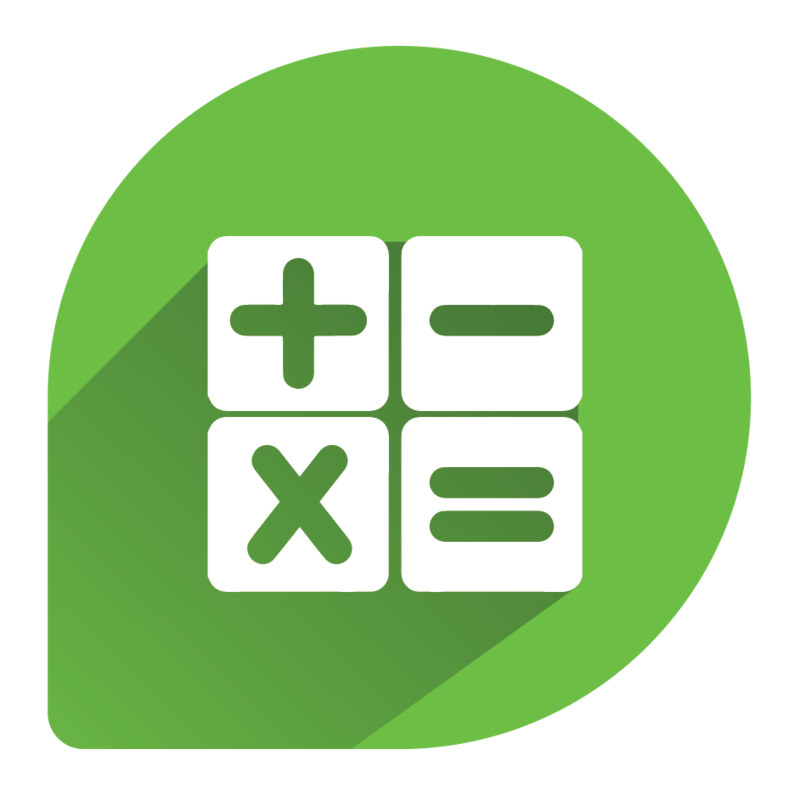 A total balance is also provided. 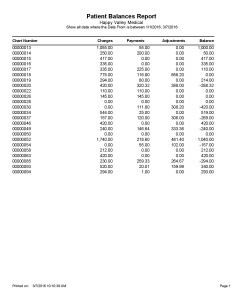 The Guarantor Quick Balance List – Amount report shows the same information as the Guarantor Quick Balance List, but it also allows you to filter the report by amount. 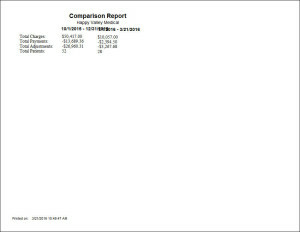 For example, if you only wanted to see balances that were more than $5.00, you could filter the report to show amounts between $5.00 and $99999. 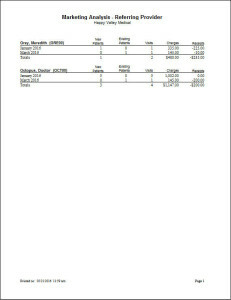 The Insurance Claim Status report is a quick report to show the claim status for one specific insurance. 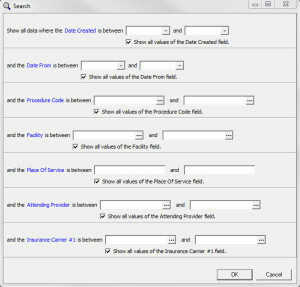 The insurance is selected in the filters and on the sample report provides numbers of how many claims are marked as Sent, Rejected, and Done. 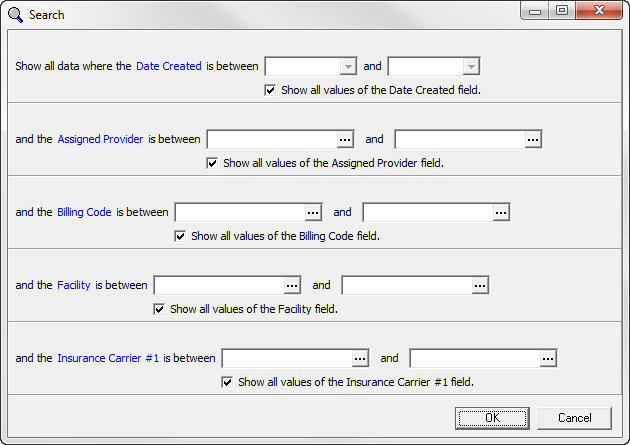 Other claim statuses might include Hold, Ready to Send, Challenge, Alert, Pending, or Dx Error. 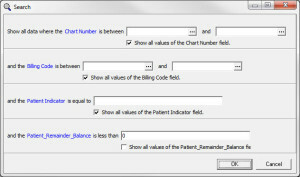 The Patient AR Balances report is a concise report that shows the patient balances for a specific date range. 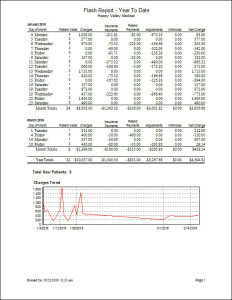 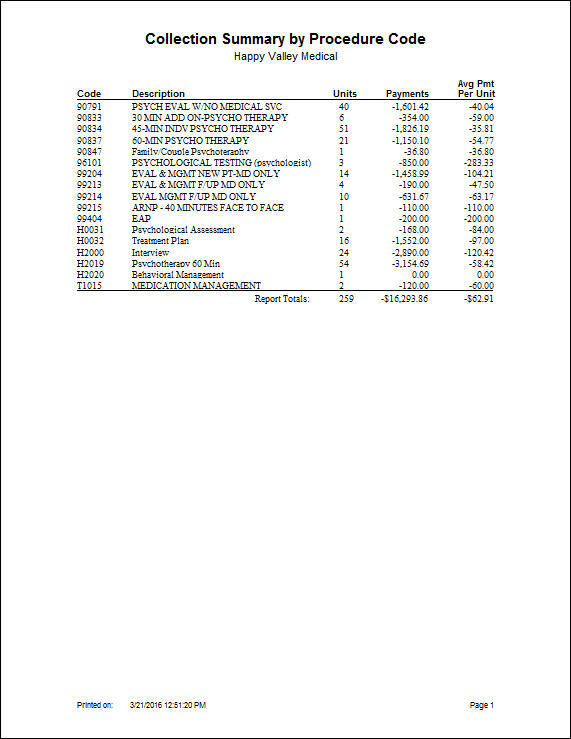 The sample report displays the patient chart number, charges, payments, adjustment, and final balance. 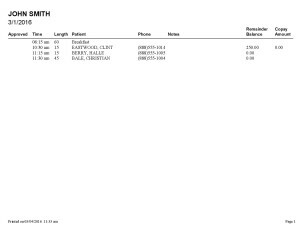 The Patients With Outstanding Balance (Not On Collection List) report gathers patients with an outstanding balance less than the entered amount. 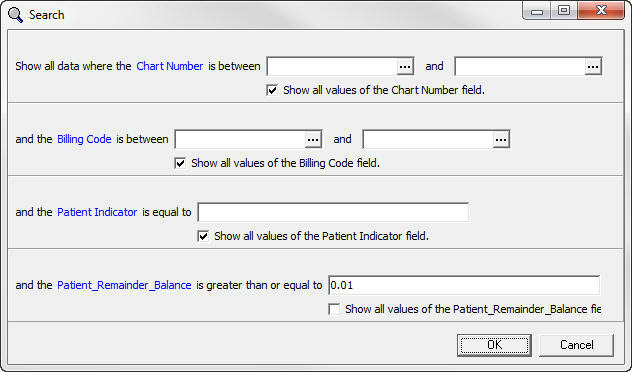 The report available in Medisoft allows you to filter the list by patients with a remainder balance greater than or equal to a specific amount. 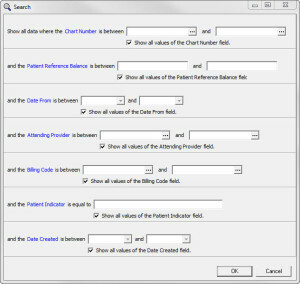 This report allows you to search for any patients with a remainder balance less than a certain amount. 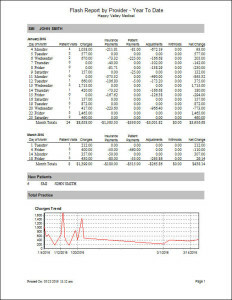 For example, the sample report was for patients with a remainder balance less than zero (credit). 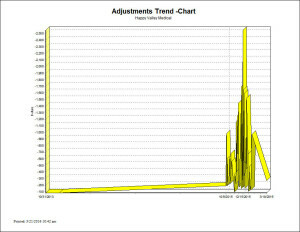 This report shows the trend of adjustments for the practice. 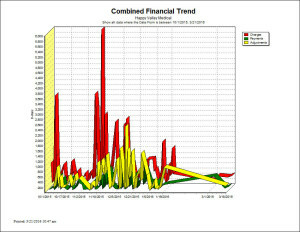 It will show if there has been an increase or decrease in adjustment amounts, or will show what time of year adjustments are most prevalent. 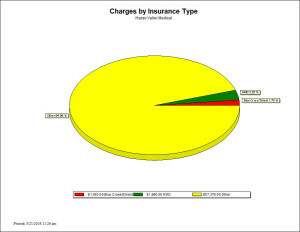 This report shows the trends in charges posted for the practice. 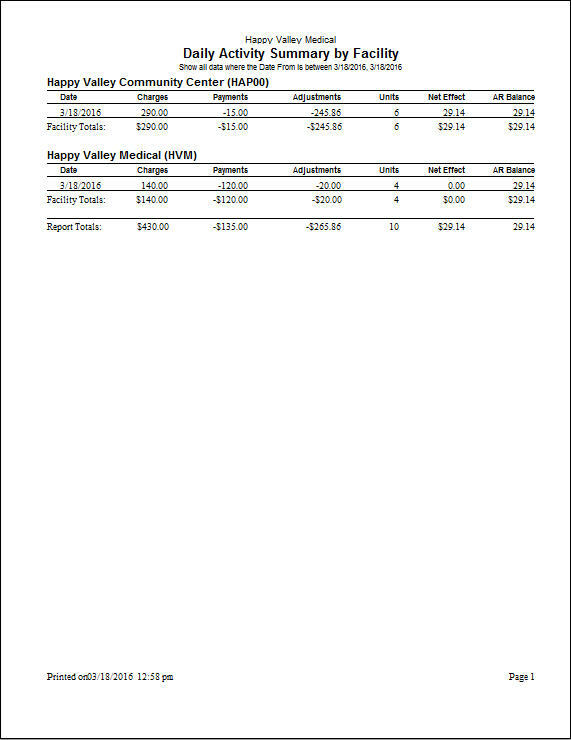 It will provide information on when the most charges are being billed. 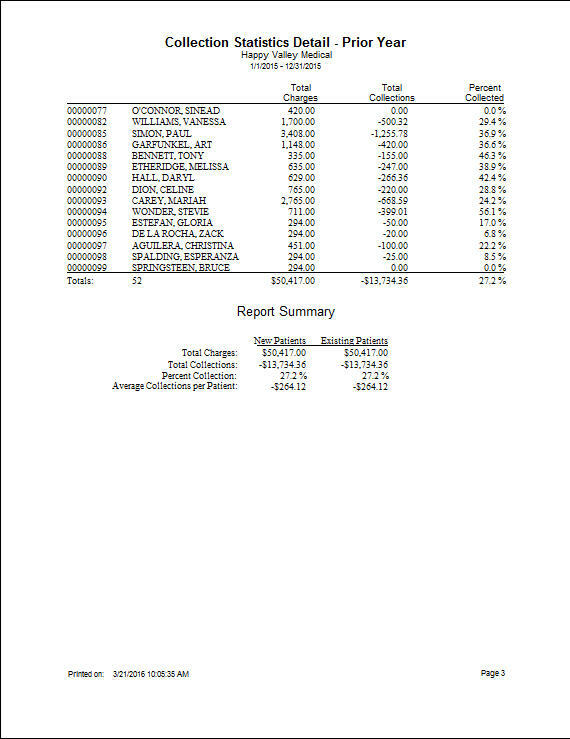 This report shows the trends in charges, payments, and adjustments posted for the practice. 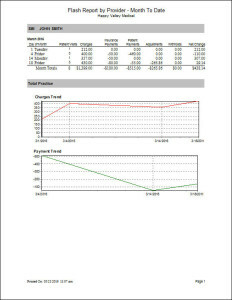 It provides a graphical summary of the A/R within a given time frame. 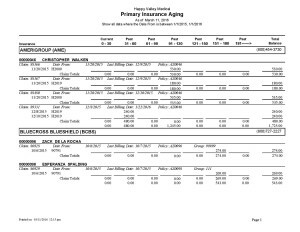 This report shows the comparison of charges, payments, adjustments, and patients seen within two separate time frames. 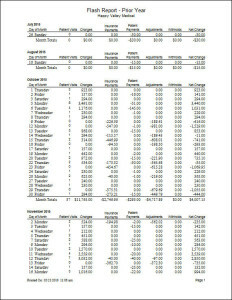 This is a good report to use to compare the practice A/R activity between months, years, or more specific date ranges. 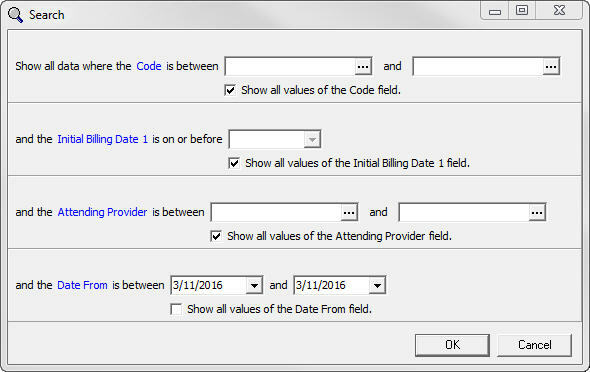 This report provides a detailed breakdown of each patient a provider has seen for a specific date or date range. 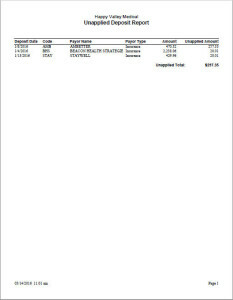 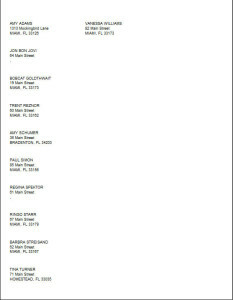 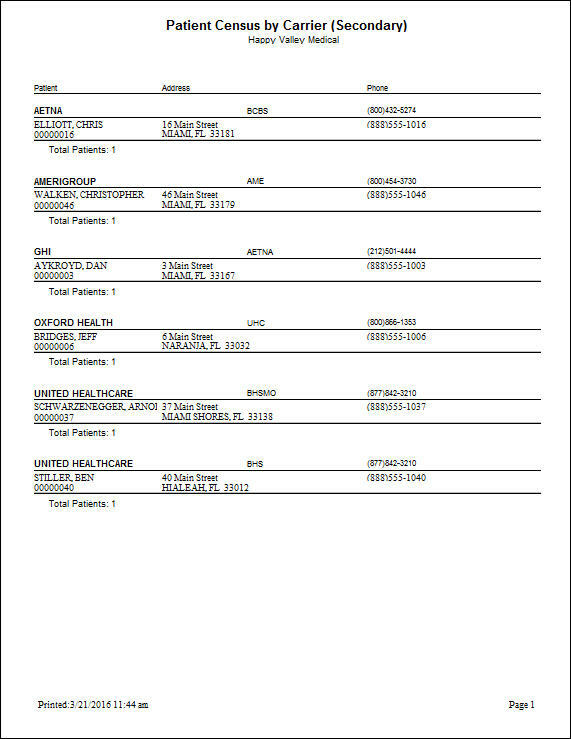 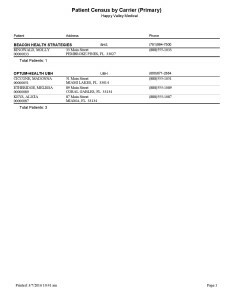 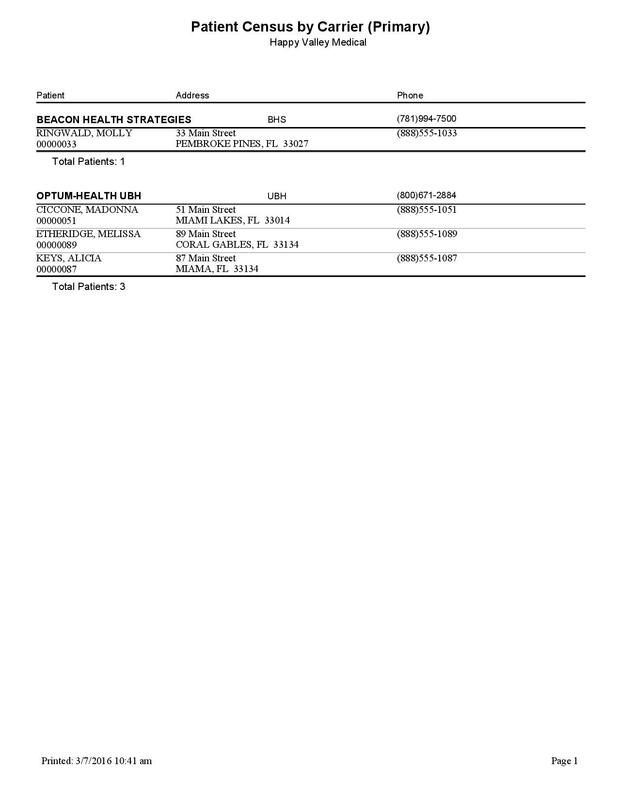 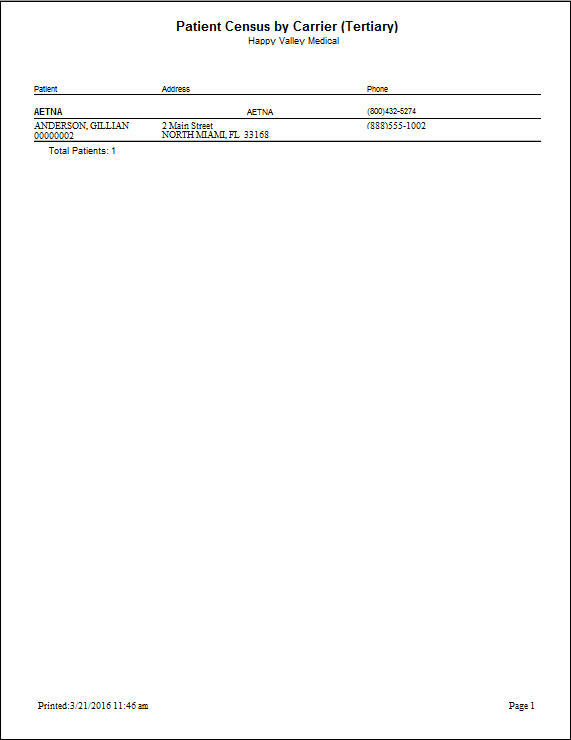 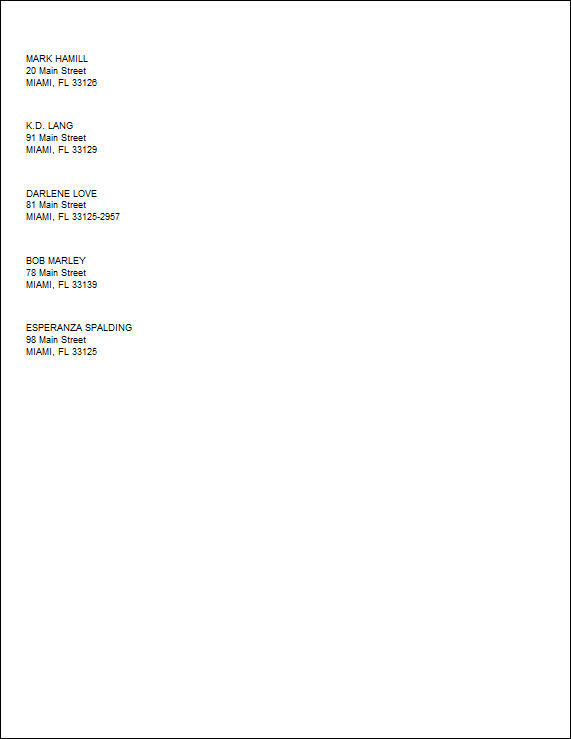 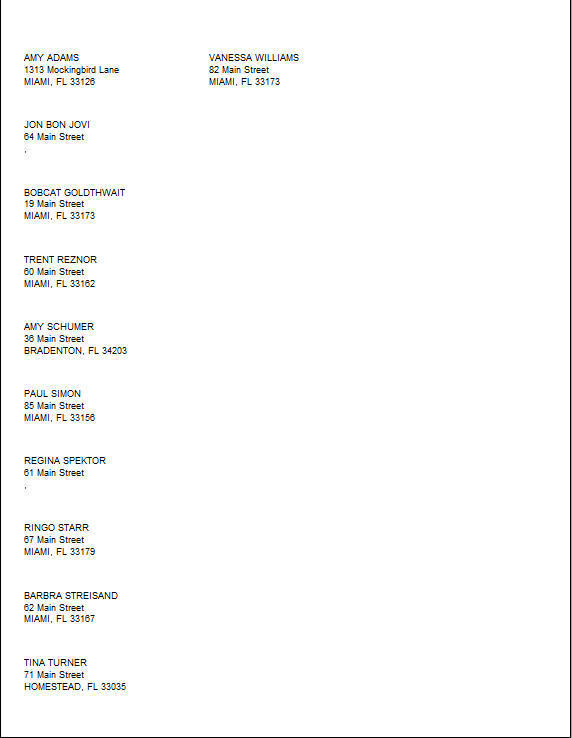 It shows the patient name, date of service, chart number, document number, code billed, units, and amount. 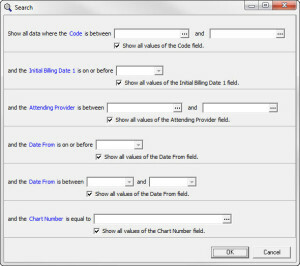 This report provides a summary of patients seen by a provider on a specific date or date range. 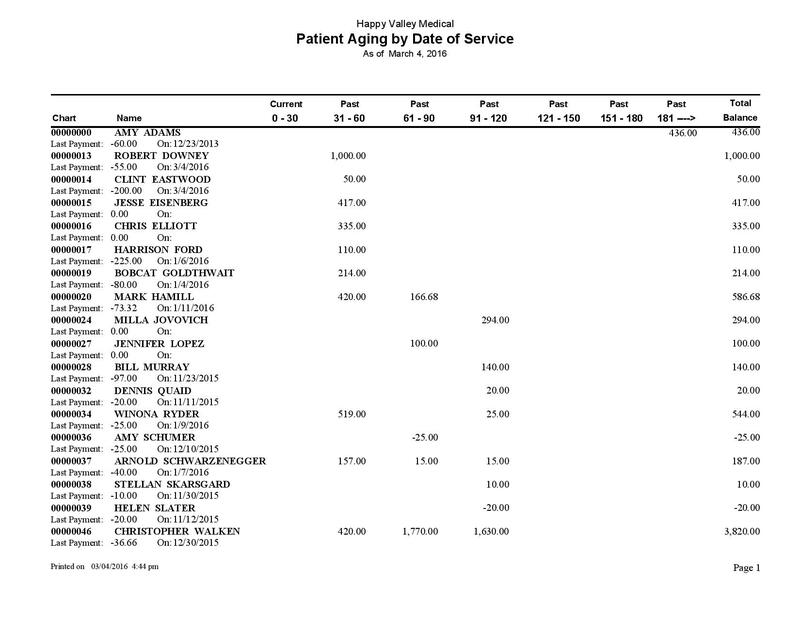 Each patient seen is listed, but only once, regardless of the number of procedures billed. The reports shows the patient name, chart number, charges, payments, adjustments, and patient totals. 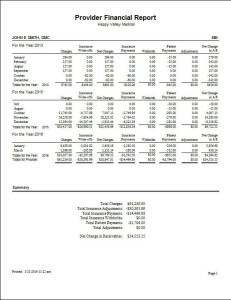 This report provides financial information for the practice for a specific date or date range. 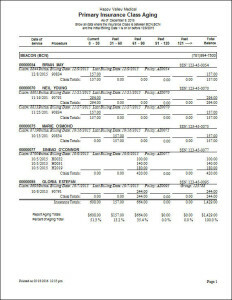 Charges are listed by the day of the month, and include payments, adjustments, collections, and number of visits. The report also includes charts of charges and payment trends. 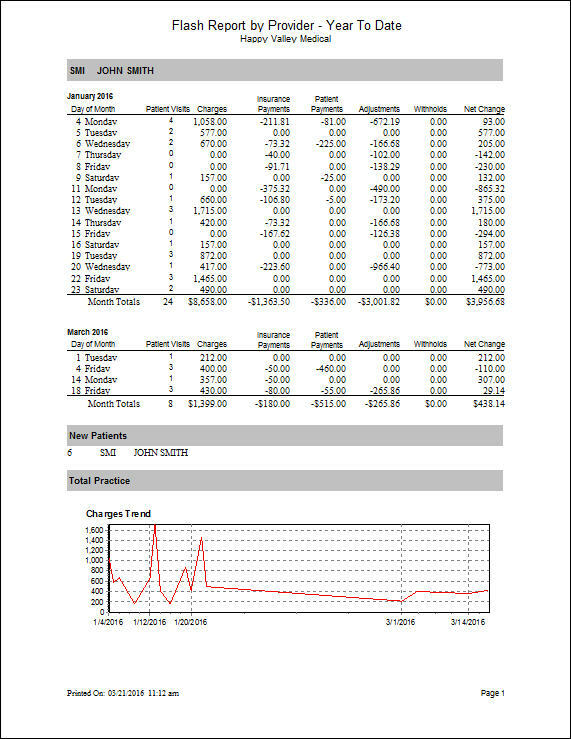 This report provides financial information for the practice for the current month. 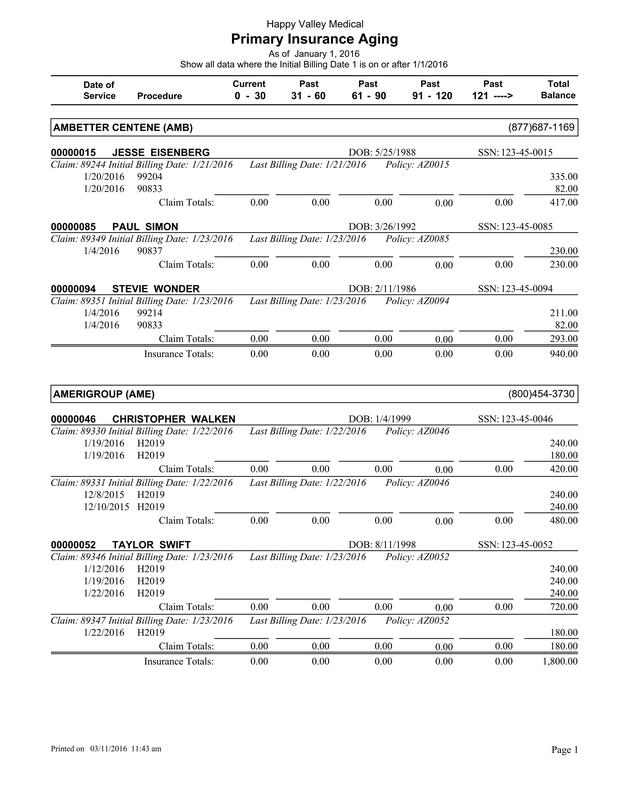 Charges are listed by the day of the month, and include payments, adjustments, collections, and number of visits. 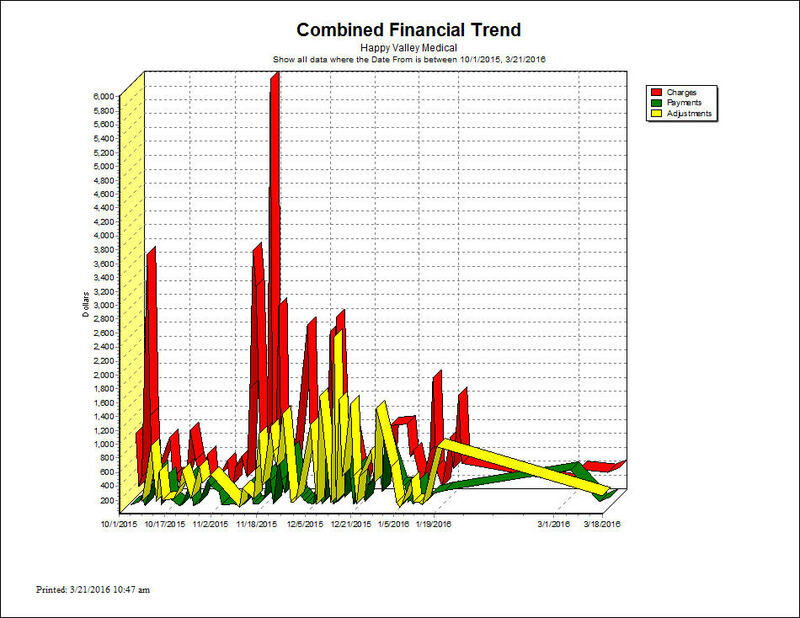 The report also includes charts of charges and payment trends. 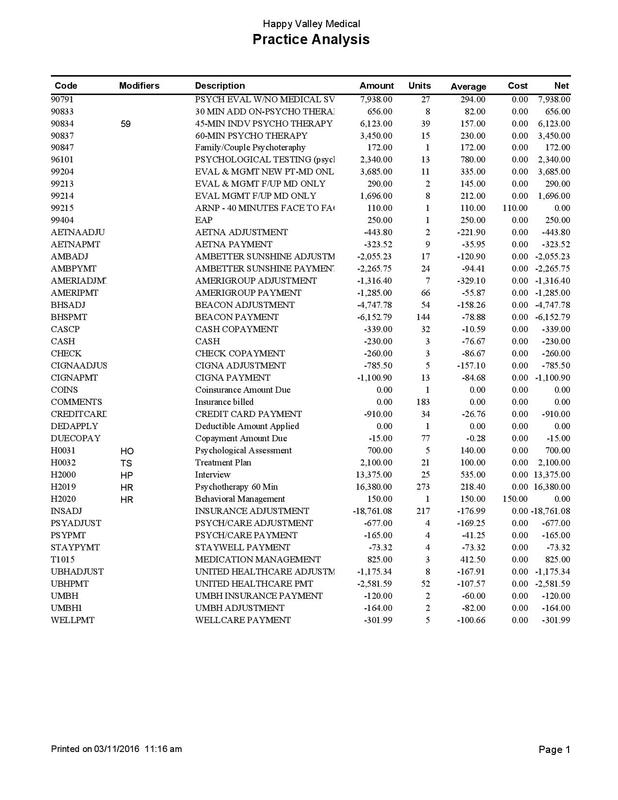 This report provides financial information for each provider for the current month. 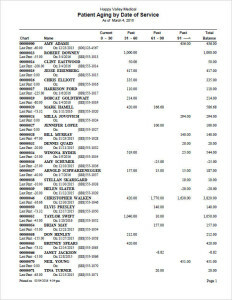 Charges are listed by the day of the month, and include payments, adjustments, collections, and number of visits. 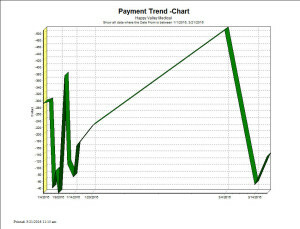 The report also includes charts of charges and payment trends. 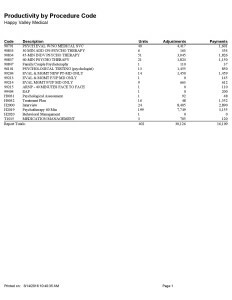 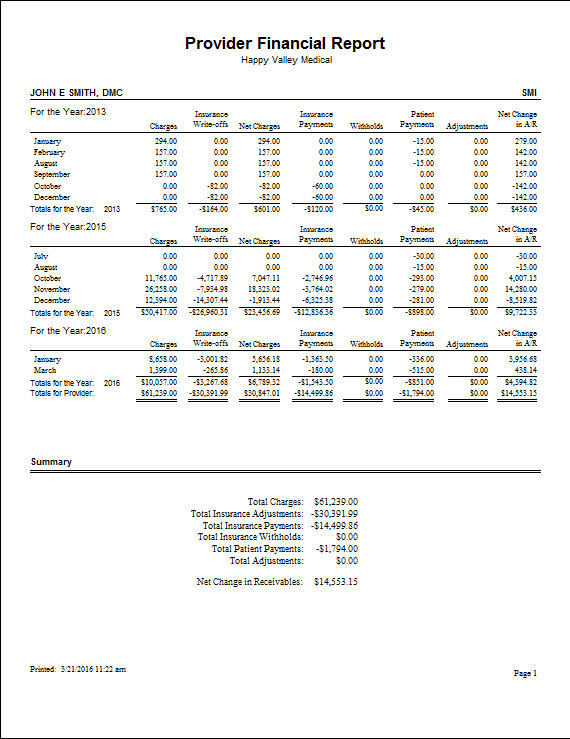 This report provides financial information for the prior year. 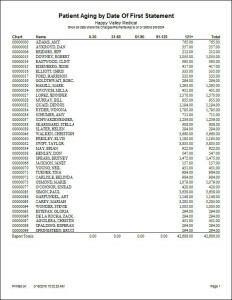 Charges are listed by the day of the month, and include payments, adjustments, collections, and number of visits. 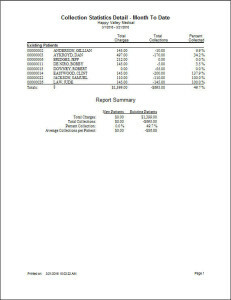 The report also includes charts of charges and payment trends. 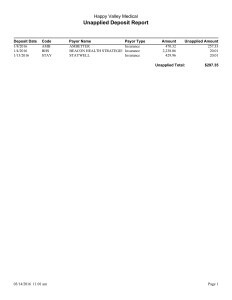 This report provides financial information for the prior year organized by provider. 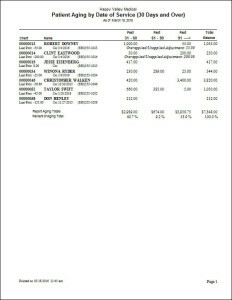 Charges are listed by the day of the month, and include payments, adjustments, collections, and number of visits. 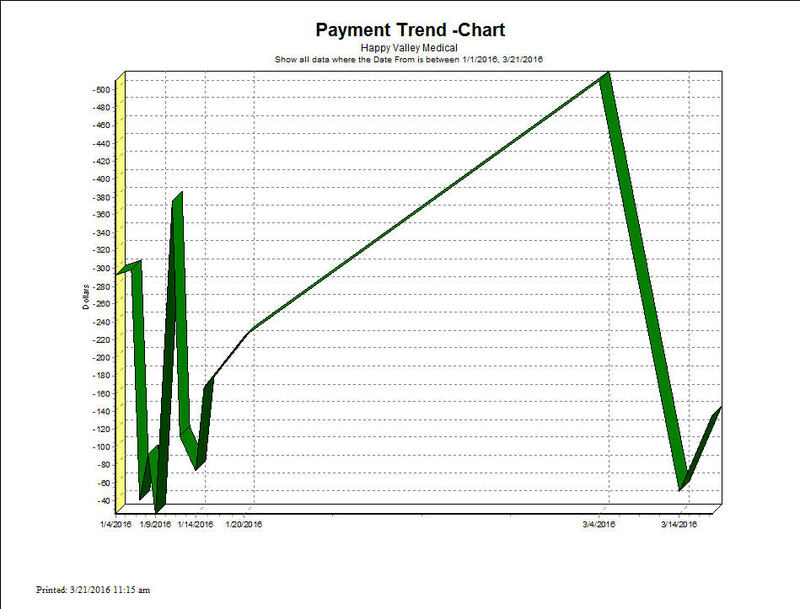 The report also includes charts of charges and payment trends. 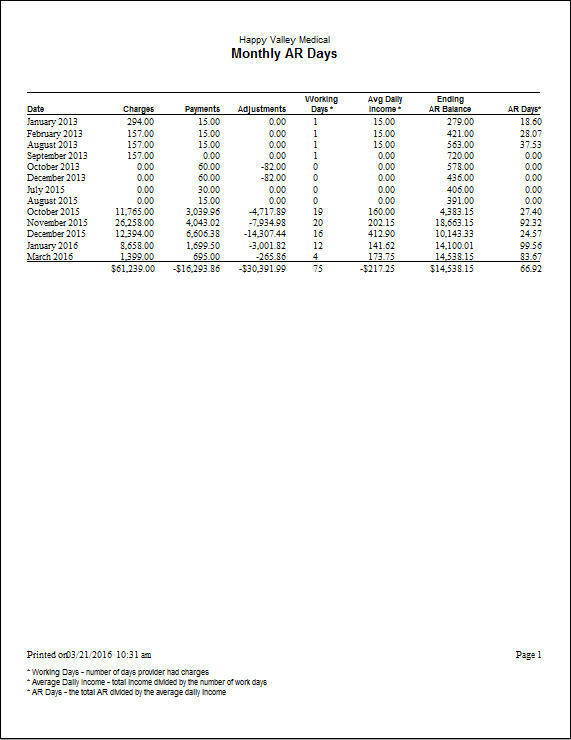 This report provides financial information for the current year to date. 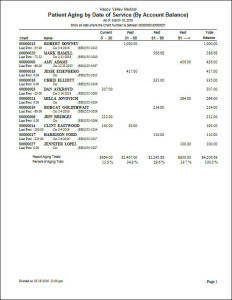 Charges are listed by the day of the month, and include payments, adjustments, collections, and number of visits. 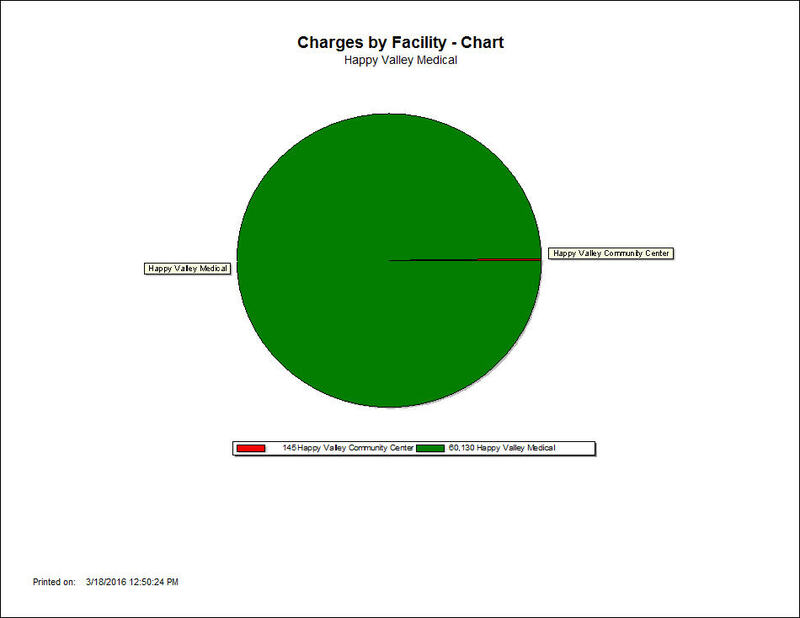 The report also includes charts of charges and payment trends. 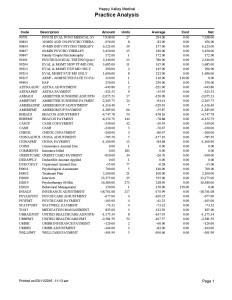 This report provides financial information for the current year to date organized by provider. 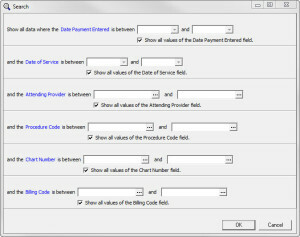 Charges are listed by the day of the month, and include payments, adjustments, collections, and number of visits. 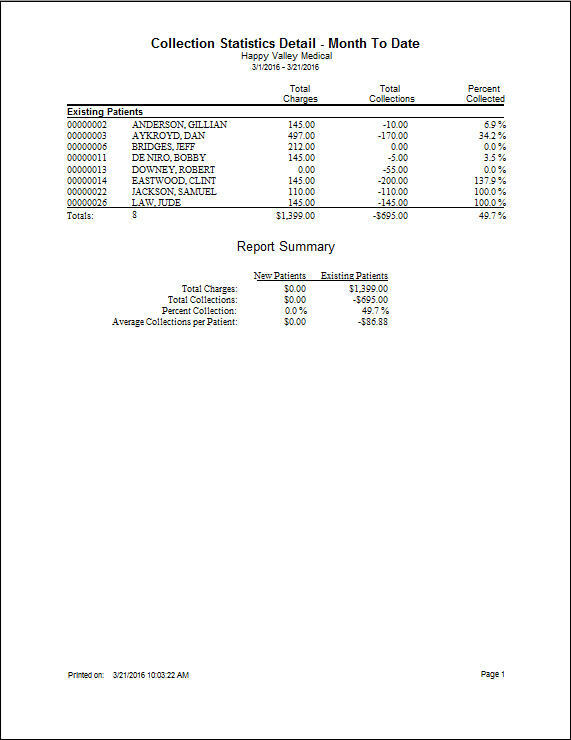 The report also includes charts of charges and payment trends. 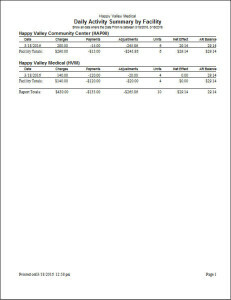 This report provides financial information for the a specific time frame organized by provider. 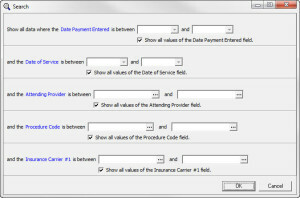 Charges are listed by the day of the month, and include payments, adjustments, collections, and number of visits. 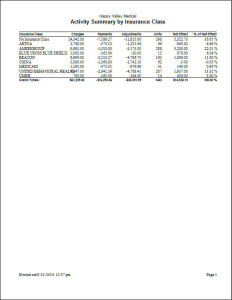 The report also includes charts of charges and payment trends. 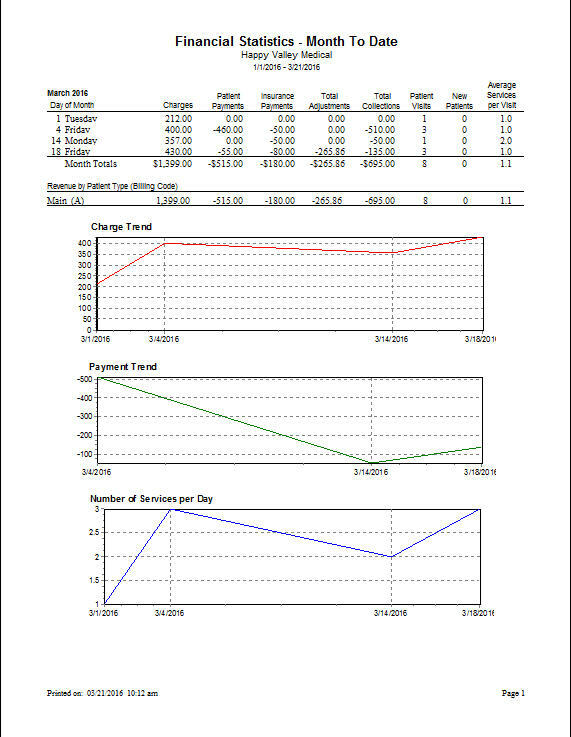 This report provides a graphical display of payments collected within a specific time frame. 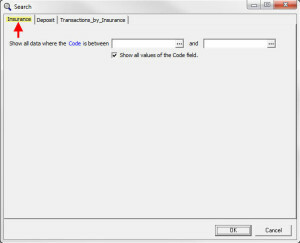 This allows you to see during what time periods you are collecting the most payments. 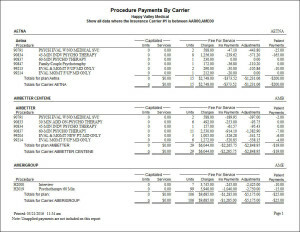 This report provides information on the practice financials by provider. 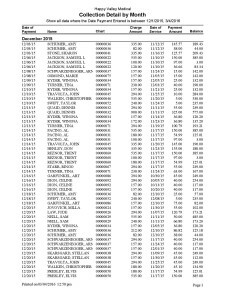 Each provider is listed and for each year, the report displays how many charges were posted each month, and the total for each year, and then totaled for each provider. 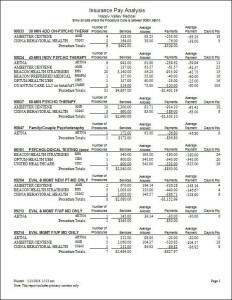 The Productivity by Insurance Class report includes a summary of all charges, payments, and adjustments from each insurance class. 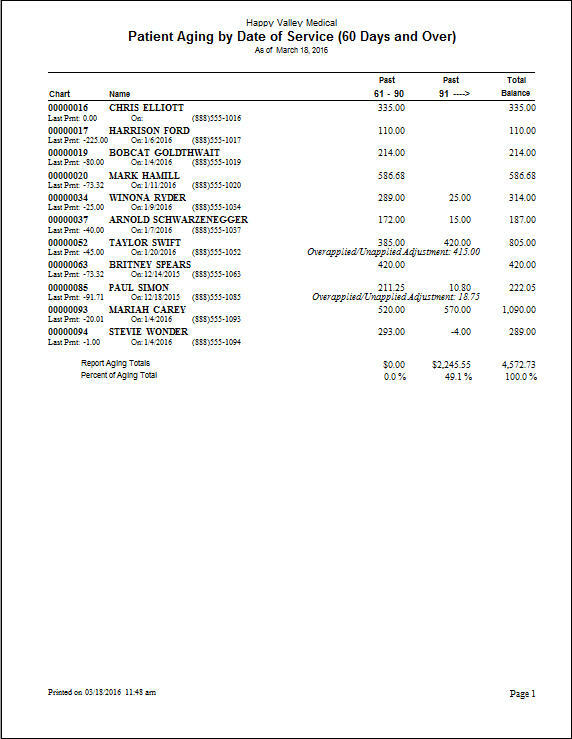 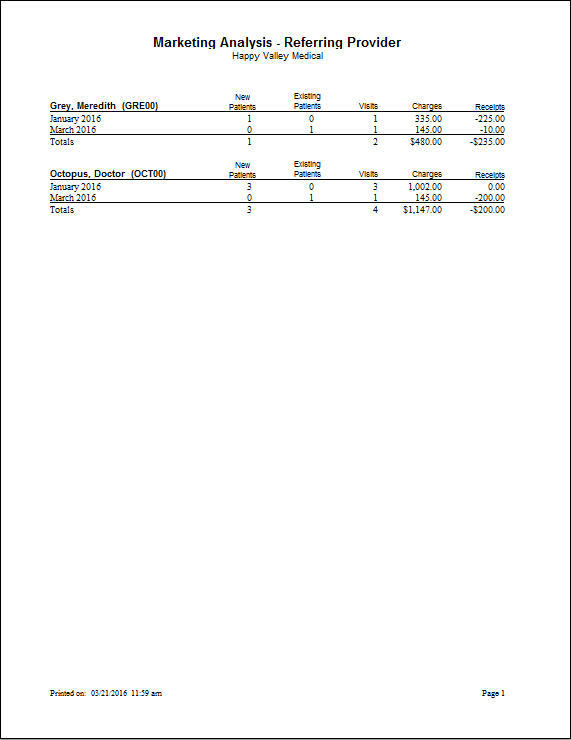 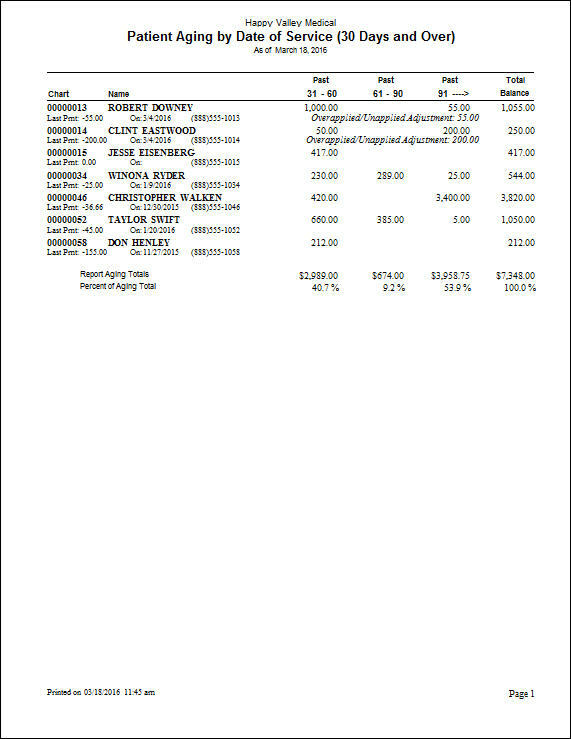 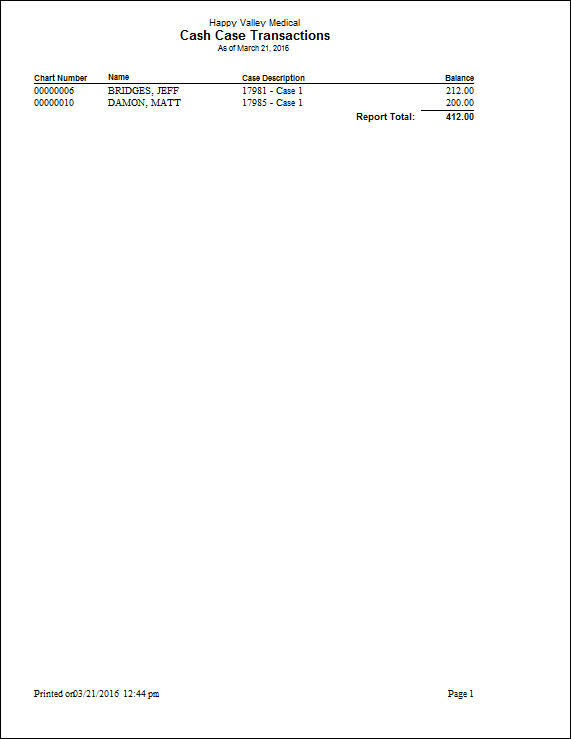 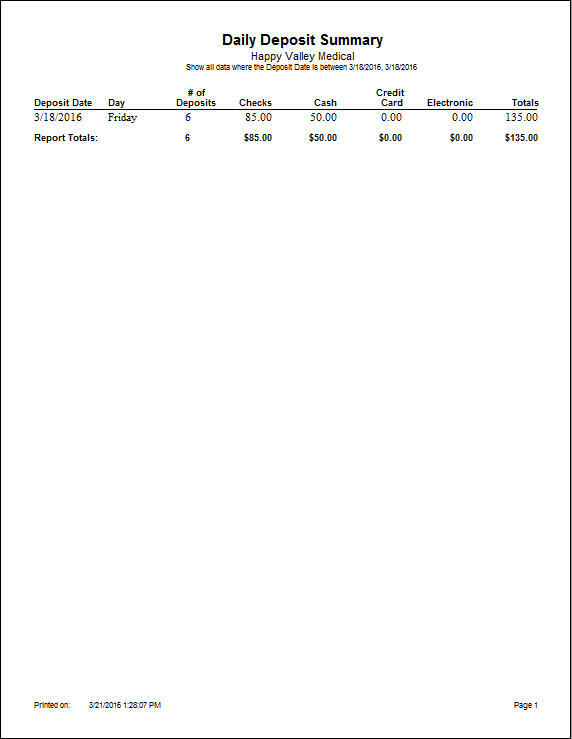 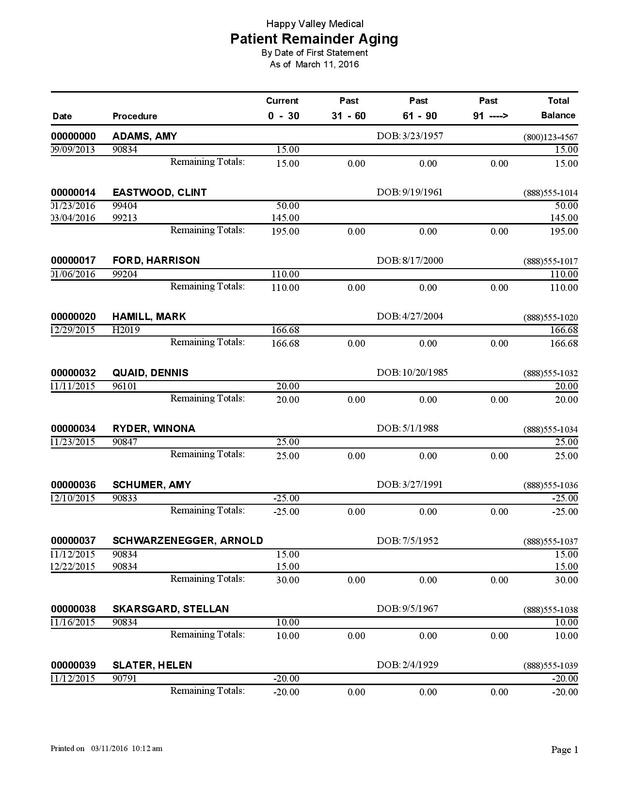 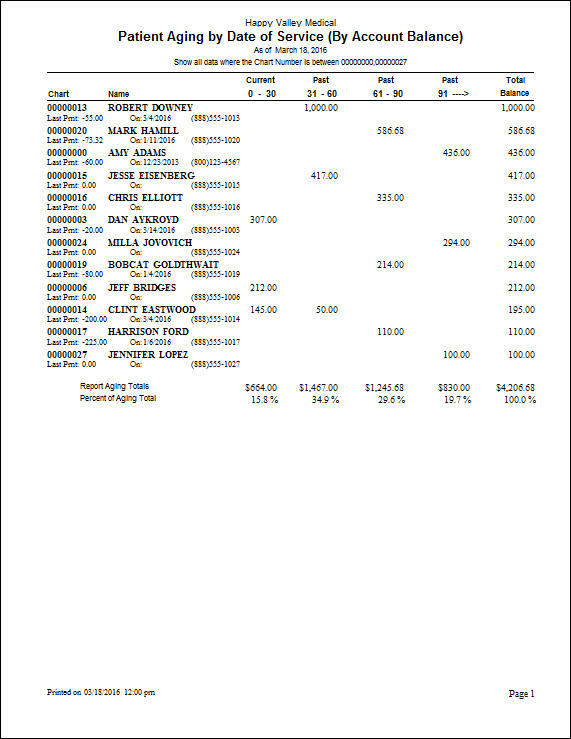 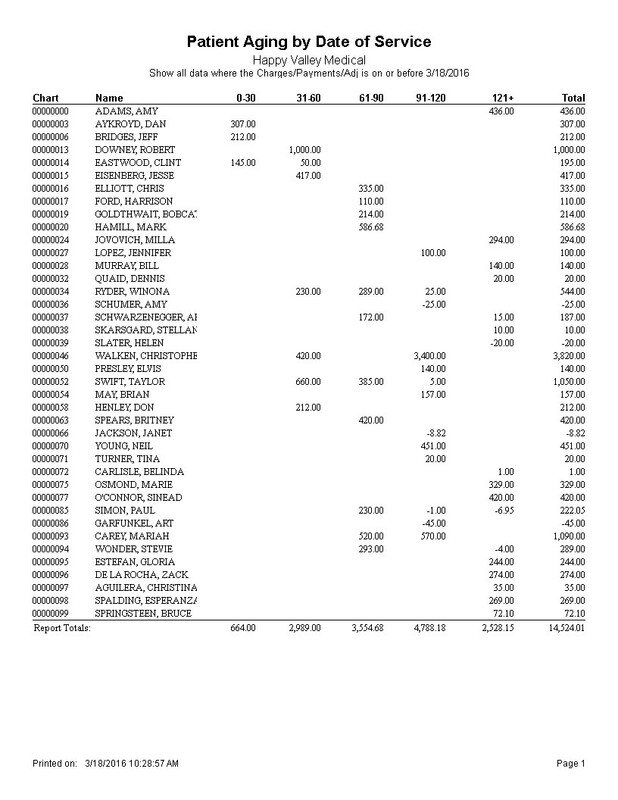 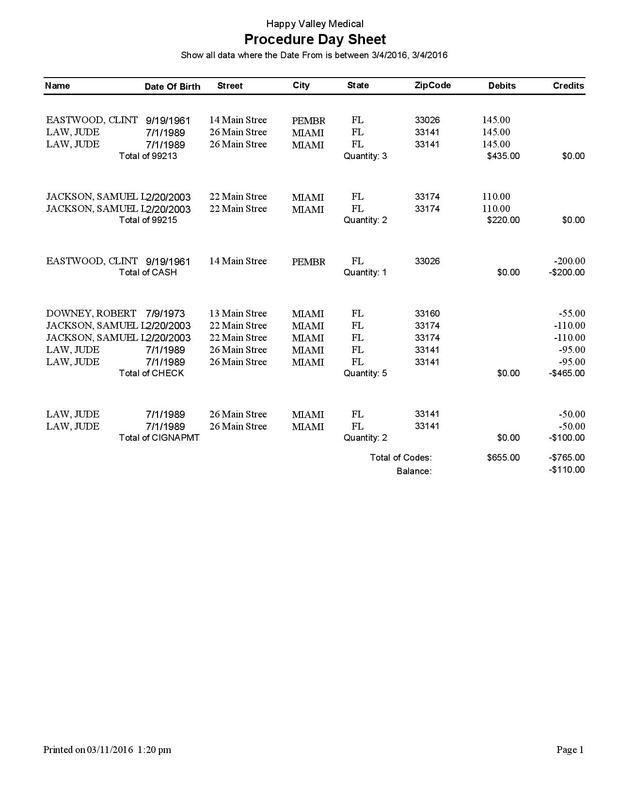 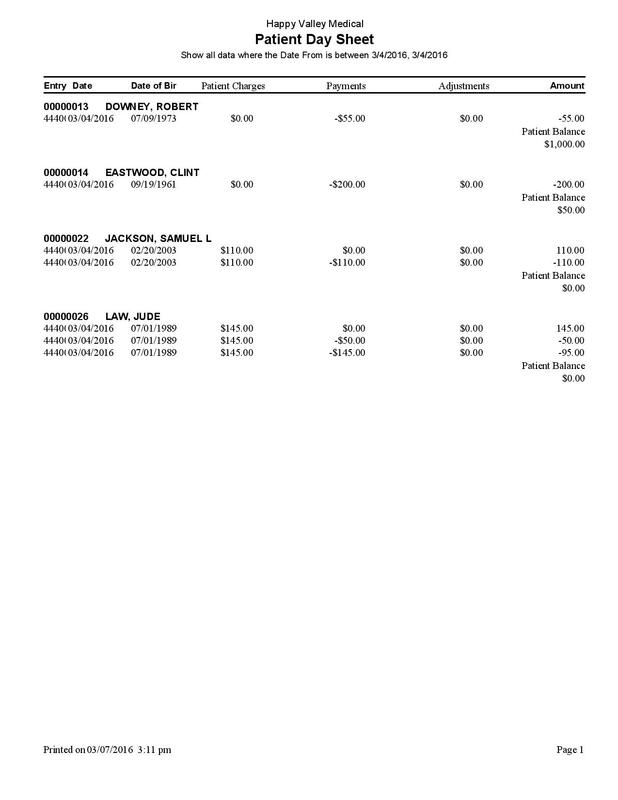 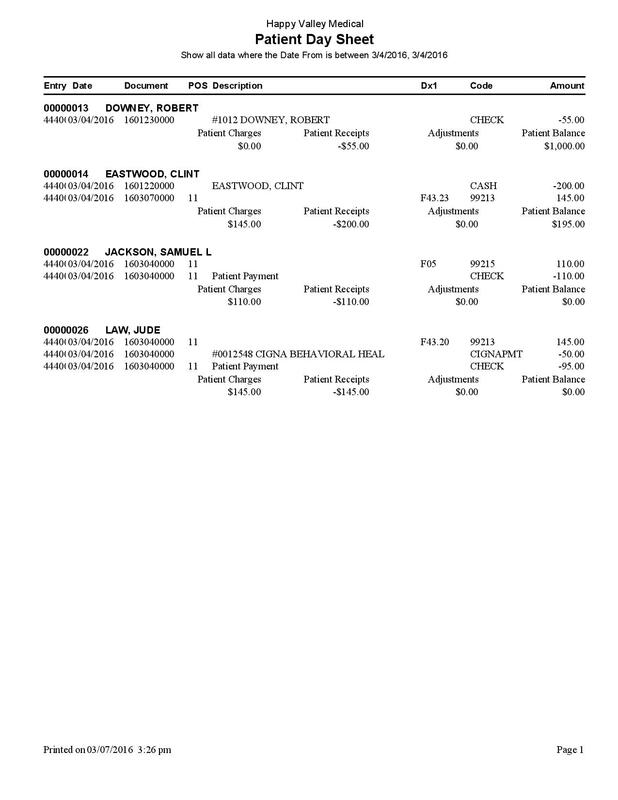 It also includes report totals for all charges, payments, and adjustments. 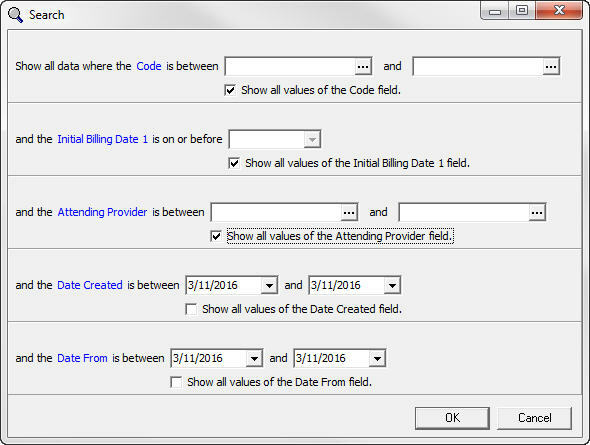 Filter options include date of service, date created, attending provider, insurance class, insurance carrier, and procedure code. 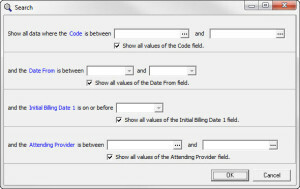 The Flash Report – Prior Year Billing Code report shows financial data for the last year to date. 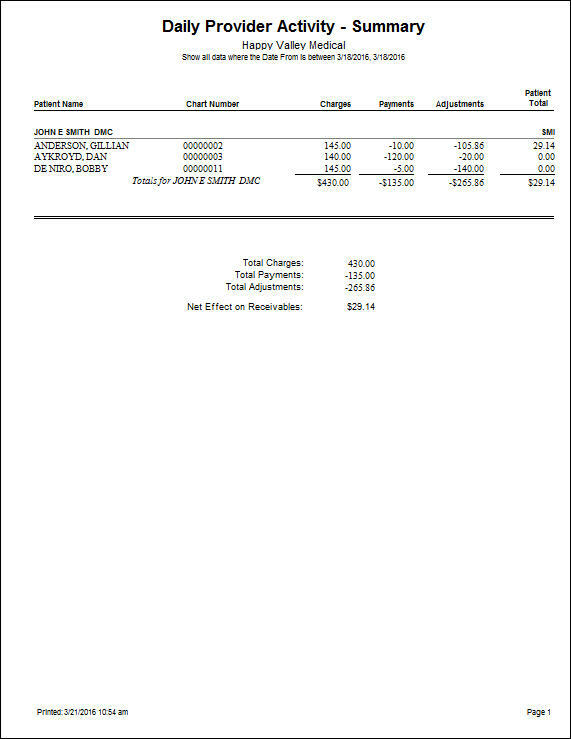 It reports the number of patient visits, charges, insurance payments, patient payments, adjustments, witholds, and the net change. 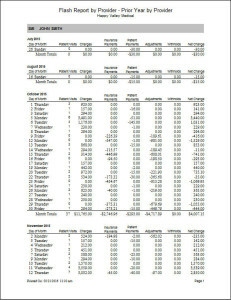 The report breaks this down by month, and then by the day of the month so you can see trends in appointment volume by time of year or even day of the week. 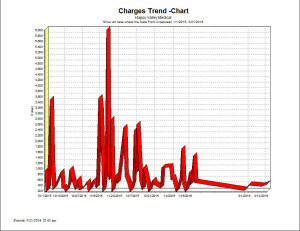 This report also includes two trend charts on the final page to show trends of charges and payments. This report provides a pie chart of the charges posted by each insurance class. Percentages are shown on the chart and the total amounts are shown in the key. 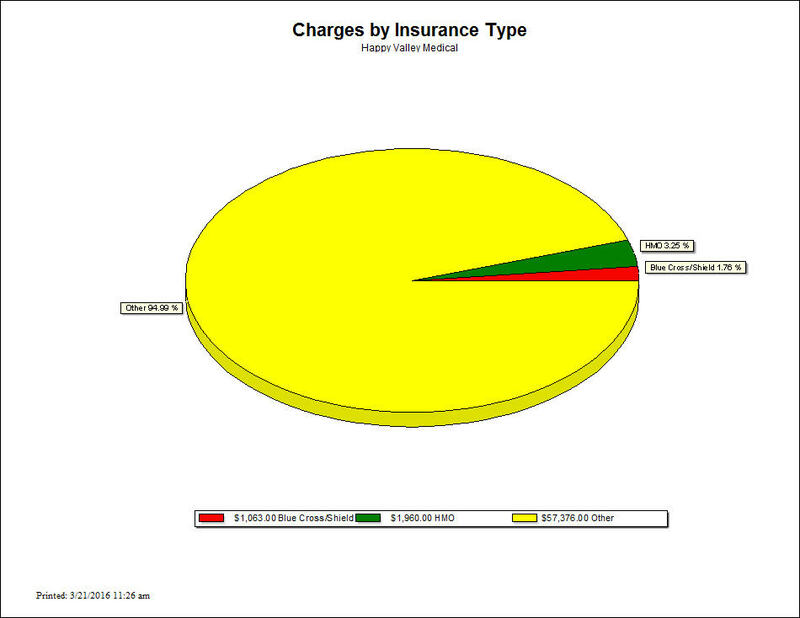 This report provides a pie chart of the charges posted by each insurance type. 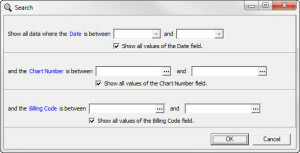 Percentages are shown on the chart and the total amounts are shown in the key. 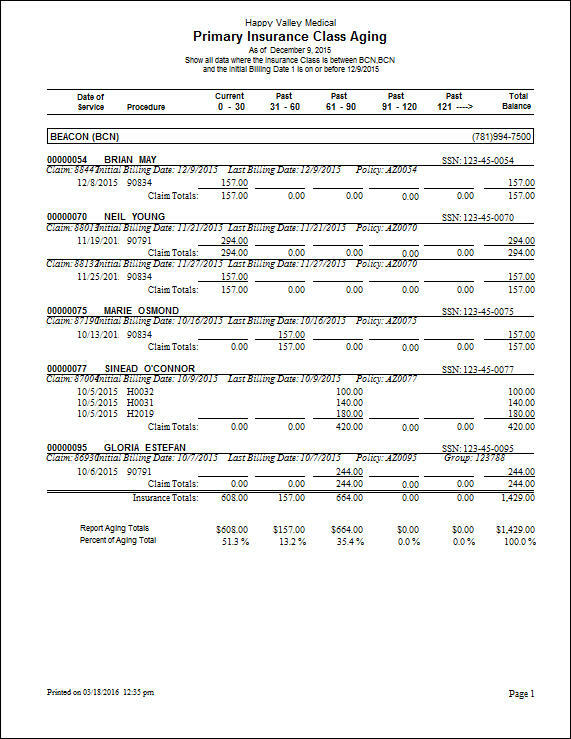 This report provides detailed information on the charges and payments posted for specific procedure codes, broken down by insurance class. 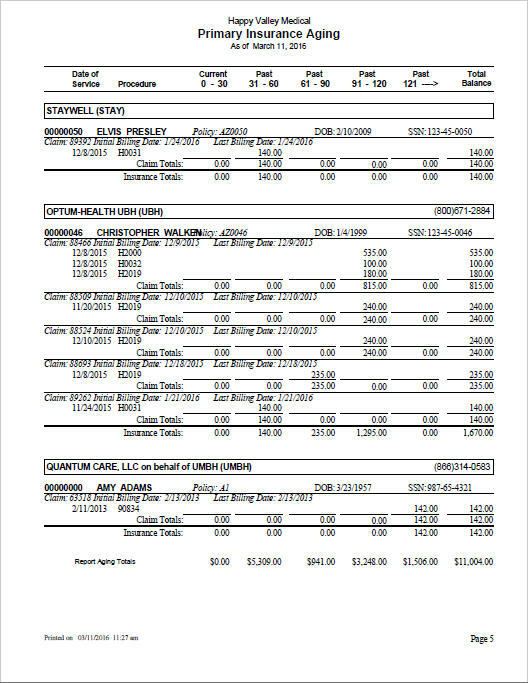 Each insurance class has the number of those procedures billed, charges, payments, and the average number of days it takes that insurance class to pay. 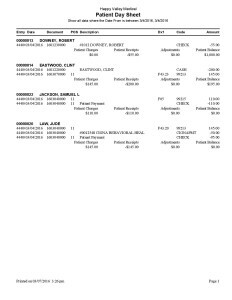 This report provides detailed information on the charges and payments posted for specific procedure codes, broken down by insurance company. 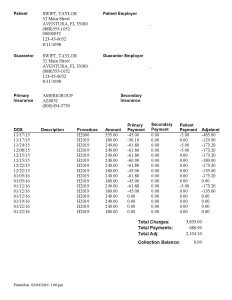 Each payor has the number of those procedures billed, charges, payments, and the average number of days it takes that insurance company to pay. 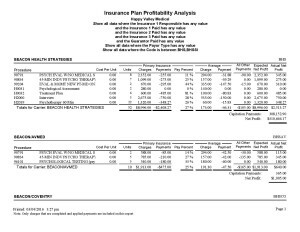 This report provides a profitability analysis for each insurance company. 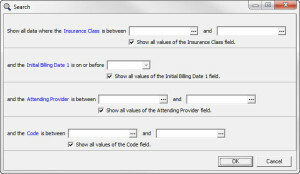 It can also be filtered to look at one insurance, or a group of insurances, at a time. 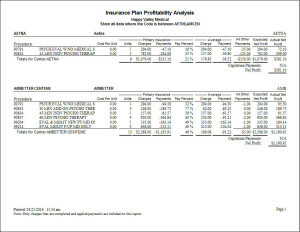 It includes procedures billed, primary insurance A/R, average charges and payments, other payments, expected profit, and actual profit. 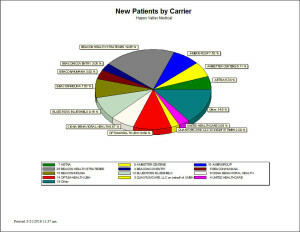 This report provides a pie chart comparing the number of new patients for each insurance company. 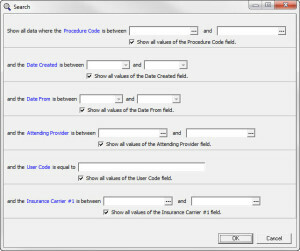 The percentages are listed in the chart, and the actual number of new patients for each insurance is listed in the key. 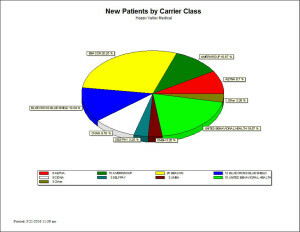 This report provides a pie chart comparing the number of new patients for each insurance class. The percentages are listed in the chart, and the actual number of new patients for each insurance is listed in the key. 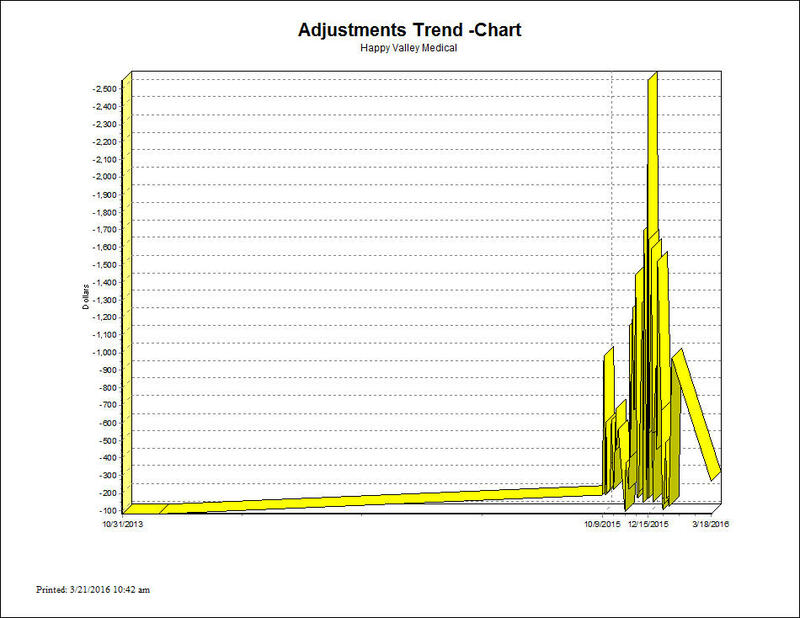 This report provides a graphical display of the number of new patients by month for a specific insurance company. 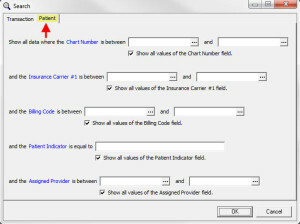 This allows you to see if and when you are getting new patients from this particular insurance company. 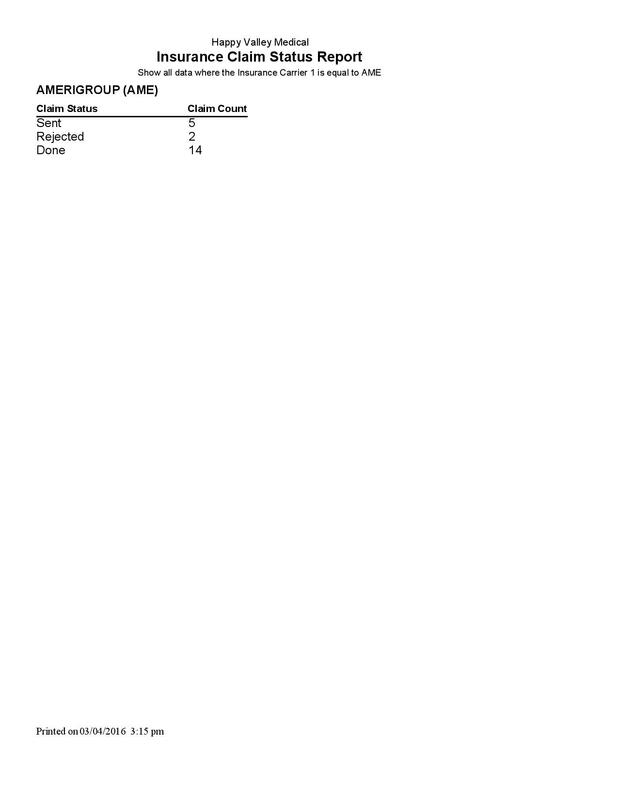 This report provides a patient census organized by insurance company. 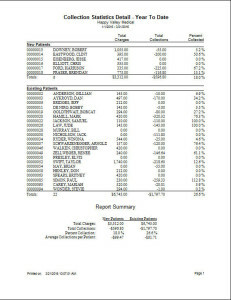 Patient details available in this report include patient name, chart number, address, and phone number. 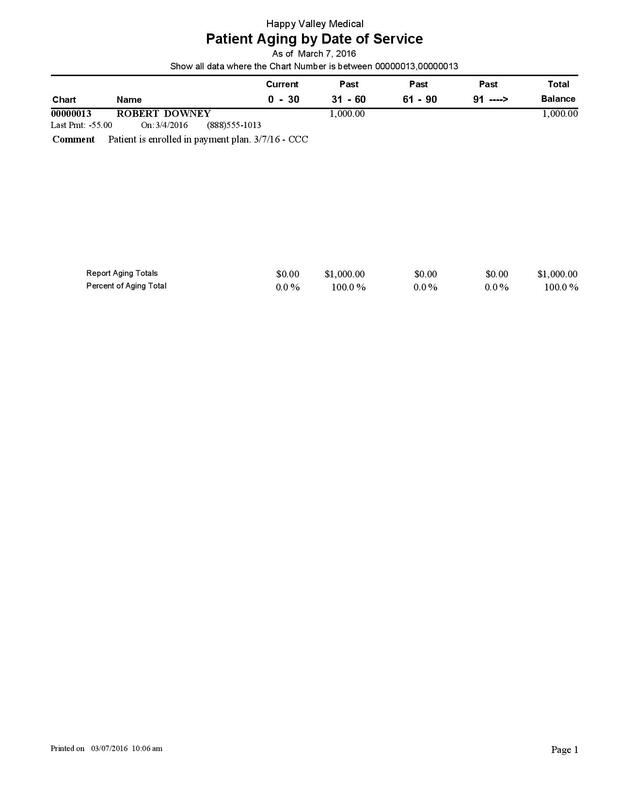 This report provides a patient census organized by the patient’s secondary insurance company. 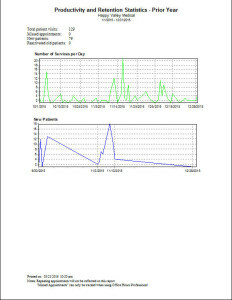 Patient details available in this report include patient name, chart number, address, and phone number. 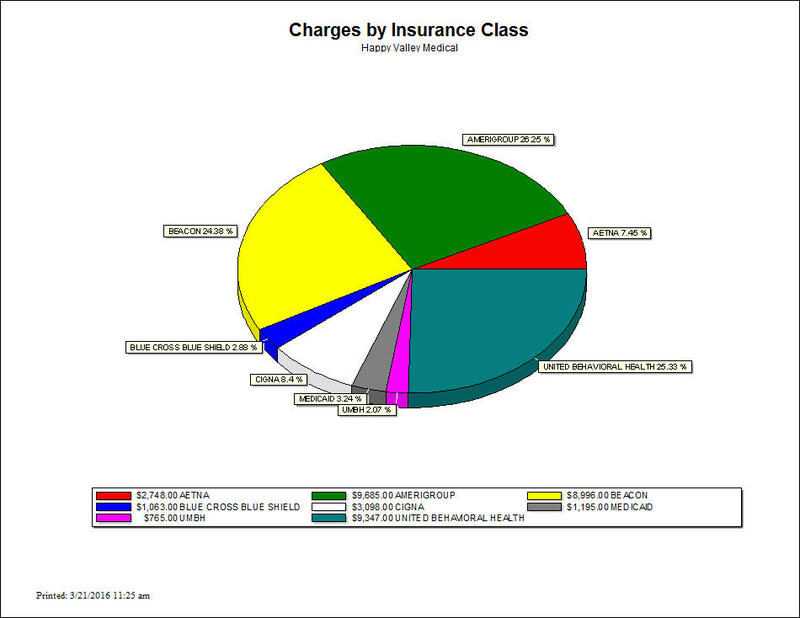 This report provides a patient census organized by the patient’s tertiary insurance company. 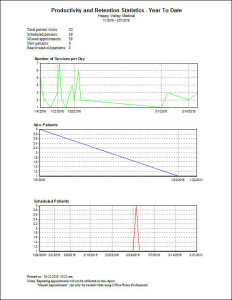 Patient details available in this report include patient name, chart number, address, and phone number. 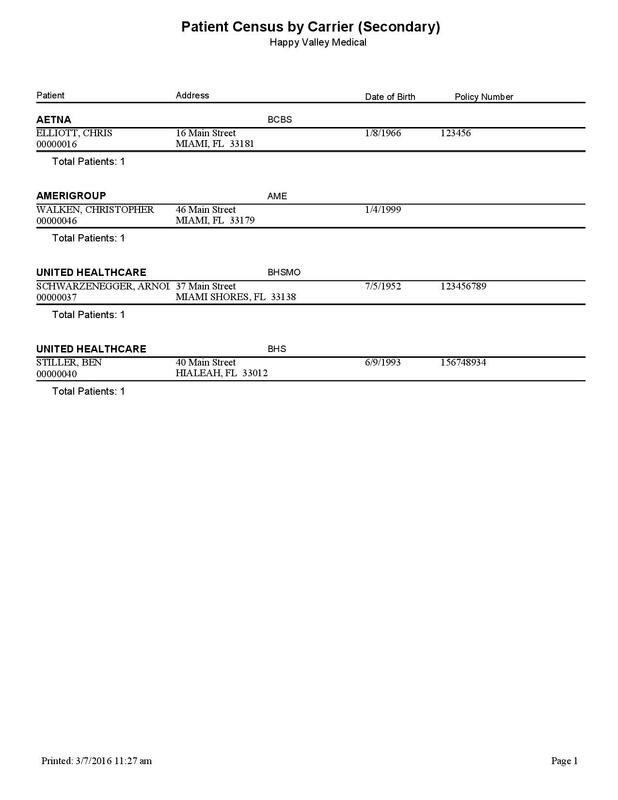 This report provides a patient census organized by the patient’s primary insurance company, and then further broken down by provider. 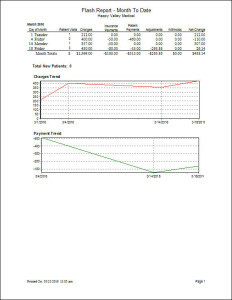 Patient details available in this report include patient name, chart number, address, and phone number. 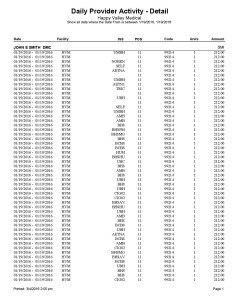 This report provides a patient census organized by the patient’s secondary insurance company, and then further broken down by provider. 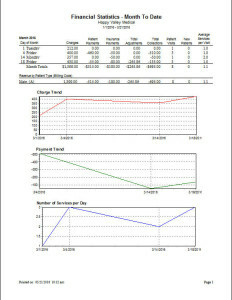 Patient details available in this report include patient name, chart number, address, and phone number. 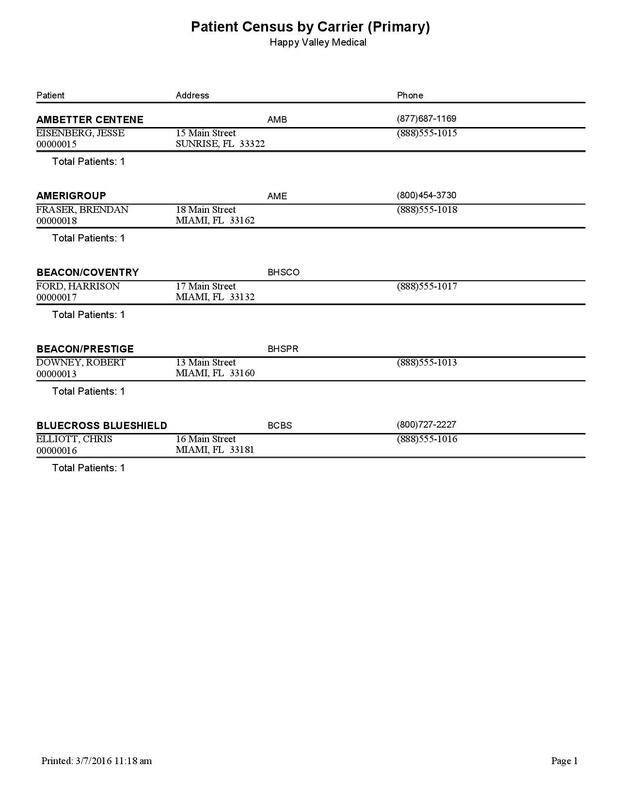 This report provides a patient census organized by the patient’s tertiary insurance company, and then further broken down by provider. 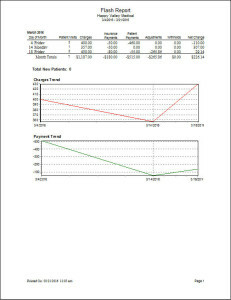 Patient details available in this report include patient name, chart number, address, and phone number. 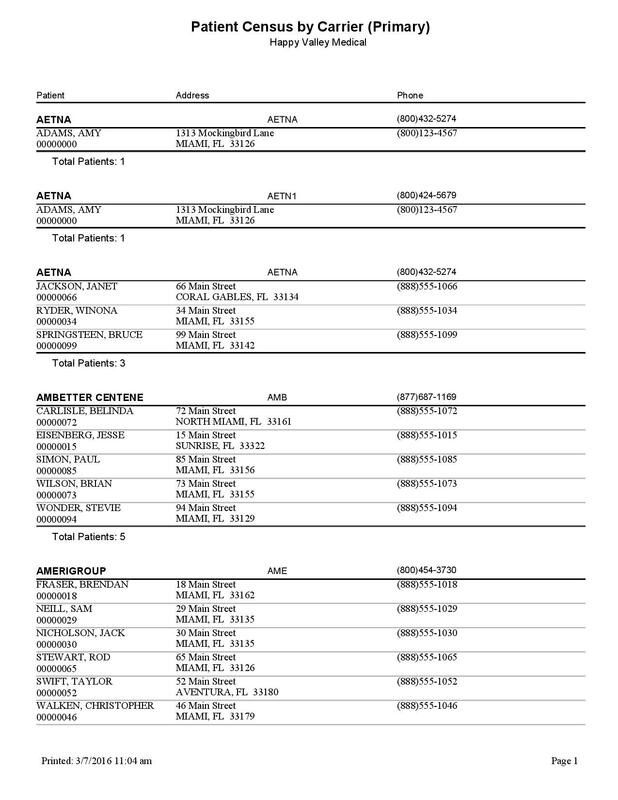 This report provides a list of procedure codes billed to a specific insurance company, or a range of insurance companies. 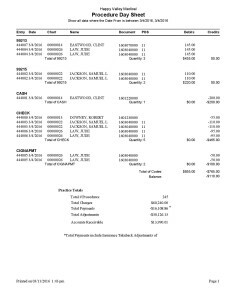 It includes the procedure information, along with fee for service details, and totals for each insurance company. 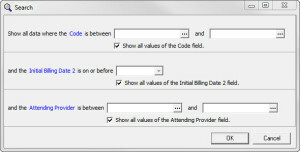 The Billing by Code report allows you to see the total amount billed for specific Procedure or Transaction Codes given a date range. 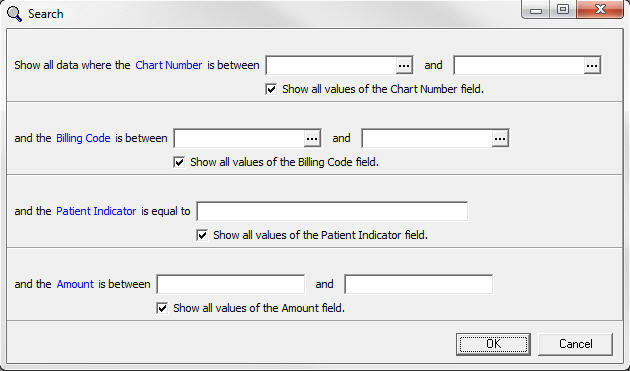 It will separate information by the code, and then break it down to the patient level, showing the patient’s name, chart number, and amount billed. 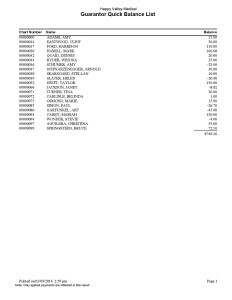 The report indicates the total billed for each Procedure or Transaction and then the grand total for all Procedures or Transactions included in the report. 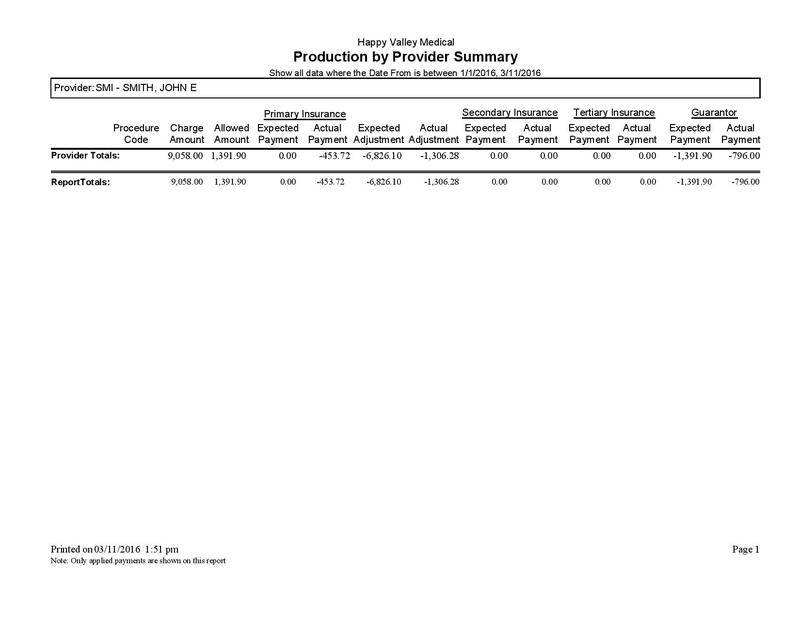 The Billing by Provider report shows the total amount billed for each provider in the practice. 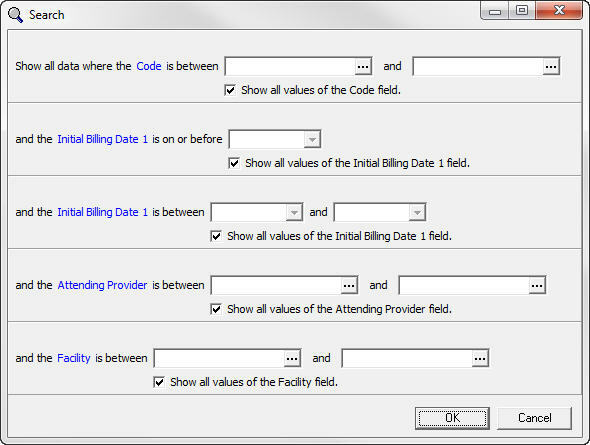 For example, you can use a specific date range in the filter to see how much was billed by each provider within the last year. 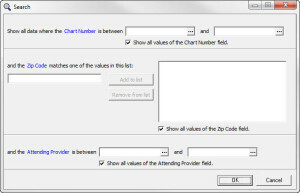 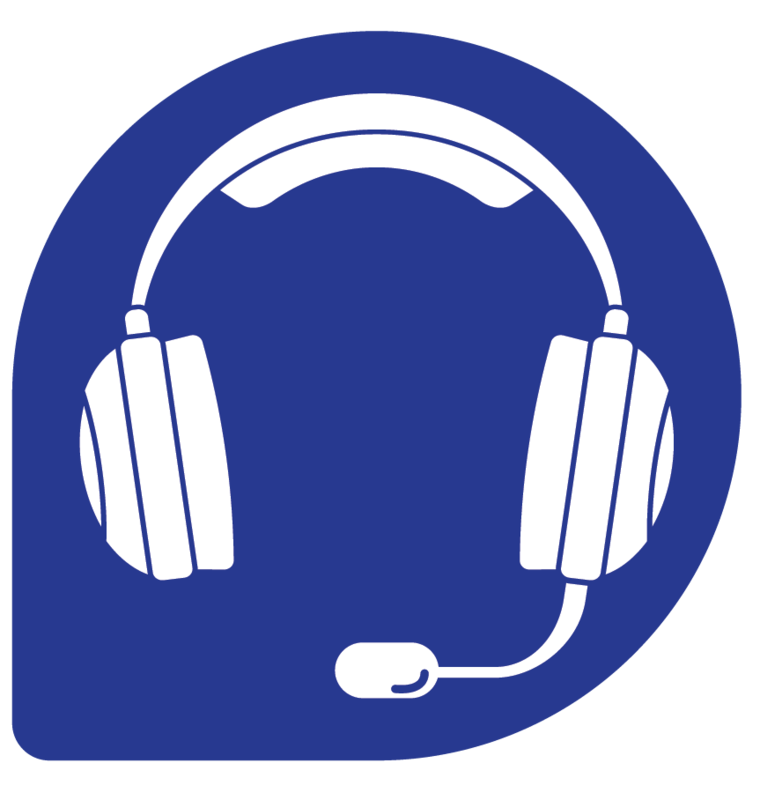 The Chart Label (1.125 x 3.5) Phone Number report allows you to print a chart label for any, or all, patients that includes the patient phone number. 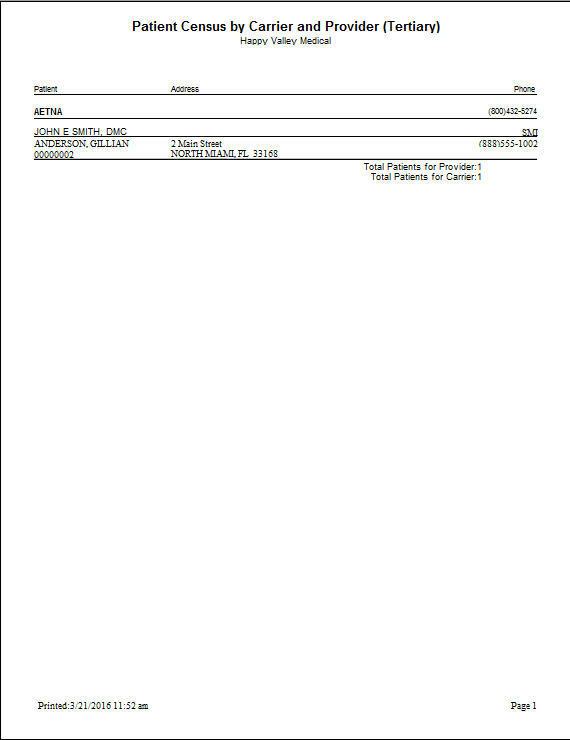 The label includes the first two letters of the last name, the full name, phone number, and the last 2 digits of the current year. 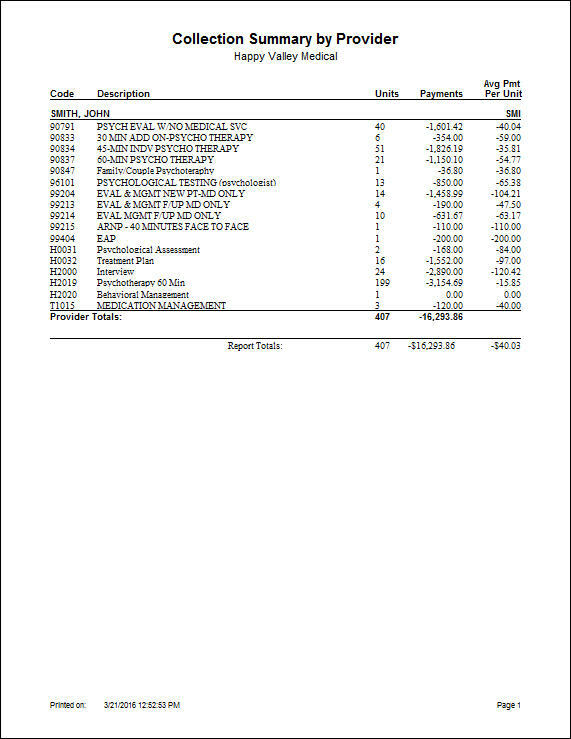 This report will show the different procedures billed to each insurance and analyse them for units billed, charges, insurance payments, and the pay percent for the insurance. 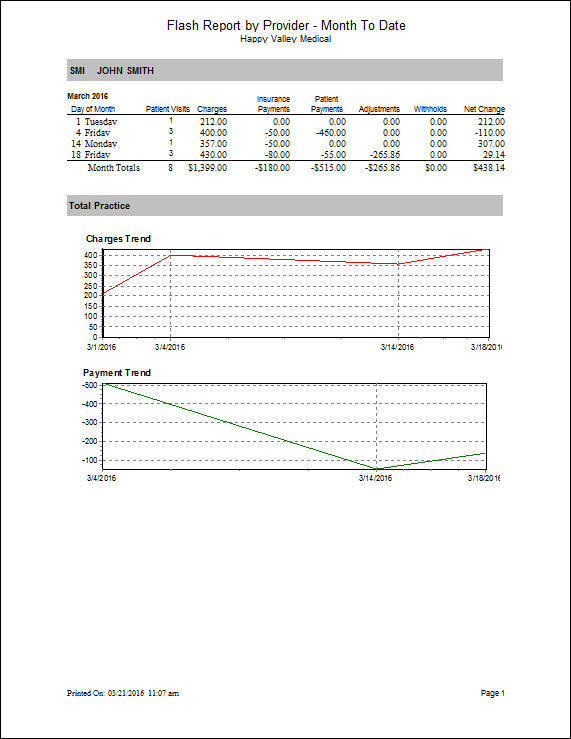 It will also show the average charge and payment for that procedure, all other payments for that code, the expected net profit, and the actual net profit. 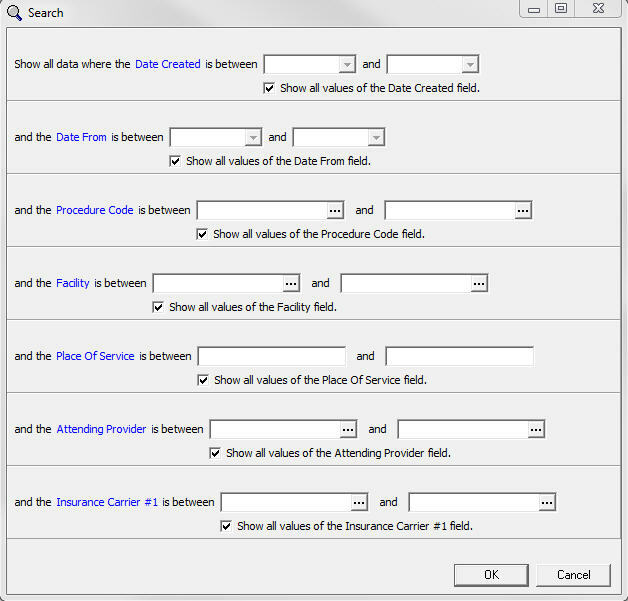 You can filter to see all insurance payors, only a few, or just one. 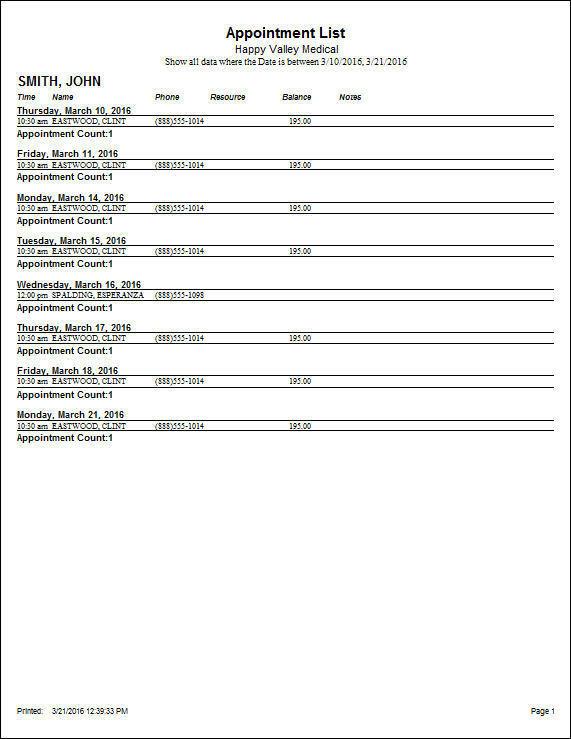 The Medicaid Visits Summary shows the total Medicaid appointments within a given date range. 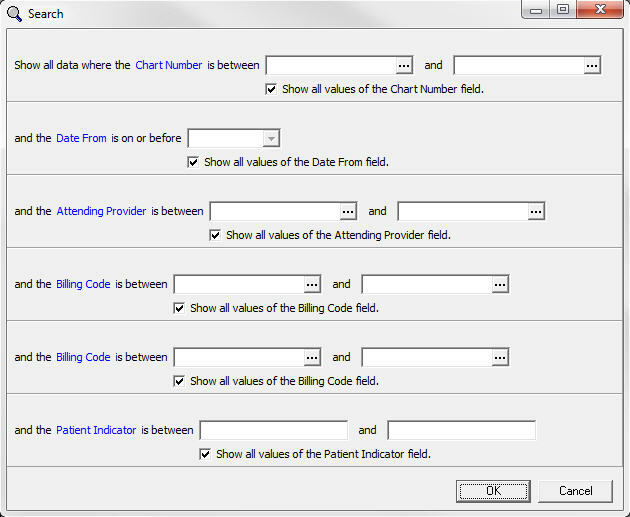 It breaks the information up by patient, and then indiciates how many visits they’ve had, and then how many of those were Medicaid visits. 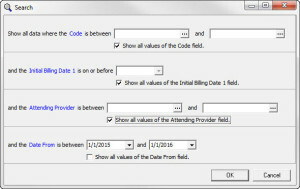 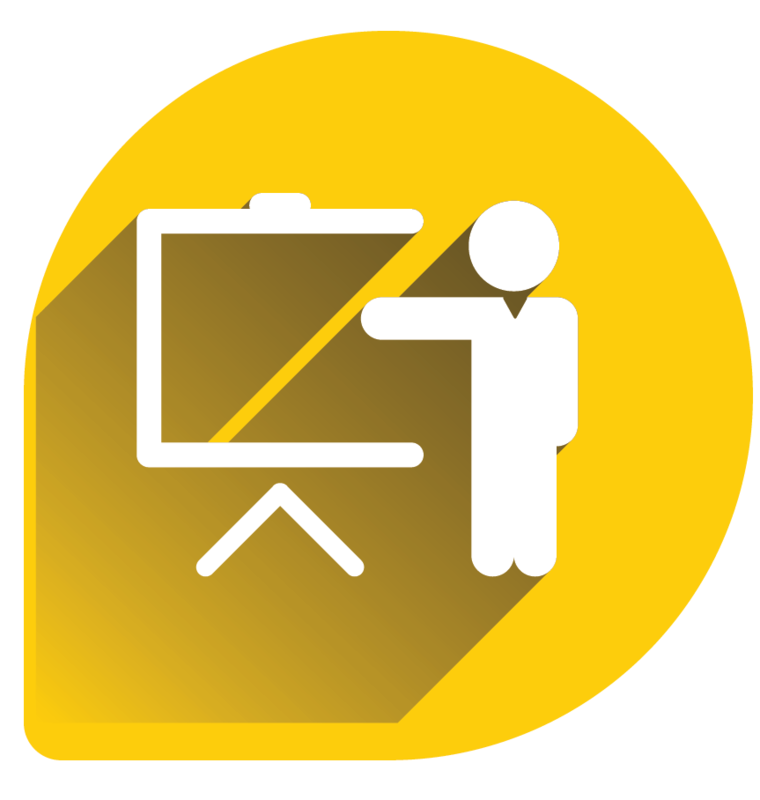 The Monthly Activity Summary (Provider) expands upon the Monthly Activity Summary report available in Medisoft by adding an additional filter for the provider. 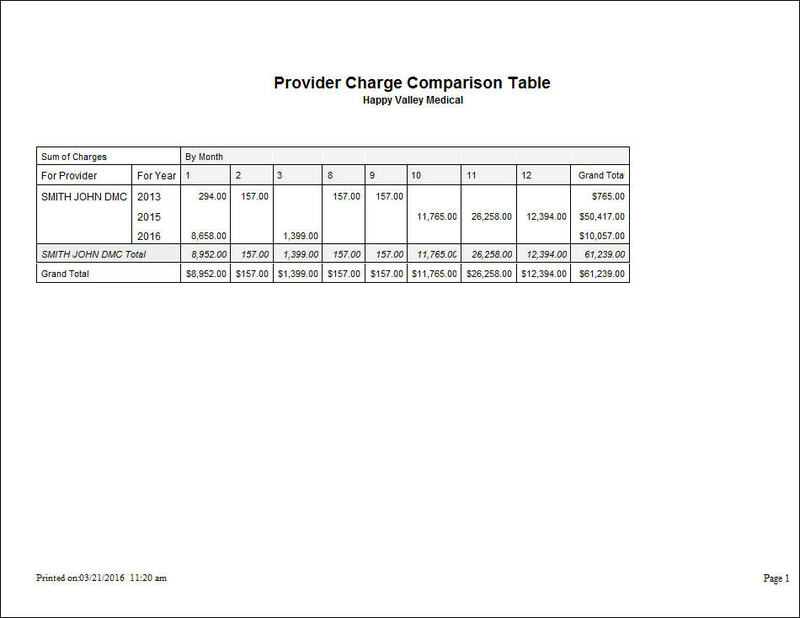 This way you can see the charges, payments, adjustments, units, net effect, and AR balance for each provider in a practice. 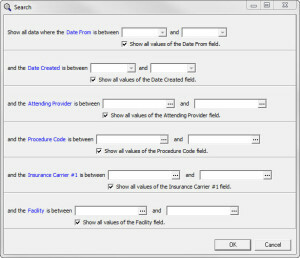 The Patient Census by Carrier (Primary) DOB report allows you to search patients within a certain date of birth range and it will display those patients by their insurance company. 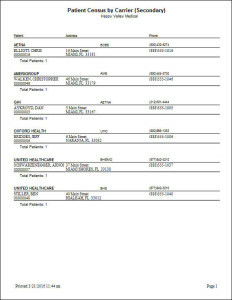 For example, the sample report shows all patients born between 01/01/1970 and 12/31/1970 and organizes them into insurance company headers. The Patient Census by Carrier (Primary) LVD provides a patient list, sorted by primary insurance, with the option to filter for a Last Visit Date (LVD) date range. 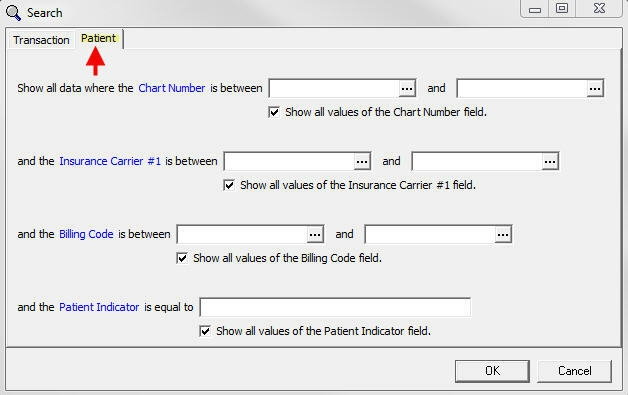 The Patient Census by Carrier (Primary) PHY report allows you to view the patient census, organized by insurance carrier, with the ability to filter for Insurance Carrier #1 and Assigned Provider. 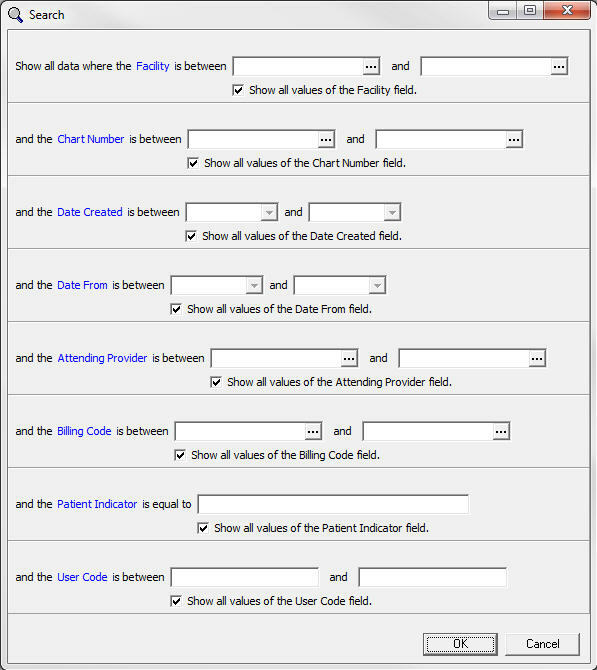 This report would be beneficial for a practice with many providers in order to view patient census information for each assigned provider. 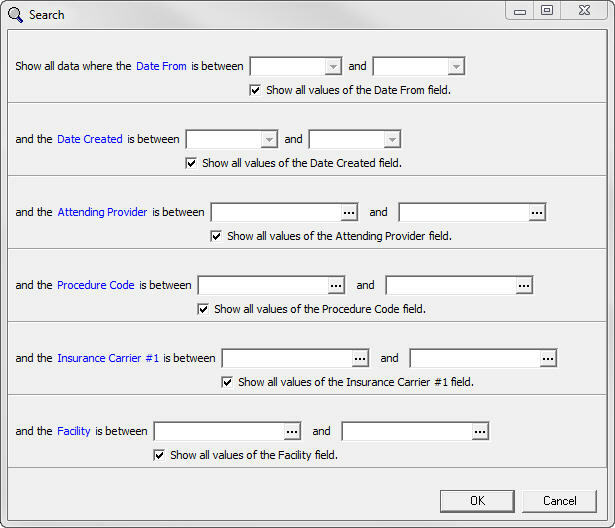 The Patient Census by Carrier (Primary) Policy report allows you to view a patient census list that is organized by insurance carrier. 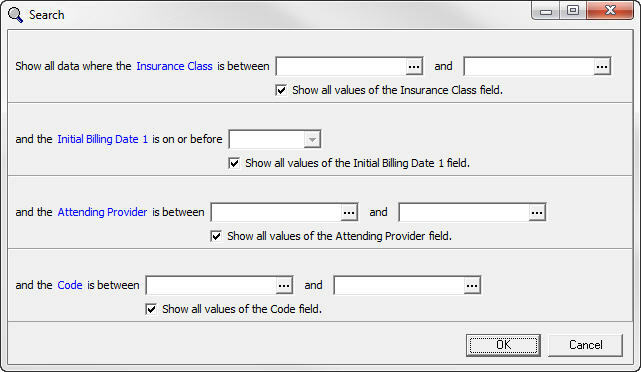 It provides the ability to filter by insurance policy, so you can choose to look at one specific insurance, or a range of insurances. 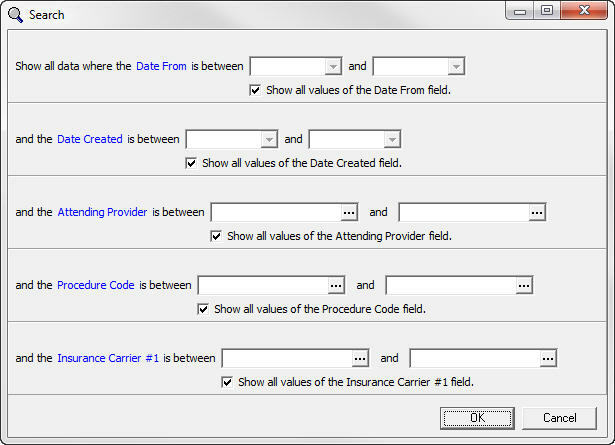 The Patient Census by Carrier (Primary) With Date Selection report gives you a patient census that is organized by insurance carrier with the ability to filter the report for patients seen within a specific date range. 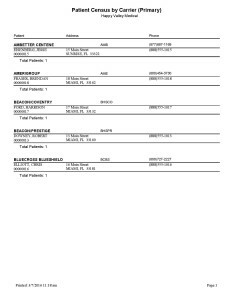 For example, the sample report shows patients that have been seen between 01/01/2016 and 03/07/2016, and organizes them by the primary insurance company. The Patient Census by Carrier (Secondary) LVD report gives you a patient census that is organized by secondary insurance carrier and allows the option to filter for the last worked date. 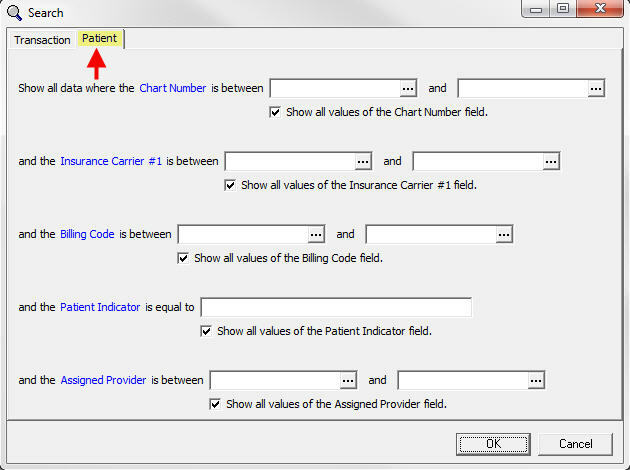 The Patient Census by Carrier (Secondary) Policy report shows a patient census that is organized by secondary insurance carrier. Only patients with a secondary insurance entered in will appear on this report. The report will display the insurance carrier, and then each patient that has that insurance as a secondary policy. 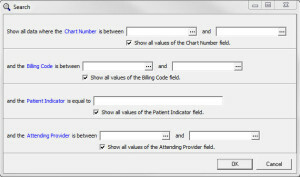 It will also provide patient name, chart number, address, date of birth, and policy number. 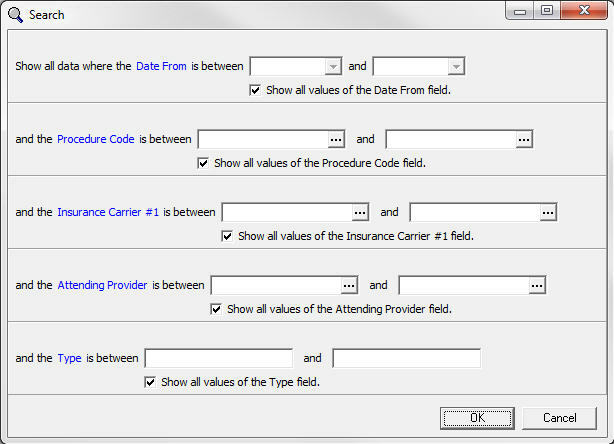 The Patient Census by Carrier and Provider (Primary) – New report shows a patient census that is organized by the patient’s primary insurance carrier, with the ability to filter for assigned provider as well as the primary insurance. 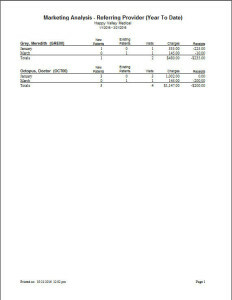 You can select a single insurance or a range of insurances, as seen in the sample report. 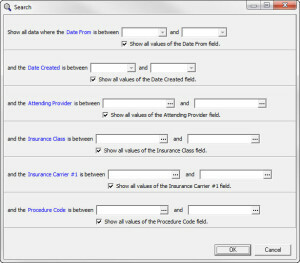 The Patient Visits by Insurance and Procedure (Lena) report allows you to search for patient visits with a specific insurance or procedure code. 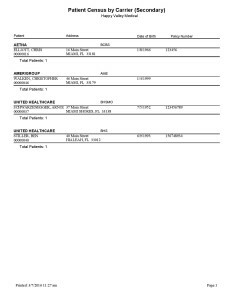 For example, the sample report is filtered for insurances Aetna, Amerigroup,and United Healthcare. 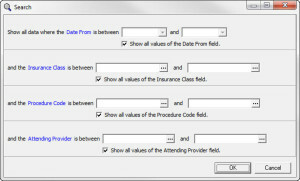 The report organizes the visit information by insurance provider, and then by procedure code. 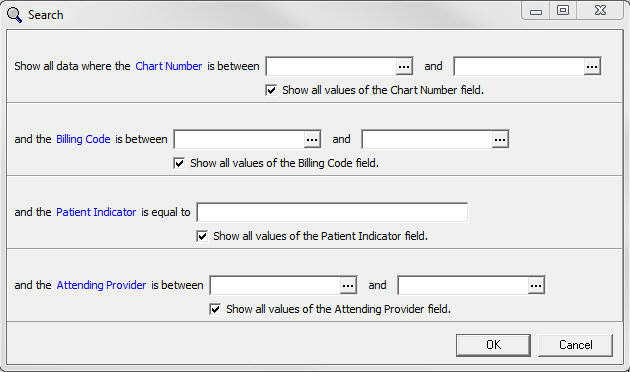 It includes the patient chart number, the patient name, and how many visits were billed with that procedure code. 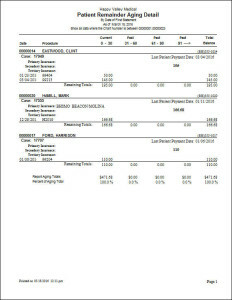 The Practice Management Report shows detailed information on visits within a certain time frame. 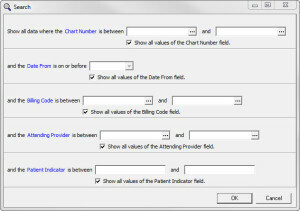 It displays the patient’s name, chart number, flag, facility, procedure, referring provider, attending provider, date of service, insurance, amount, and what was paid by the primary insurance or by the patient. 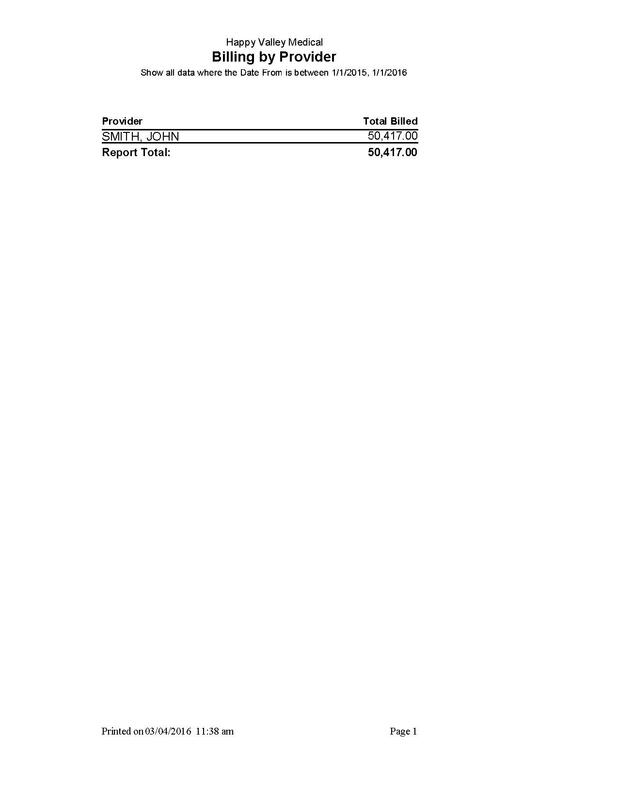 The end of the report details how many patients were seen, how many transactions were billed, the total amount billed, what was paid by primary, secondary, and tertiary insurances, and what was paid by patients. 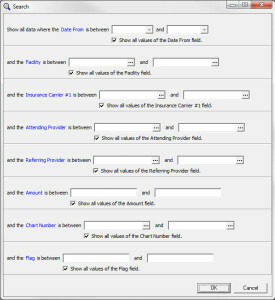 This report allows you to filter by date range, facility, insurance, attending/referring provider, amount, chart number, or flag. 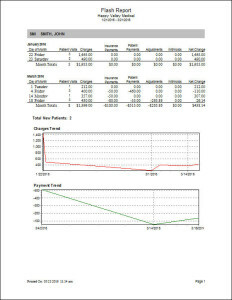 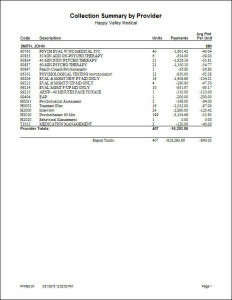 The Procedure Day Sheet (with Practice Totals) Insurance report includes the information available on the Procedure Day Sheet available in Medisoft, but also includes the practice totals such as total number of procedures, total charges, total payments, total adjustments, and total accounts receivable. 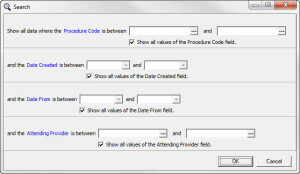 The Productivity by Procedure Code report is a report that provides a list of procedure codes billed, and includes the code, description, units, adjustments, and payments. 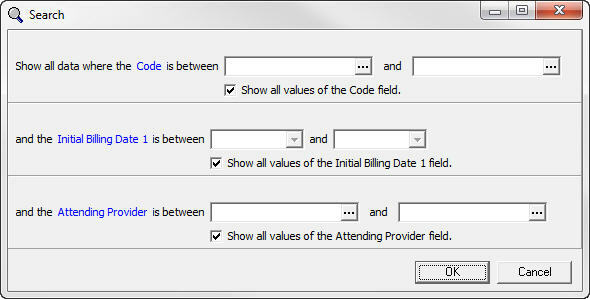 This is useful to see which codes are billed the most, which generate the most payments, and which are most adjusted. 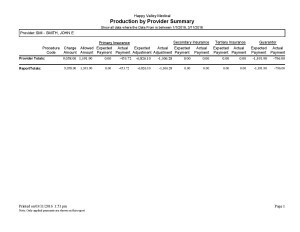 The Production by Provider Summary report includes a concise summary of the provider’s totals, including charge amount, primary, secondary, and tertiary insurance expected/actual payment, expected/actual adjustments, and guarantor expected/actual payments. 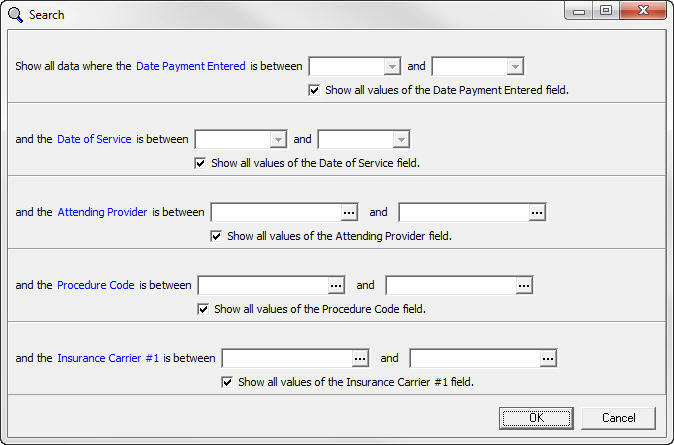 Filtering options include date of service, date created, attending provider, procedure code, or primary insurance carrier. 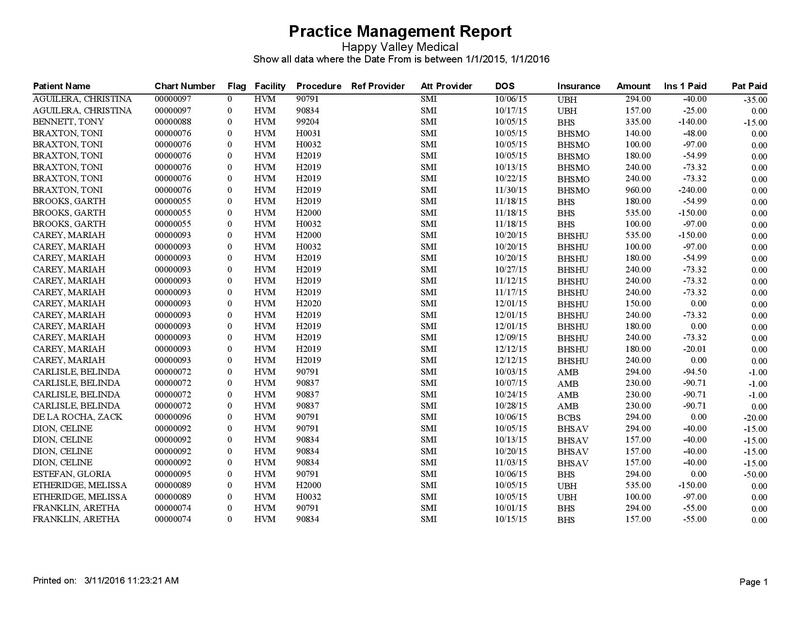 This report shows the number of patients referred to the practice for each referring provider. 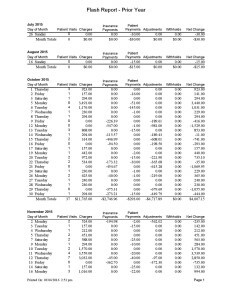 It is broken down by referring provider, and then further broken down by months to show how many new patients were referred in a specific month. 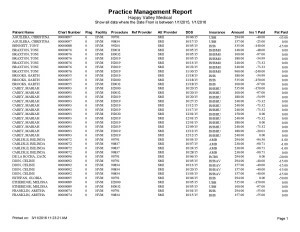 This report shows the number of patients referred to the practice for each referring provider within the current calendar year. 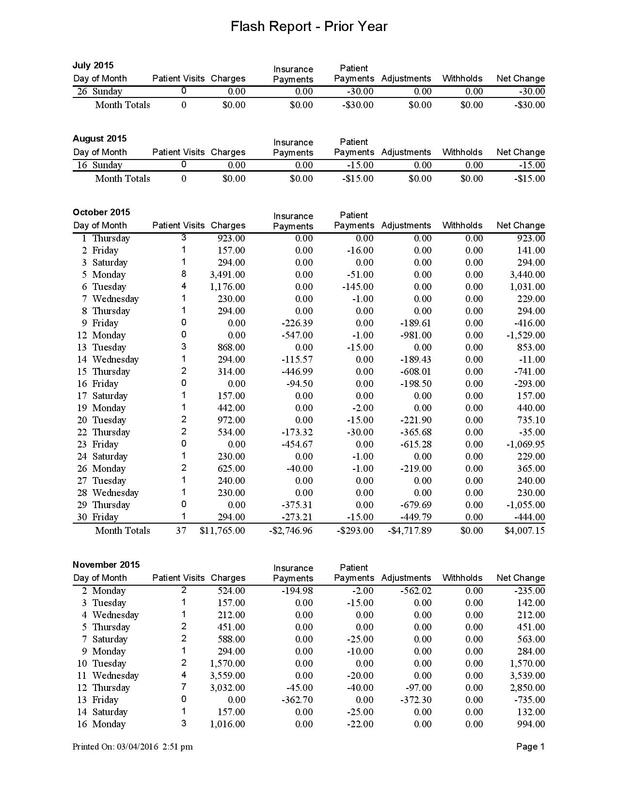 It is broken down by referring provider, and then further broken down by months to show how many new patients were referred in a specific month. 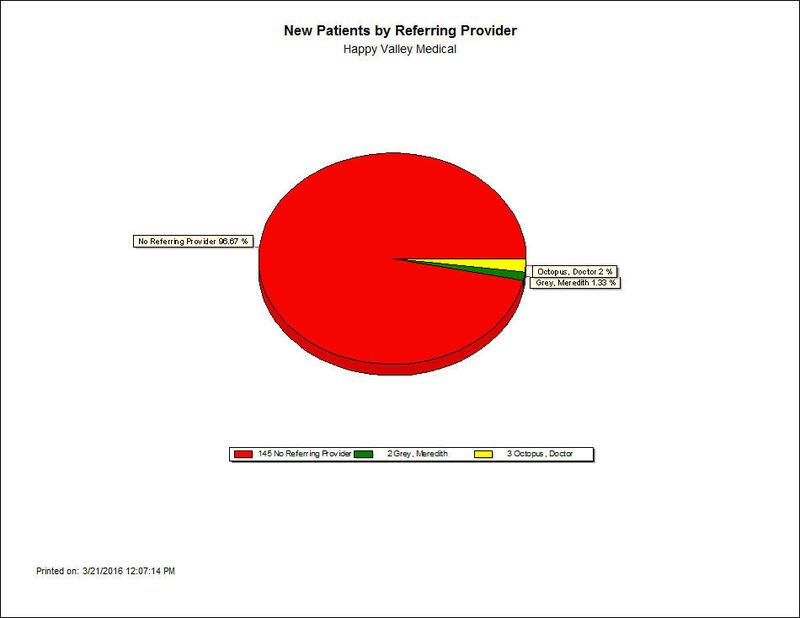 This report provides a pie chart summary of new patients by referring provider. This is helpful to see which referring providers are giving you the most new patients. 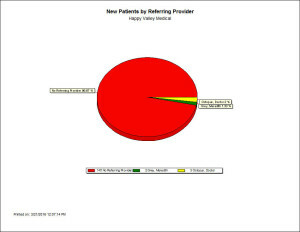 The percentages are listed on the pie chart and the actual number of new patients for each referring provider is listed in the key. 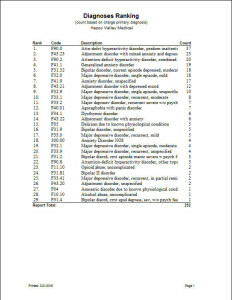 This report provides labels for all patients that had a last date seen within a specific time frame. 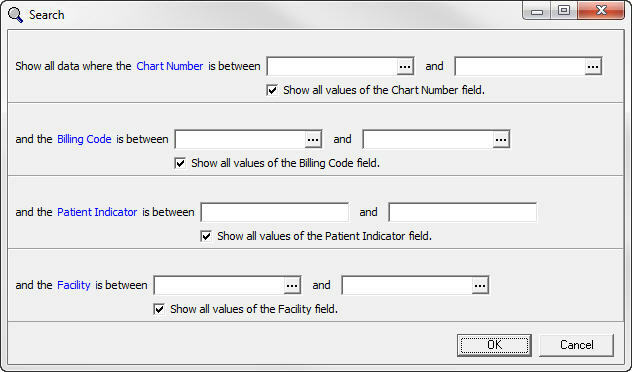 This helps to label patients that have not been seen in the practice recently. 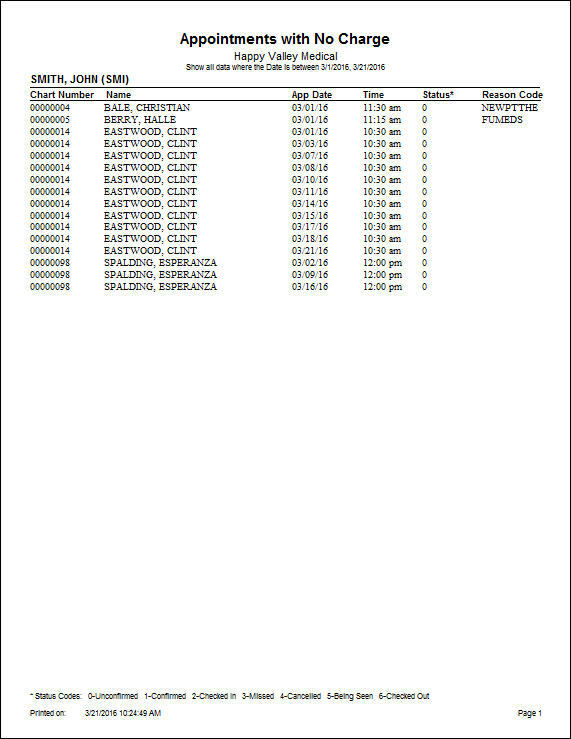 This report provides a list of all patients that had a last date seen within a specific time frame. This helps to know which patients that have not been seen in the practice recently. 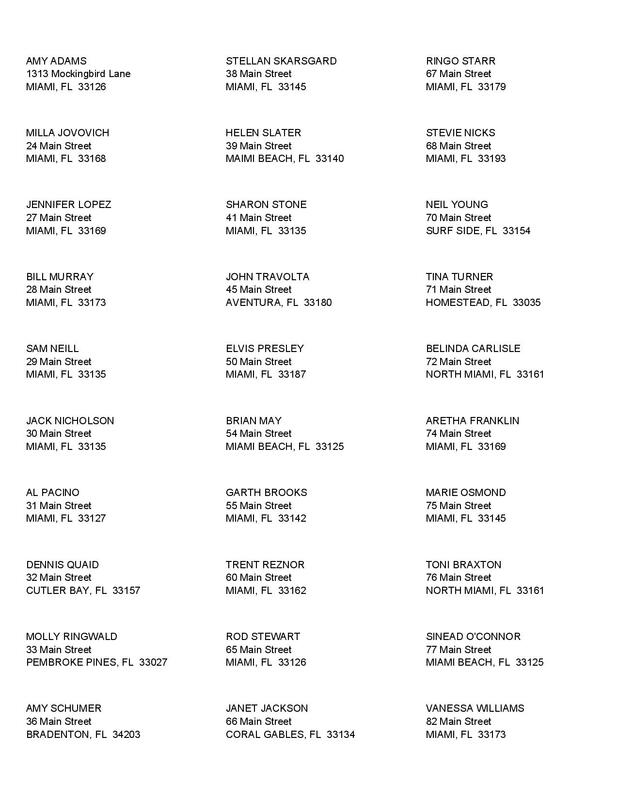 This report allows you to print address labels for any patient with a birthday in the current month. 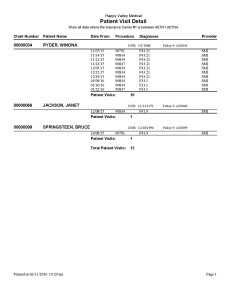 Each label includes the patient’s name and address. 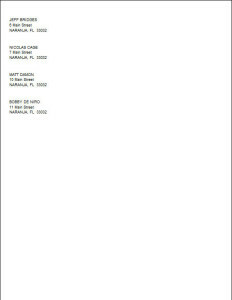 This report allows you to print address labels for any patient with a birthday in the next month. 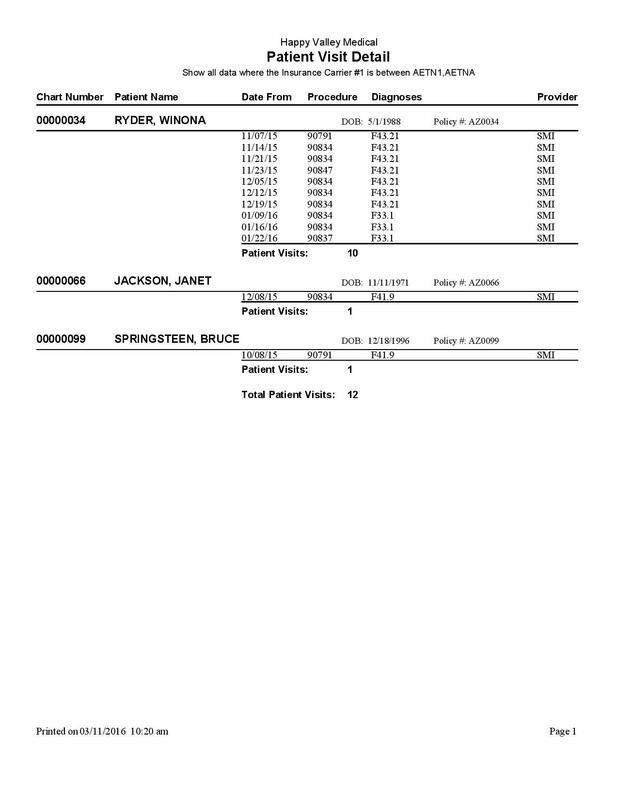 Each label includes the patient’s name and address. 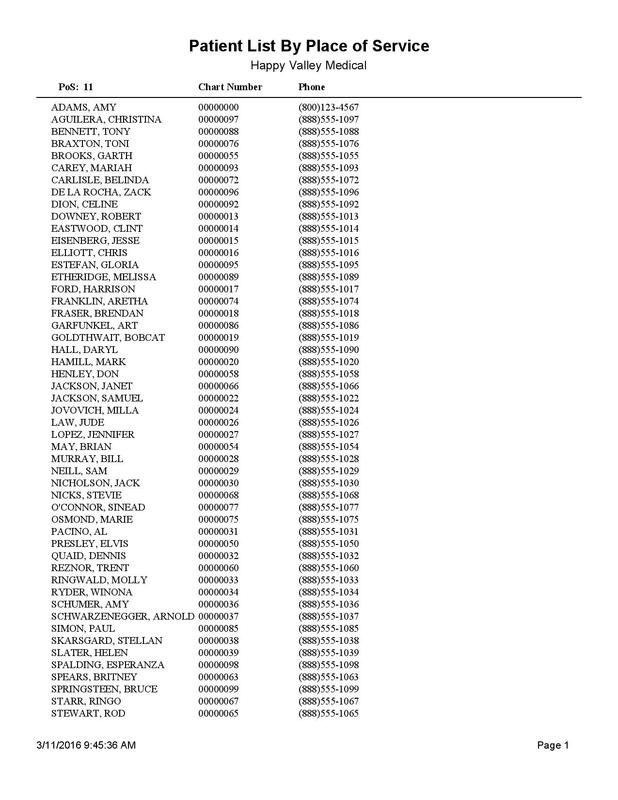 This report provides a list for all patients with a birthday in the current month. 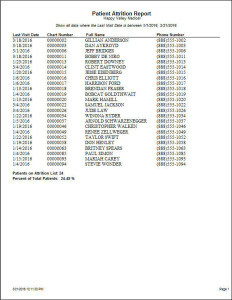 The patient information provided in this list includes the patient’s birthday, phone number, age, name, and address. 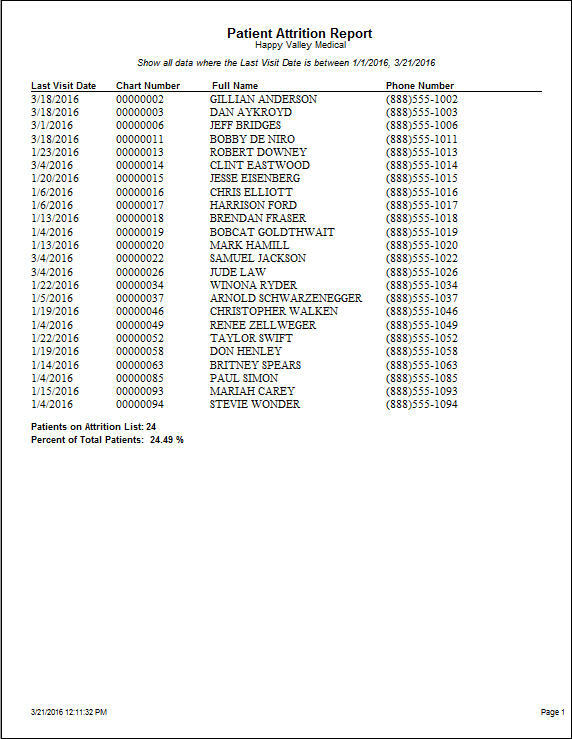 This report provides a list for all patients with a birthday in the next month. 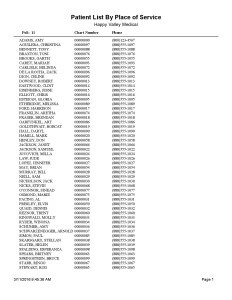 The patient information provided in this list includes the patient’s birthday, phone number, age, name, and address. 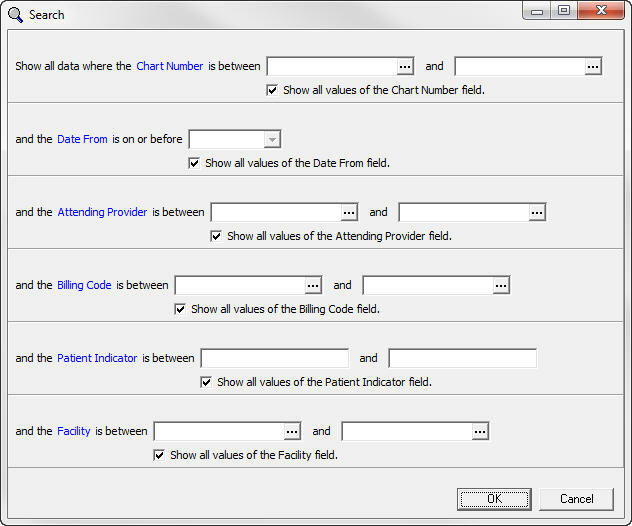 This report generates patient labels for any patients within a specific zip code, or with a specific provider. 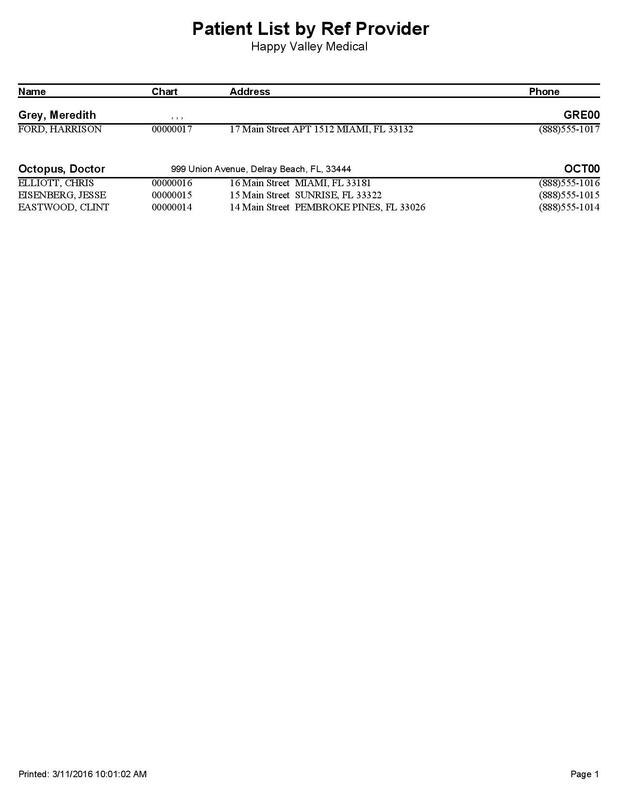 The labels include the patient’s name and address. 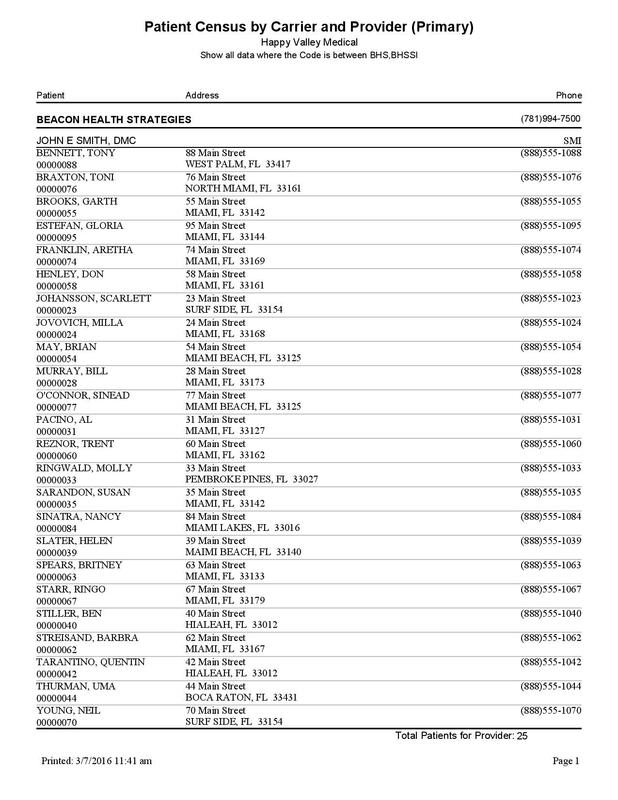 This report provides a list of patients within a specific zip code or multiple zip code selections. 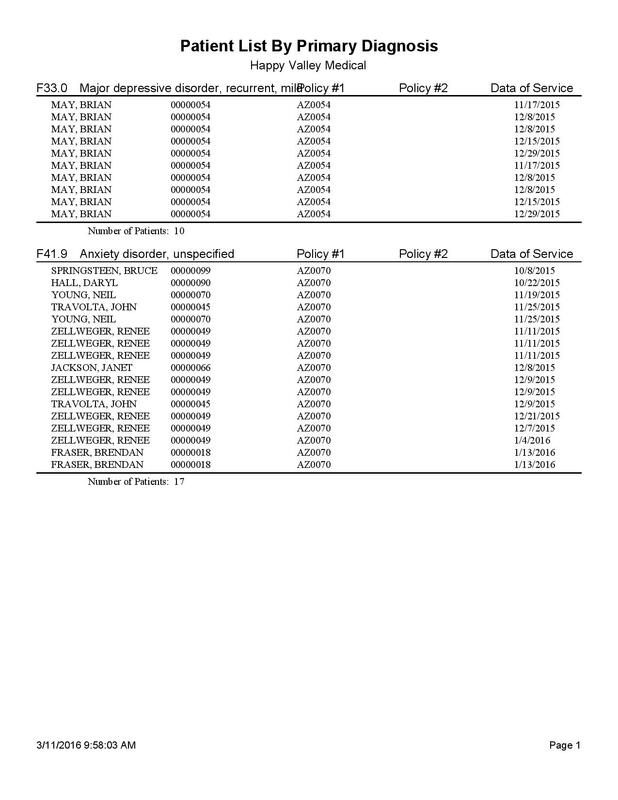 The list is broken down by zip code, and then further broken down into patient details. 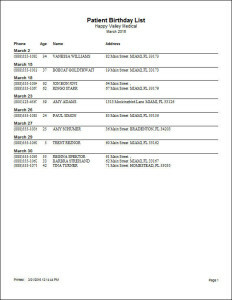 Patient information includes name, address, and phone number. 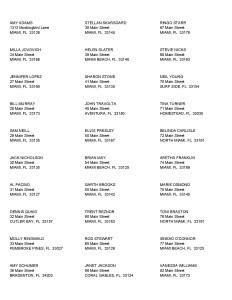 This report provides a list of patients within a specific zip code or multiple zip code selections. 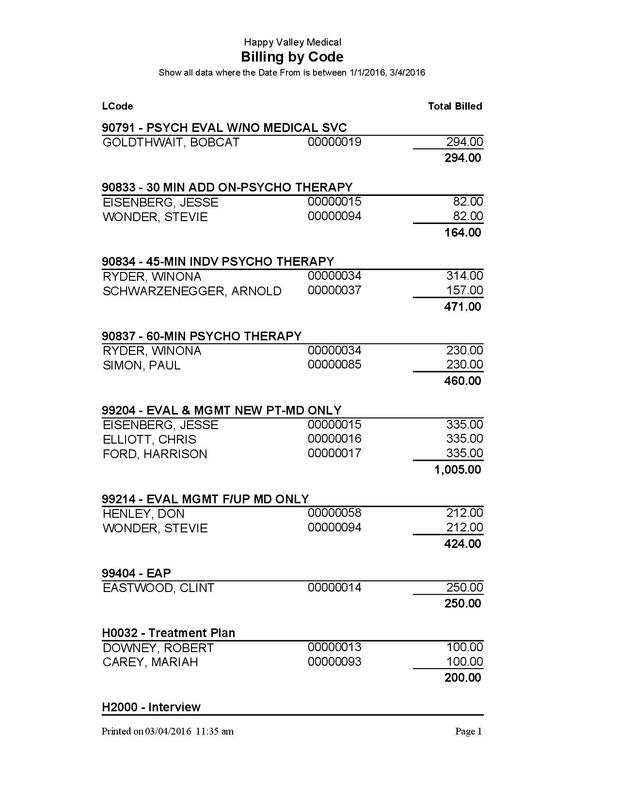 The list is broken down by zip code, and then further broken down into patient details. 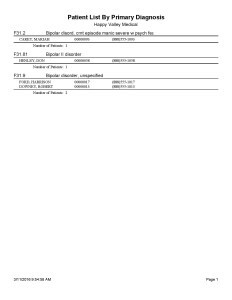 Patient information includes name, address, phone number, and total charges. 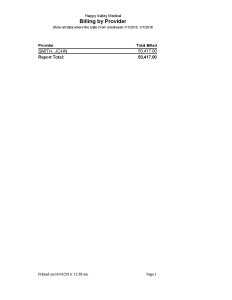 This report generates mailing labels for referring physicians. 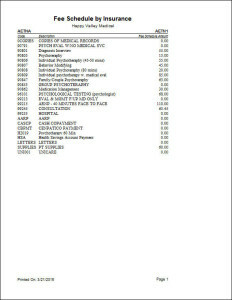 The labels include that physician’s name and address. This is ideal if you are looking to send mailed marketing material to your referring providers. The Billing by Referring Provider report allows you to see the billings associated with patient cases where a referring provider was assigned. 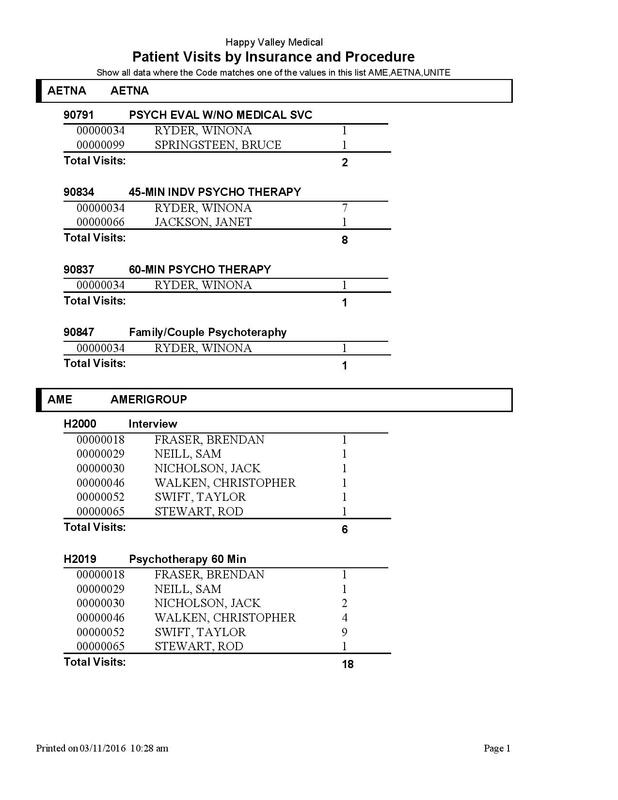 The report is broken down by referring provider, and then by patient name. 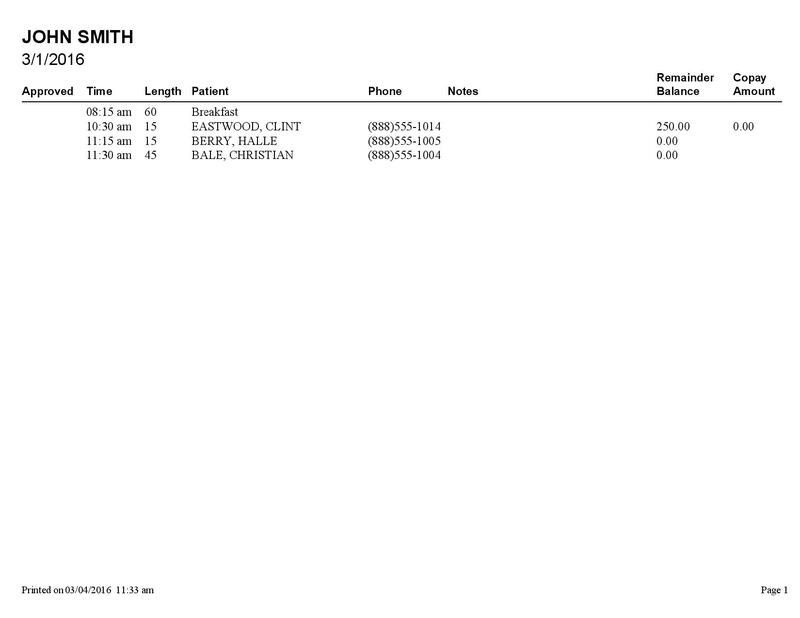 It lists the patient name, the patient’s chart number, and the total amount billed for that patient. 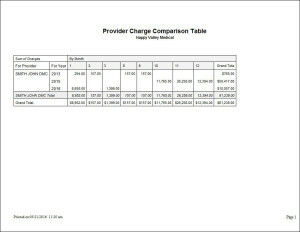 Each referring provider will have an individual total, indicating how much was billed for patients with that referring provider. 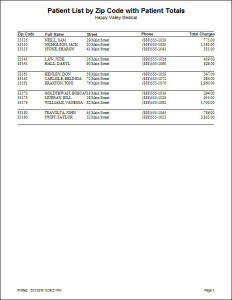 A grand total will also be indicated for all billings where any referring provider was listed. 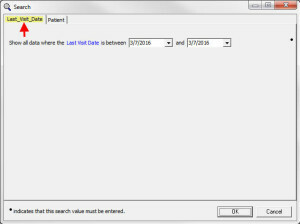 The Patient Attrition Report allows you to search for patients that have had their last visit date within a certain date range. 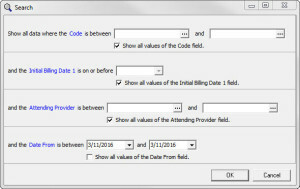 This is helpful to run in order to see which patients have not been seen in your practice within a certain time frame, depending on the dates used. 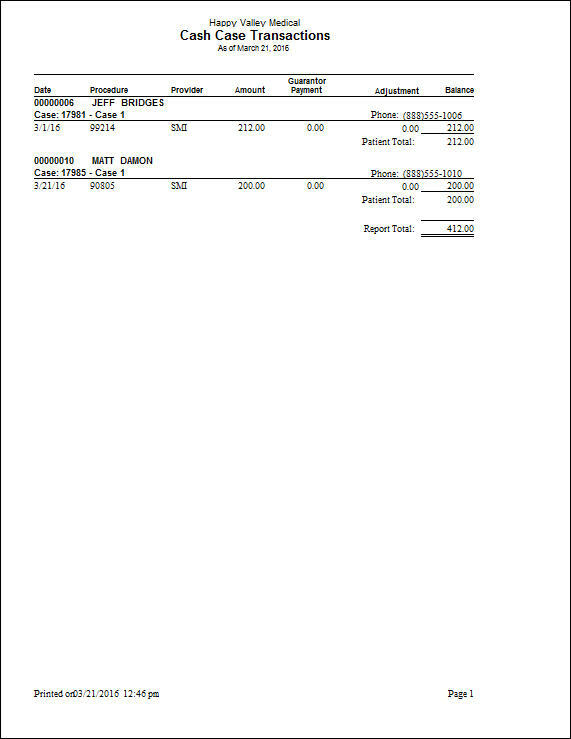 For example, the sample report shows patients who have their last visit date between 01/01/2015 and 01/01/2016. 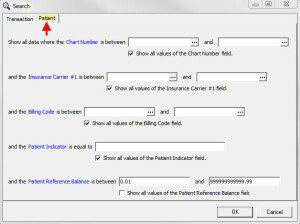 The Patient Label by Carrier report allows you to print patient labels for all patients under a specific insurance company. 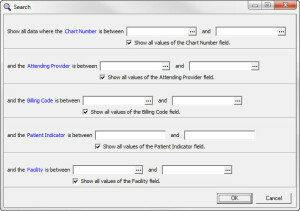 The labels have the patient’s first and last name, and the patient’s address. 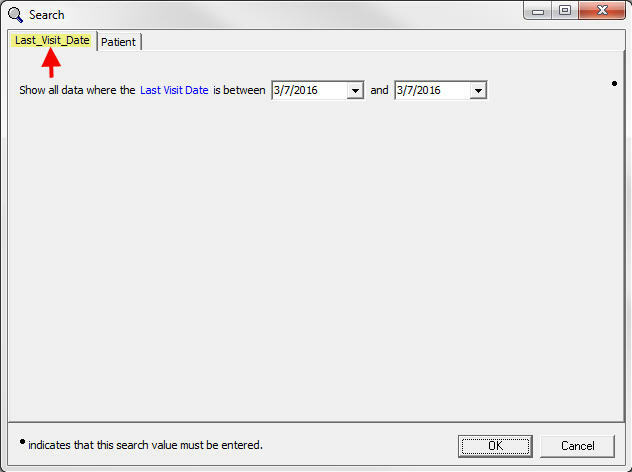 The Patient Labels (Last Visit Date) Date Range report gives you patient labels that include the patient’s first and last name, and the patient’s address. 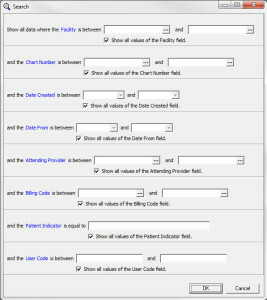 This report allows you to filter by the patient’s last visit date, the patient’s procedure code, or the patient’s attending provider. 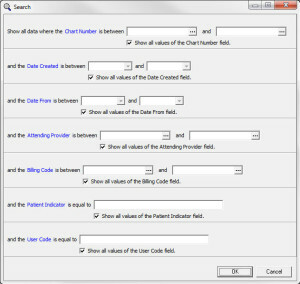 The Patient List by PoS report provides a list of all patients organized by a specific place of service. 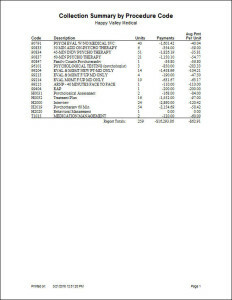 In the sample report, all are listed as PoS 11. 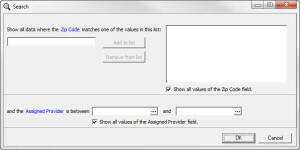 You can look for one specific PoS or you can search for all PoS and it will organize the patients under the associated PoS. 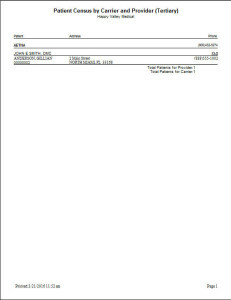 The Patient Mailing Label (1.125 x 3.5) report provides patient labels with the patient’s first and last name, date of birth, address, and insurance company. 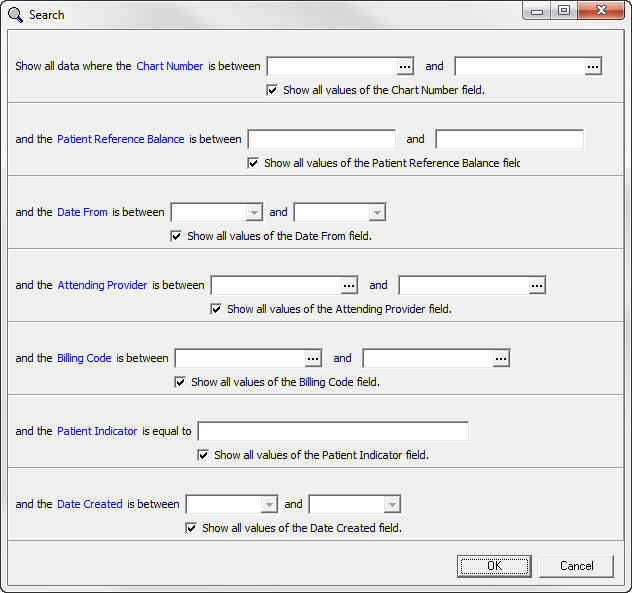 You can filter for a specific patient or you can create labels for all patients. 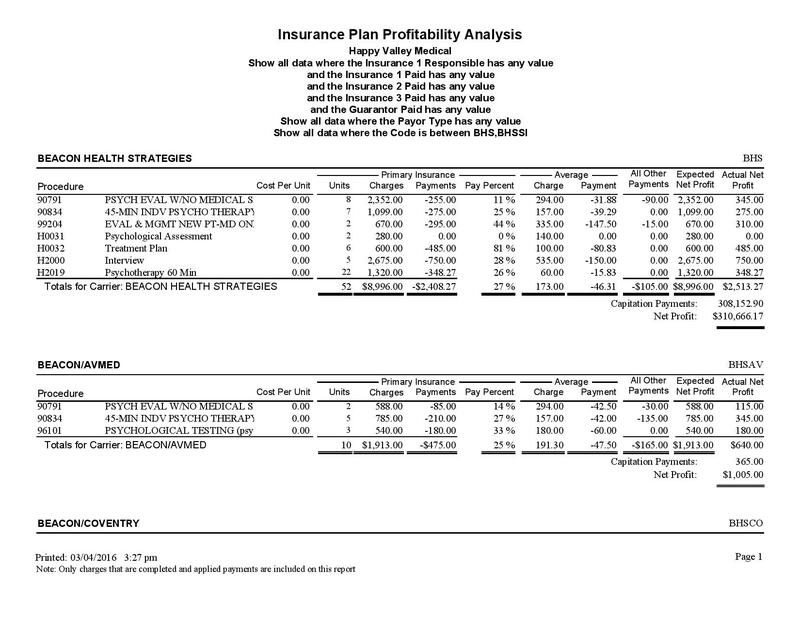 This report generates A/R data for each insurance class. 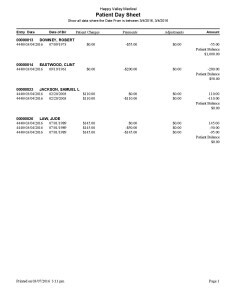 Information provided includes the charges, payments, adjustments, units billed, net effect, and % of net effect for each insurance class. 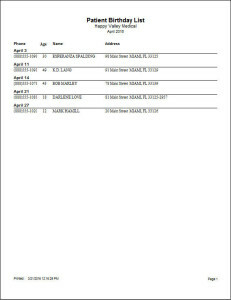 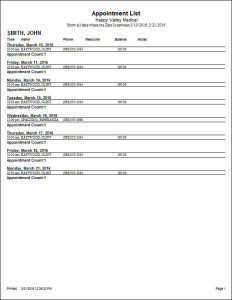 This report provides a list of appointments on a specific date or date range. 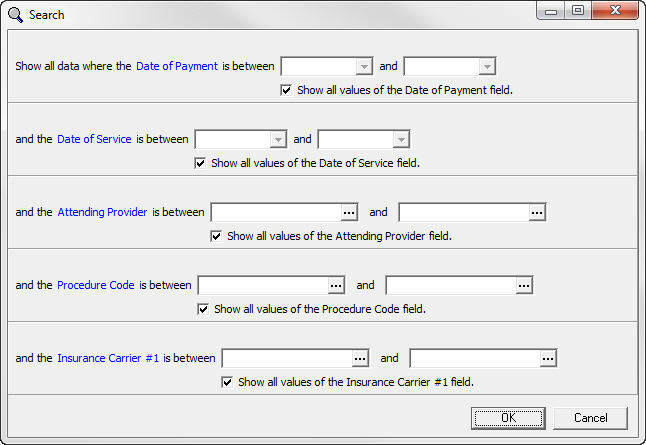 It is organized by appointment date and time, and provides the patient name, telephone number and guarantor balance. 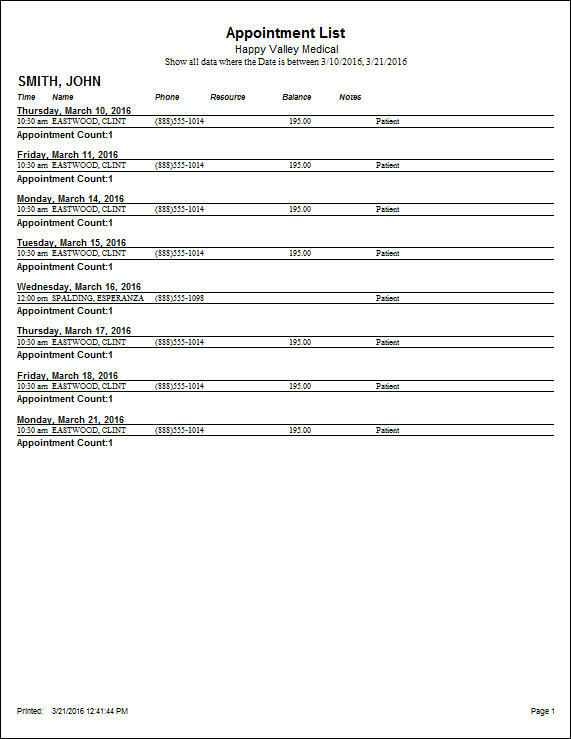 This report provides a list of appointments on a specific date or date range. 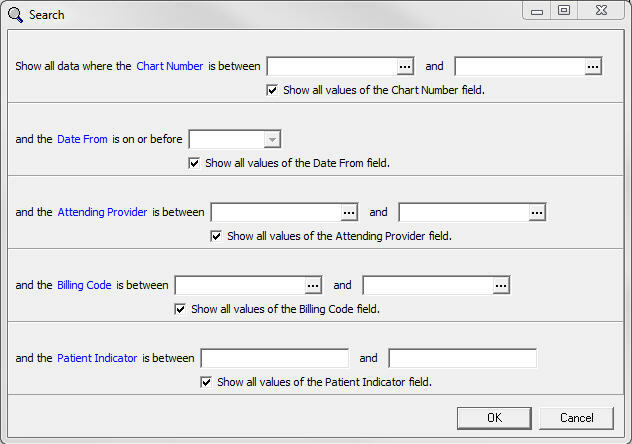 It is organized by appointment date and time, and provides the patient name, telephone number and patient balance. 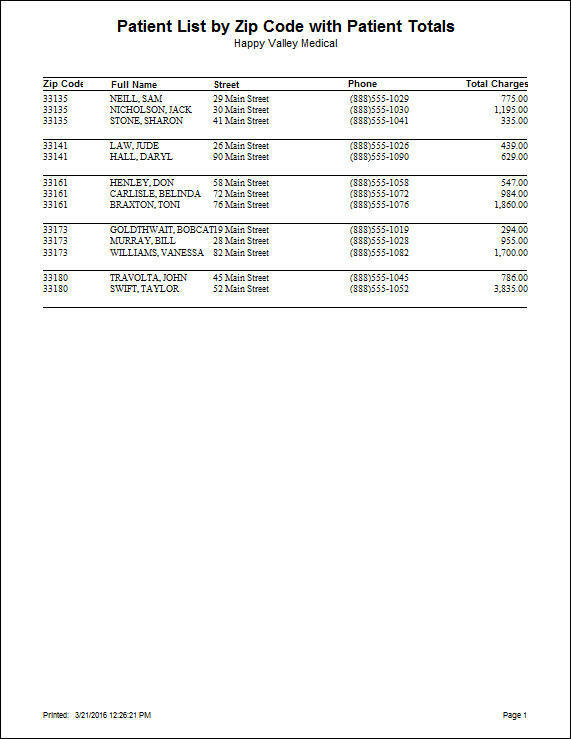 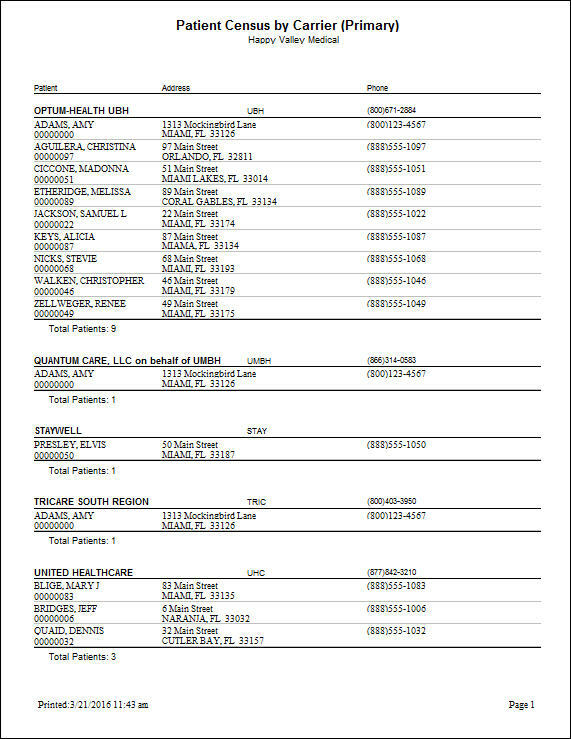 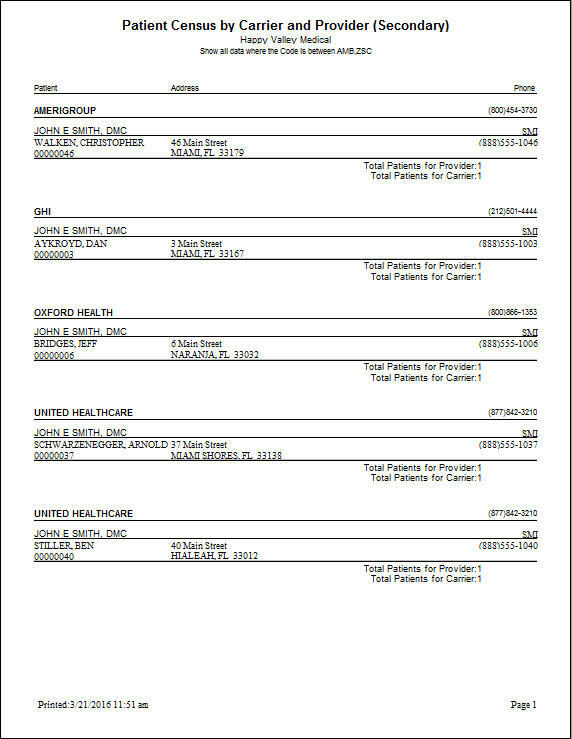 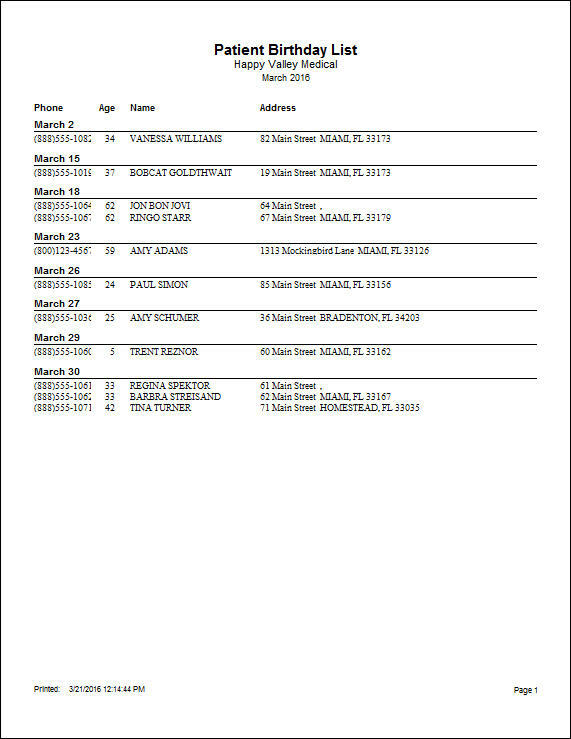 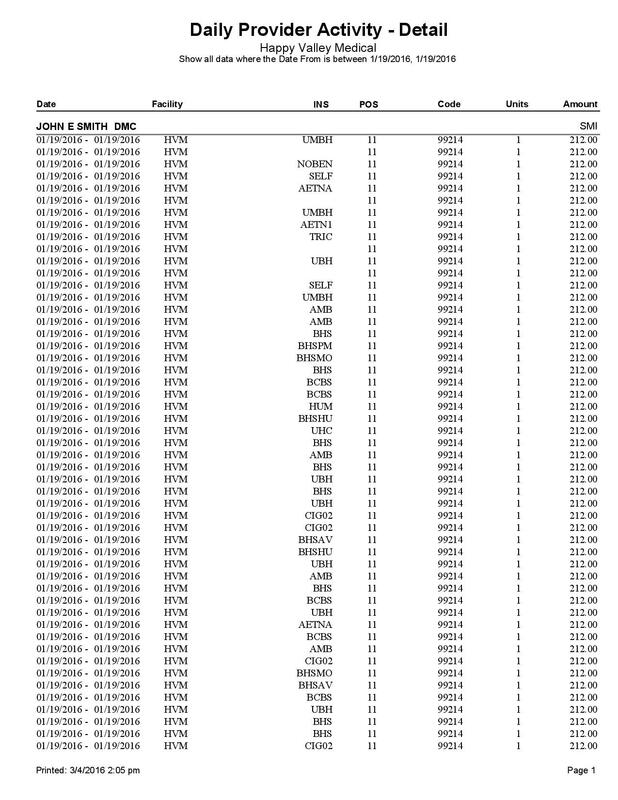 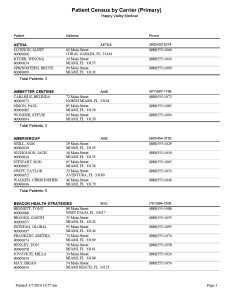 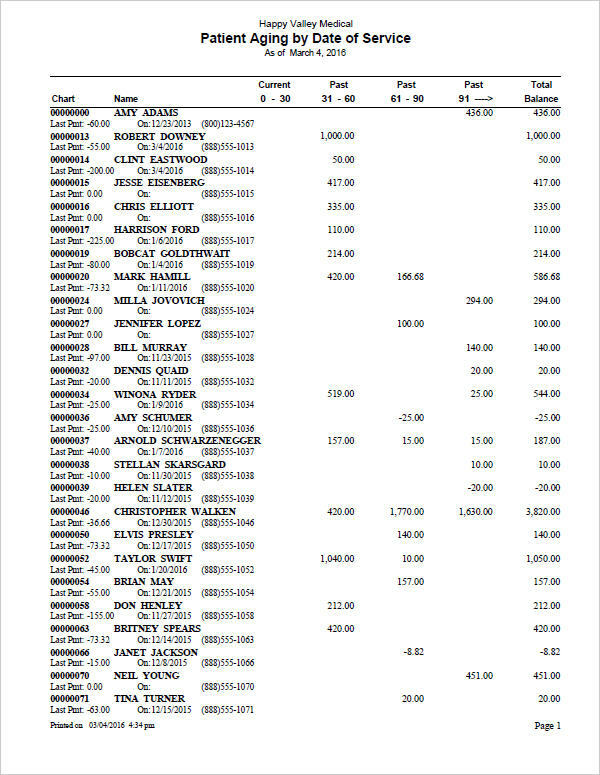 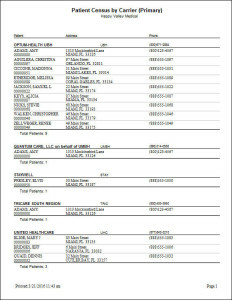 This report generates a list of patients that have cases marked as “Cash Case” under the “Personal” tab of the case. 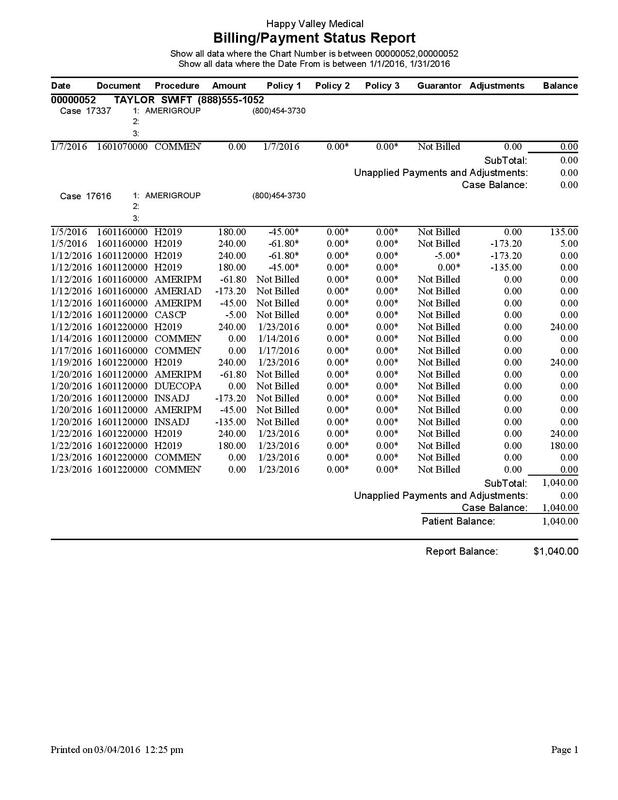 Details on this report include the chart number, patient name, case number and description, and the total balance. 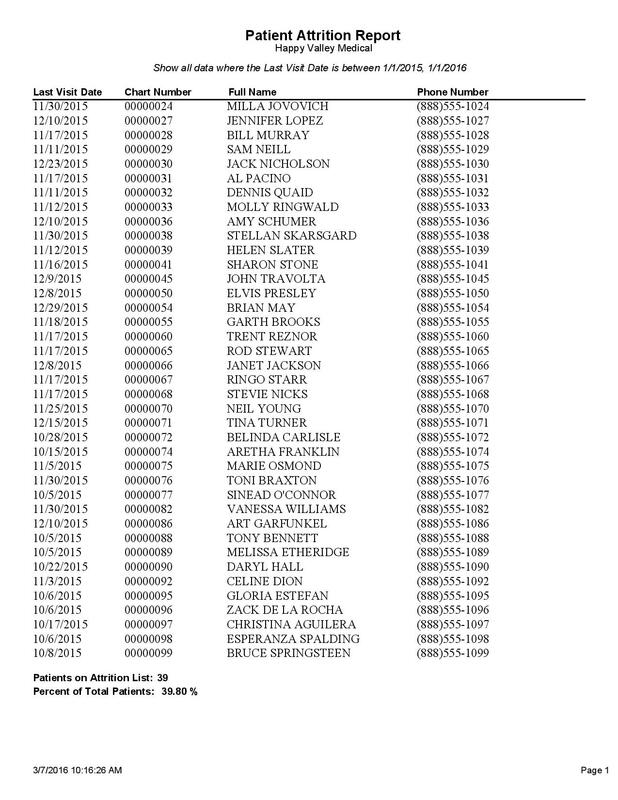 This report generates a list of patients that have cases marked as “Cash Case” under the “Personal” tab of the case. 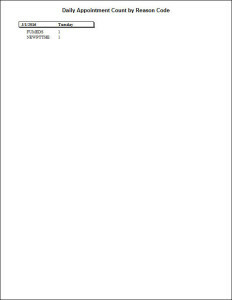 It is broken down by patient, and then by the case. 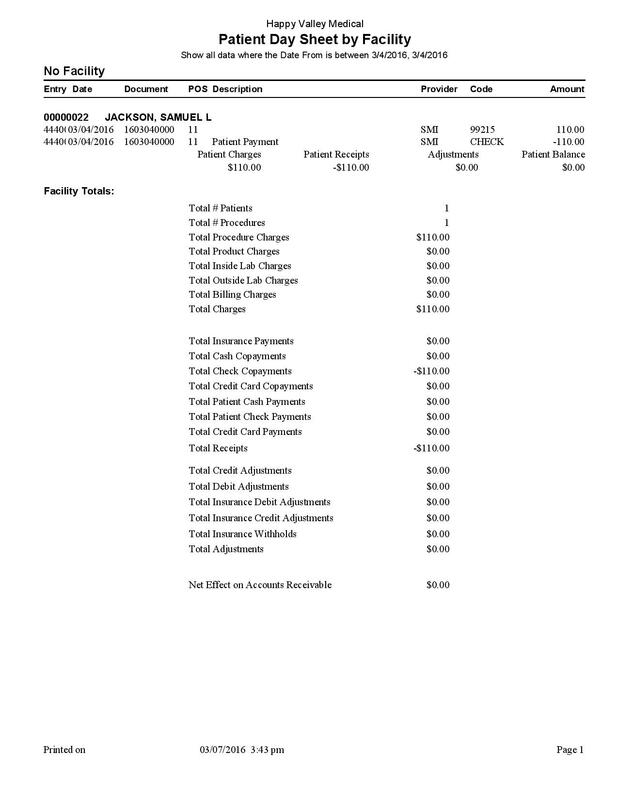 Information provided includes the patient name, chart number, case number, description, date, procedures, attending provider, and amounts of charges/payments/adjustments. 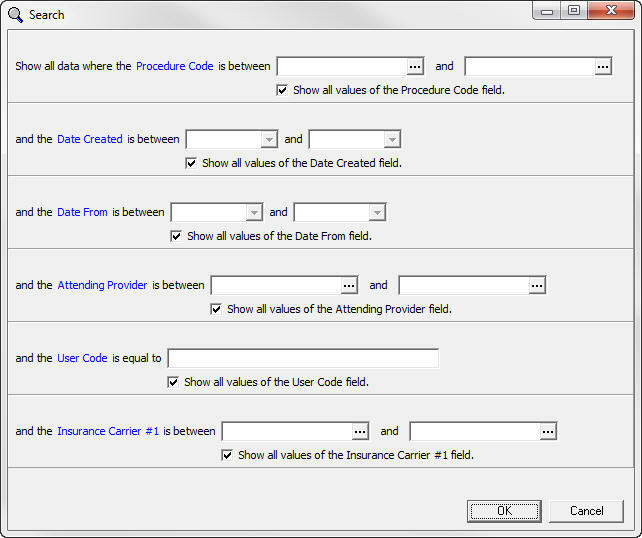 This report provides a list of collections for a specific procedure code, or a range of procedure codes. For each code selected, it lists the patient’s billed with that code, the date of service, charge date and amount, the payment date, and the payment amount. 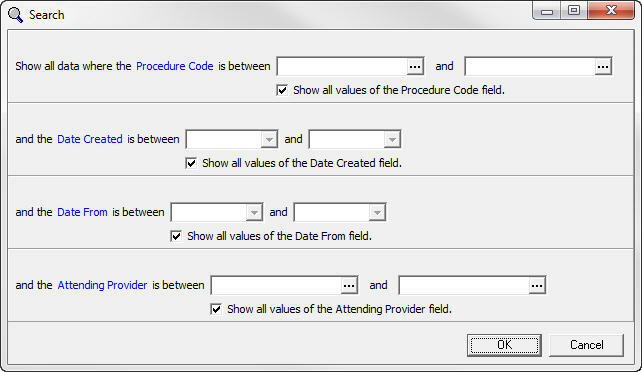 This report provides a list of collections for a specific procedure code, or a range of procedure codes. For each code selected, it lists the code, description, units billed, payments, and average payment per unit. 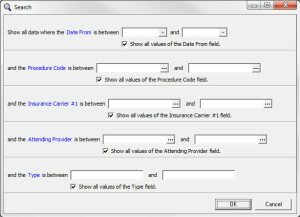 This report provides a list of collections for a specific procedure code, or a range of procedure codes, organized by provider. 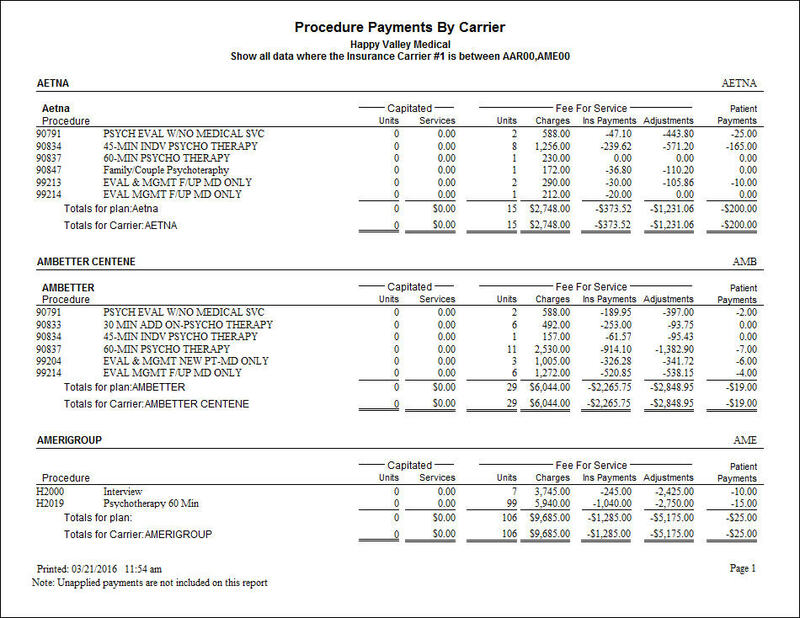 The report lists the provider, procedure code, description, units billed, payments, and average payment per unit. 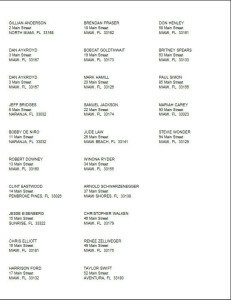 This report generates a list of appointments for a specific reason code, or range of reason codes. 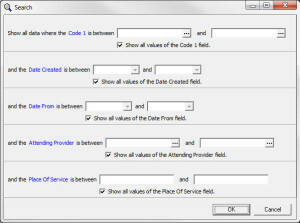 The list shows the date of the appointment, the reason code, and the count of appointments for that reason code, for that date. 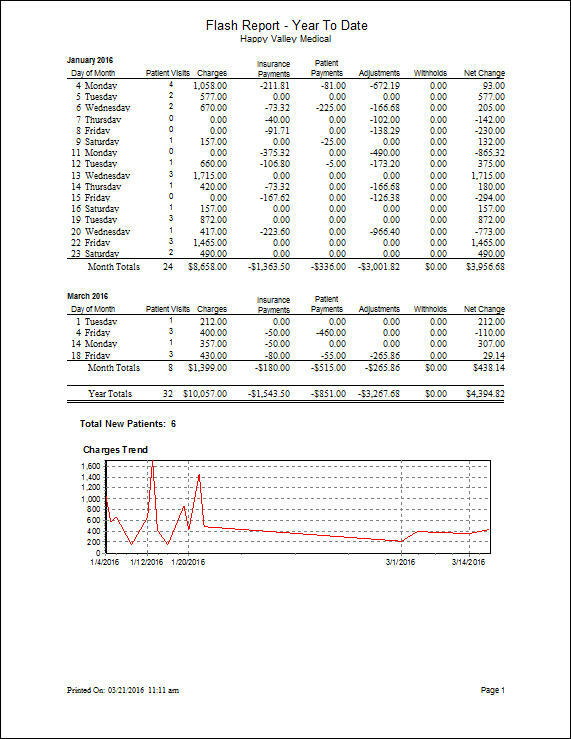 This report provides daily deposit information including the deposit date, day of the week, number of deposits, and the total deposit amount. 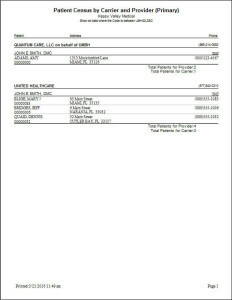 It also breaks the deposit up into categories of checks, cash, credit card, and electronic payments. 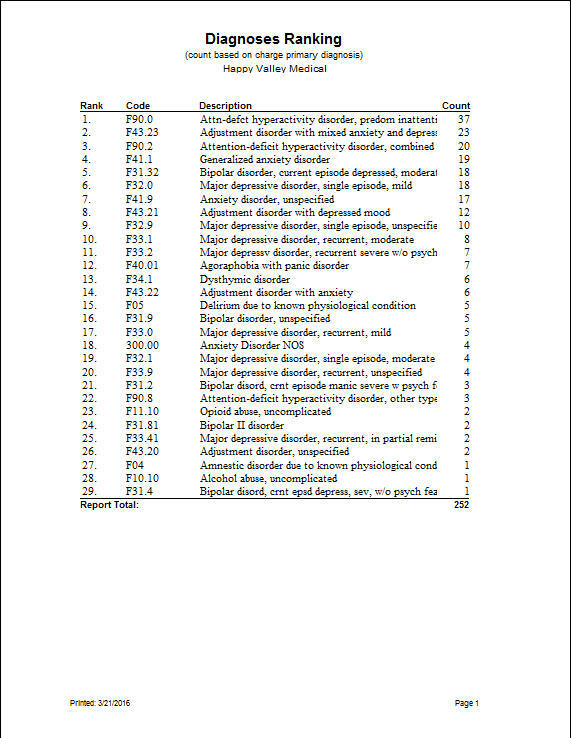 This report provides a list of diagnosis codes based on popularity. 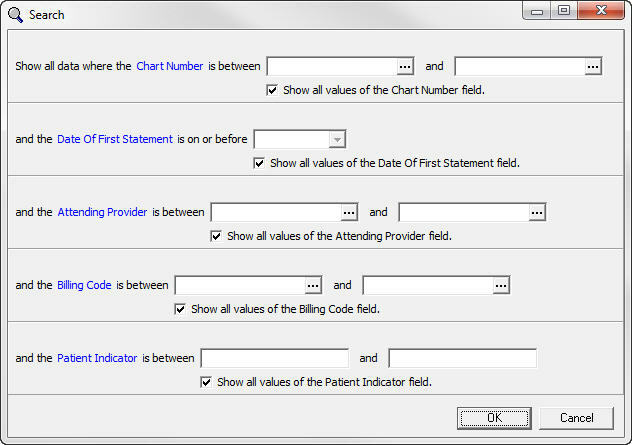 The diagnosis code linked to the most cases will appear first, and they will continue in descending order. 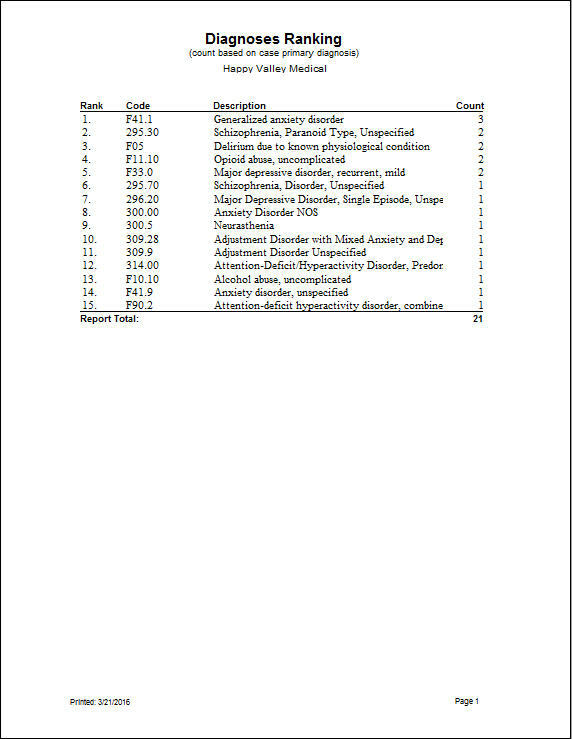 This report lists the most popular diagnosis codes based on number of charges reporting it as the primary diagnosis. The first code will be the most popular and the rest will be listed in descending order. 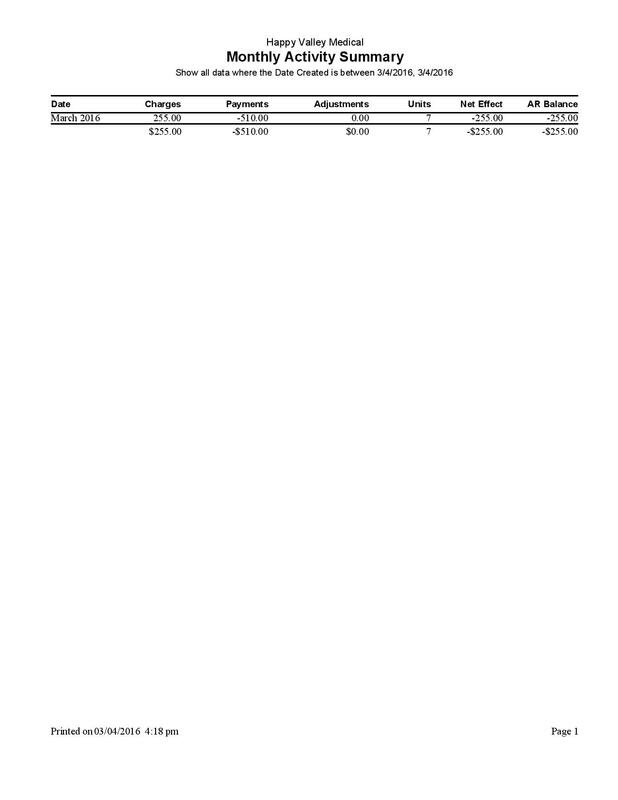 This report provides the fee schedule in place for a selected insurance company or range of insurance companies. It will list the fee schedule amount for each procedure code. 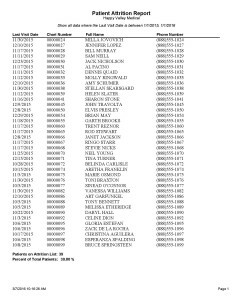 The Procedure Day Sheet report provides a list of patients seen on a specific date or date range, organized by procedure or transaction code. 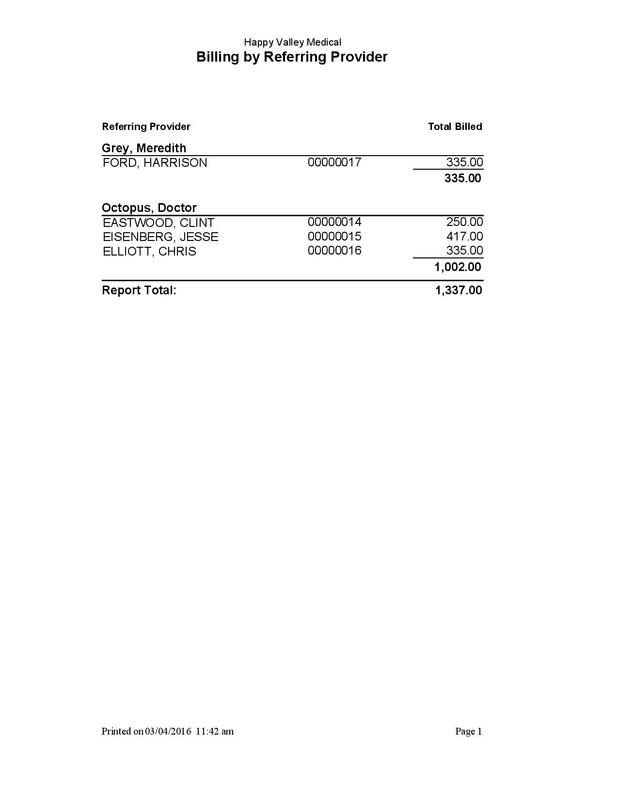 It includes the patient name, date of birth, address, account debits, and account credits. 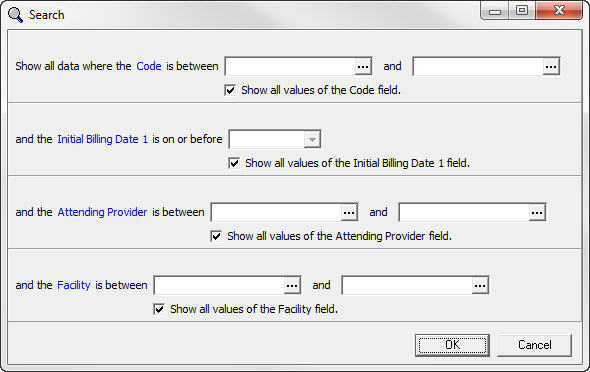 This report allows you to filter by procedure code, date created, date from, or attending provider. The difference between this report and the Procedure Day Sheet available in Medisoft is that instead of listing the Document number and PoS, it lists the patient’s address. The Practice Analysis with Modifiers report includes all information present in the Practice Analysis report, but it also includes modifiers used for certain procedure codes. 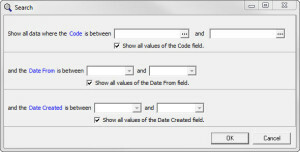 For example, in the sample report, procedure code 90834 has the modifier 59. 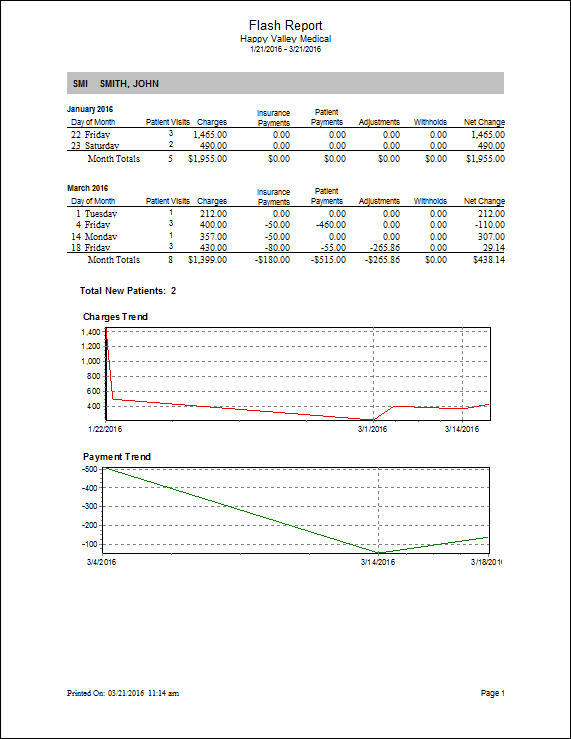 The Practice Analysis (with Practice Totals) report includes all information from the Practice Analysis report, but also includes the following totals: Total number of procedures, total charges, total payments, total adjustments, and total accounts receivable. 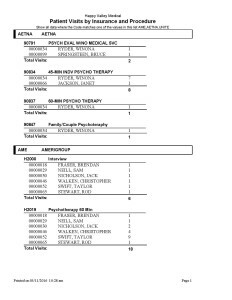 The Practice Analysis report lists each procedure and transaction code to show what codes are most popular or bringing in the most income. 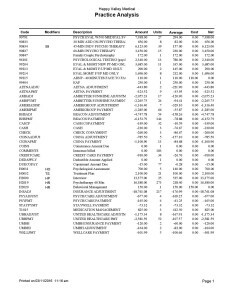 The report displays the procedure or transaction code, the description of that code, the total amount, the units, the average amount per unit, the cost, and the net income. 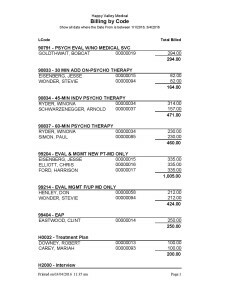 At the end of the report, totals are provided for different types of charges, patient/insurance payments, adjustments, and withholdings. The Patient Visit Report (Type) report shows the patients’ visit details and allows you to filter by multiple fields. 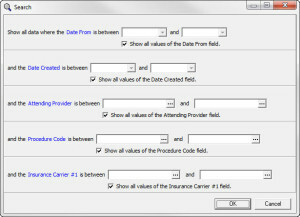 These include date from, procedure code, insurance carrier, attending provider, or type. 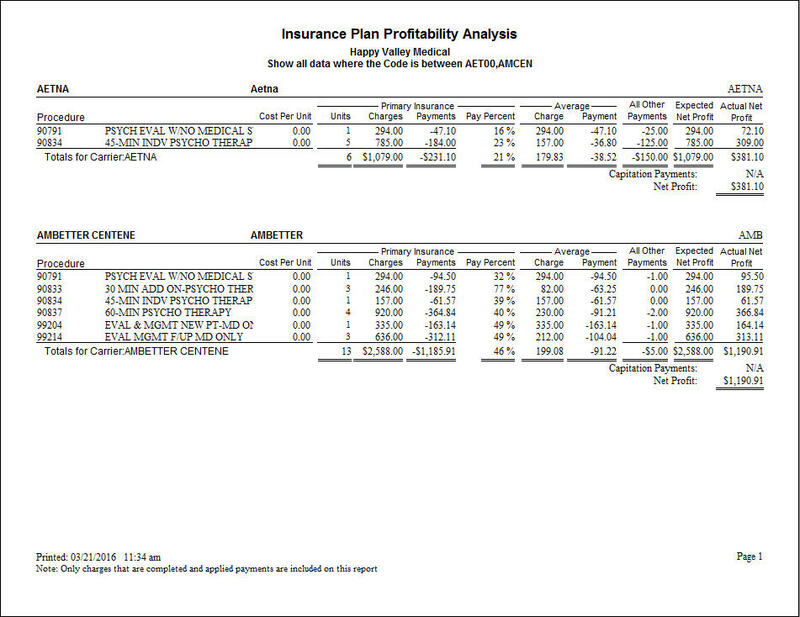 For example, the sample report was filtered for Aetna insurances. 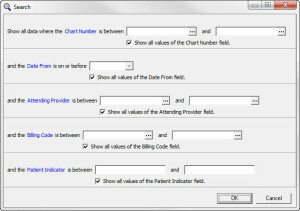 It displays the patient chart number, patient name, date of birth, insurance policy number, date from, procedure, diagoses, and attending provider. 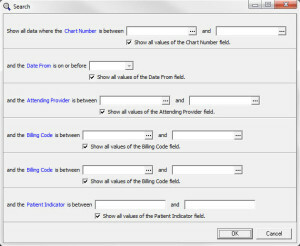 The Patient List by Ref Provider report provides a patient list organized by referring provider. 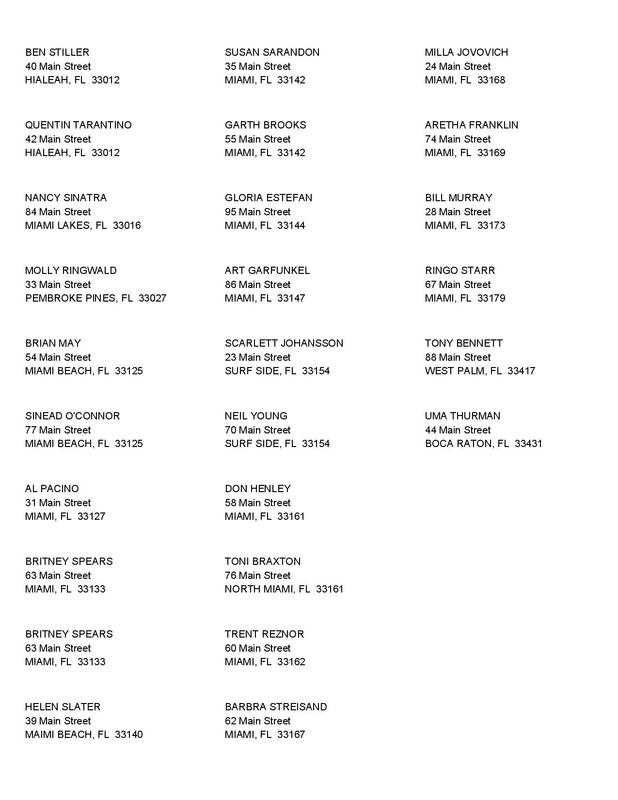 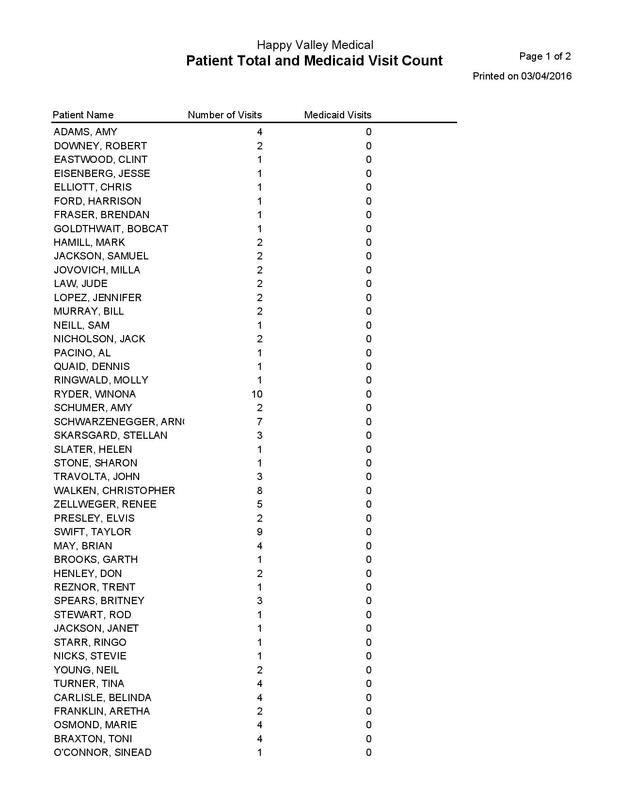 This is helpful to see how many patients the referring providers have sent to your office. 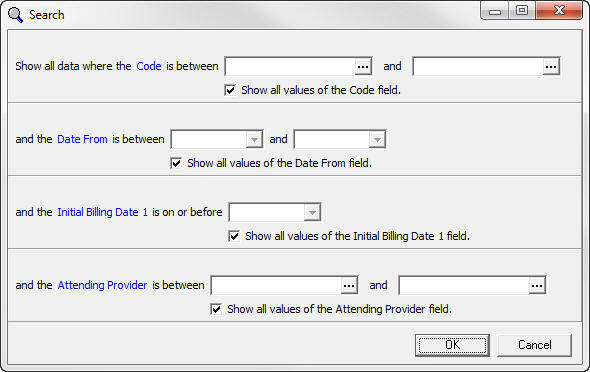 You can filter by referring provider, assigned provider, or the date that the case was created. 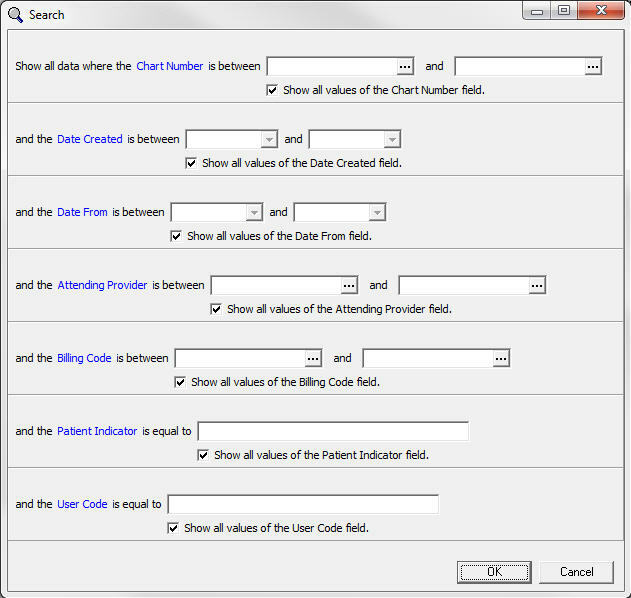 The Patient List by Primary Diagnosis (Julie) allows you to view the patient list by specific diagnoses. 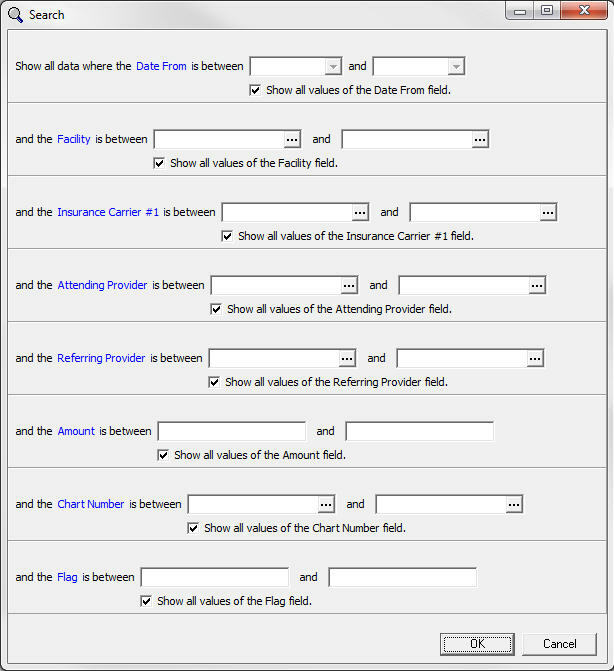 You can filter for a specific diagnosis, primary or secondary insurance, and date from. 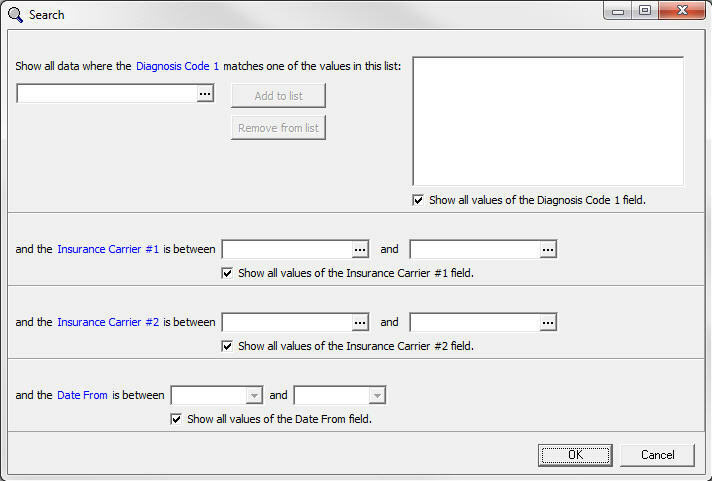 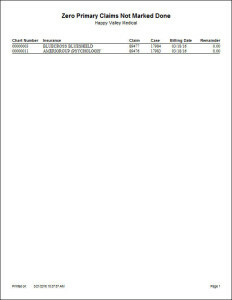 For example, the sample report was filterd by insurance and then the list is displayed by diagnosis. 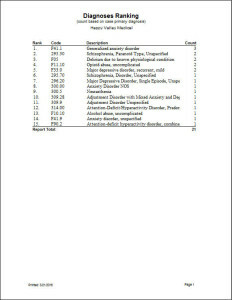 The Patient List by Primary Diagnosis (Date From) report provides a list of patients organized by their diagnosis code. 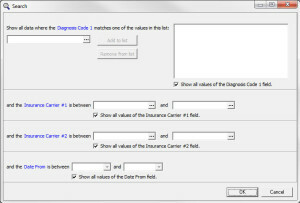 You can select specific codes to search for, or you can leave the diagnosis selections blank and it will list all patients in order of diagnosis. 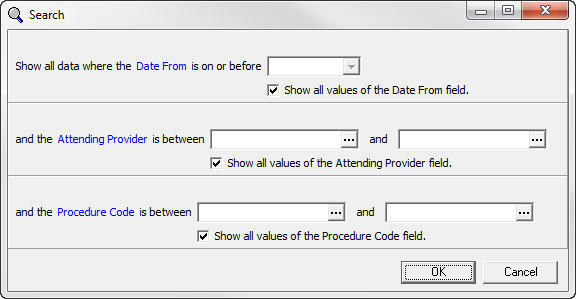 You also have the option to filter by date from, if you are only looking for patients seen within a specific time frame. 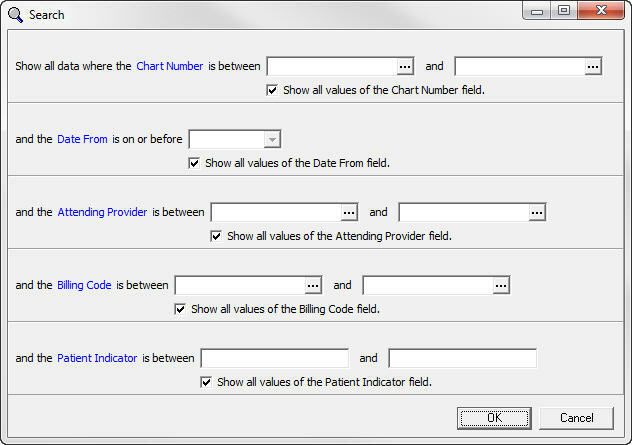 The Patient Day Sheet (Dx) report is similar to the Patient Day Sheet offered within Medisoft, but it also includes the diagnosis code entered for that date of service. 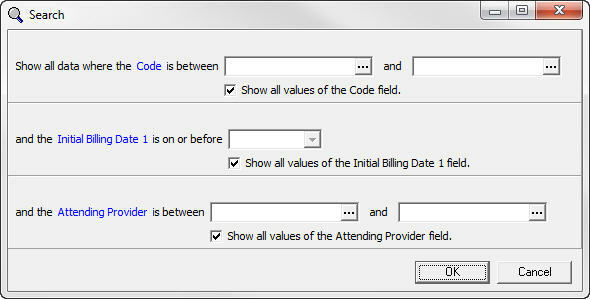 If the appointment has not had any transactions entered yet, the diagnosis code will not appear on the report. 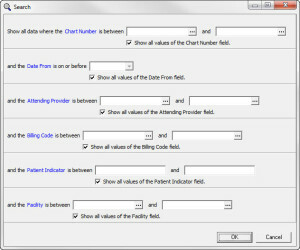 The Patient Day Sheet report allows you to view patients scheduled for a particular date or date range. 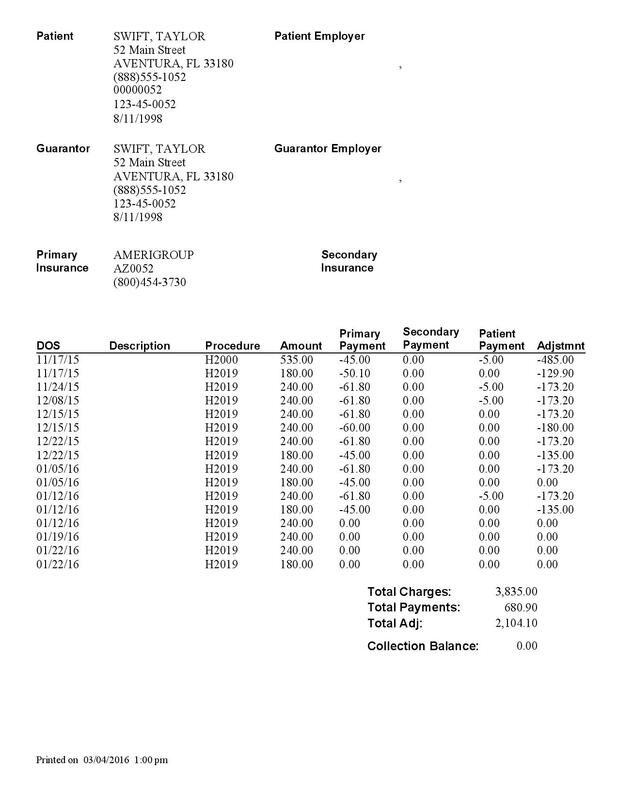 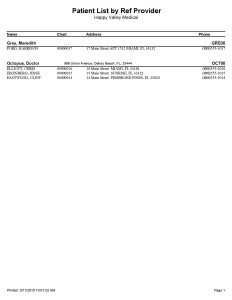 This report differs from the Patient Day Sheet that comes in Medisoft in that it only includes the patient chart number, name, date, date of birth, charges, payments, adjustments, and total amounts. 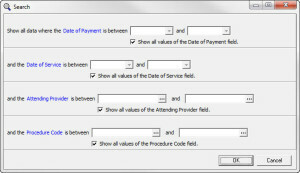 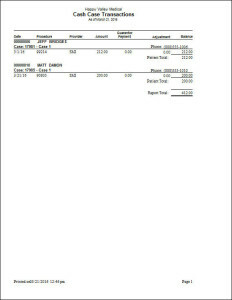 The Patient Day Sheet available within Medisoft also includes the document number, place of service, description, provider, and payment code. 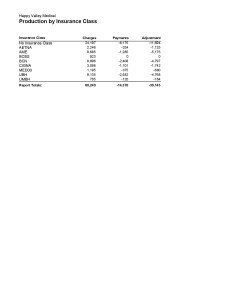 This report provides a more concise version. 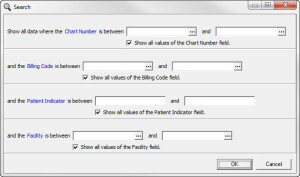 The Morris County Chart Label is a label including the patient’s chart number, first and last name, phone number, and date of birth. 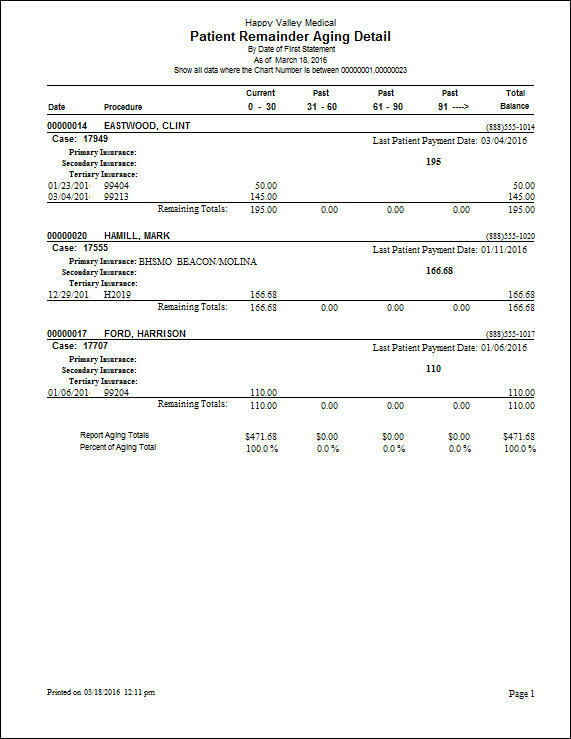 The Deposit Report allows you to see what payments were taken in for a certain date range. 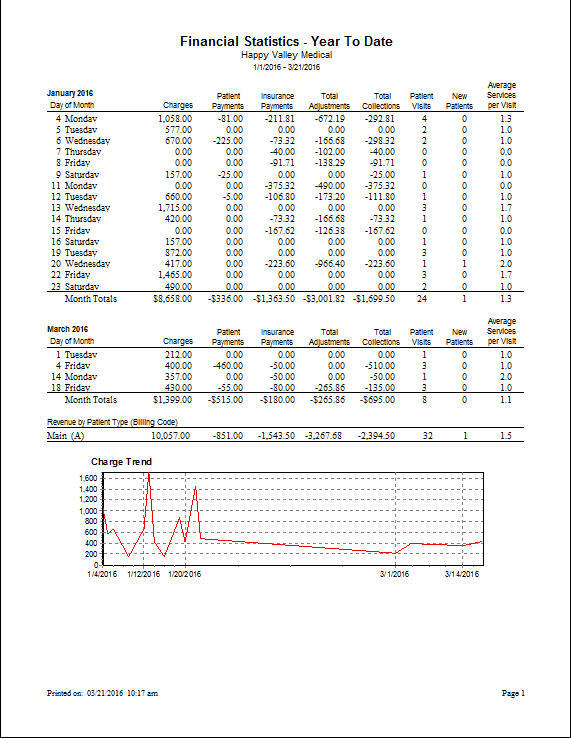 For example, the sample report was filtered for dates 01/20/2016 – 03/04/2016. 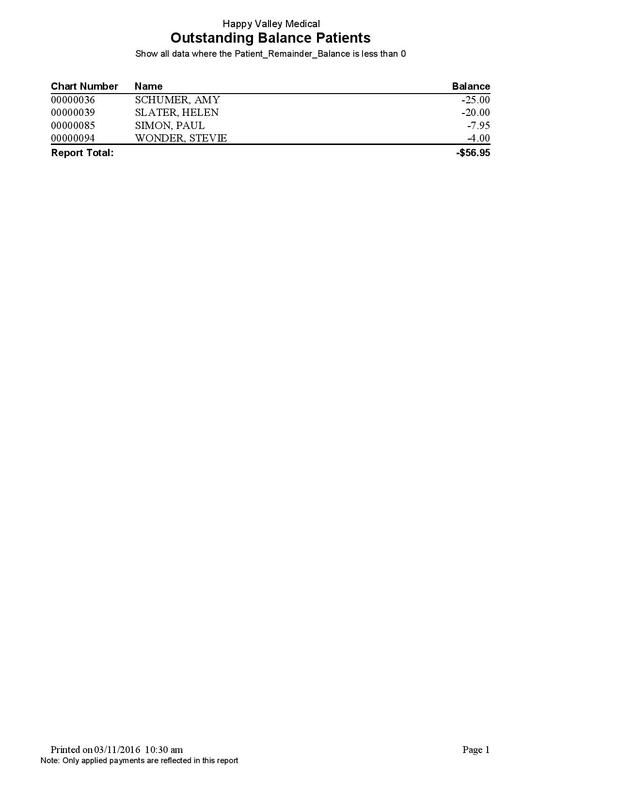 It shows all payments, sorted by date, and it includes description, check number, and payor. 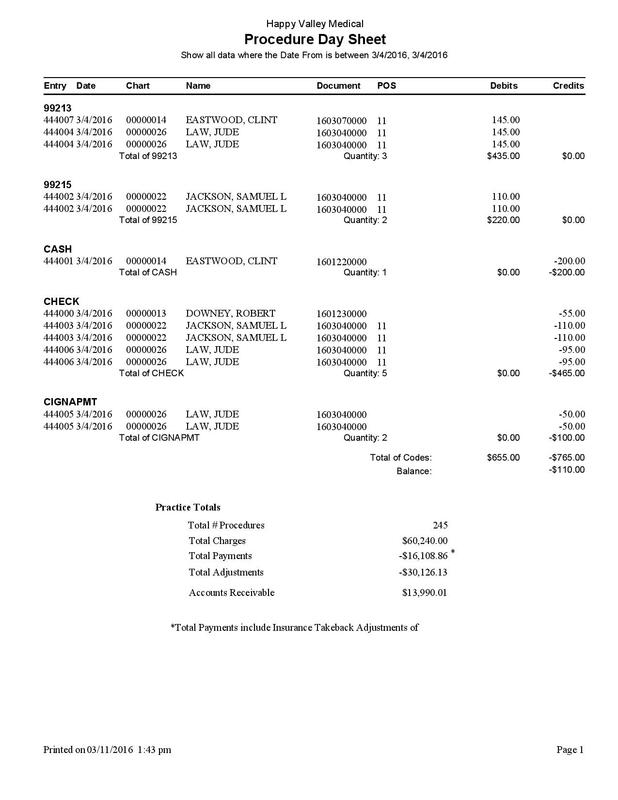 It then totals the checks, cash, credit card, and electronic payments. 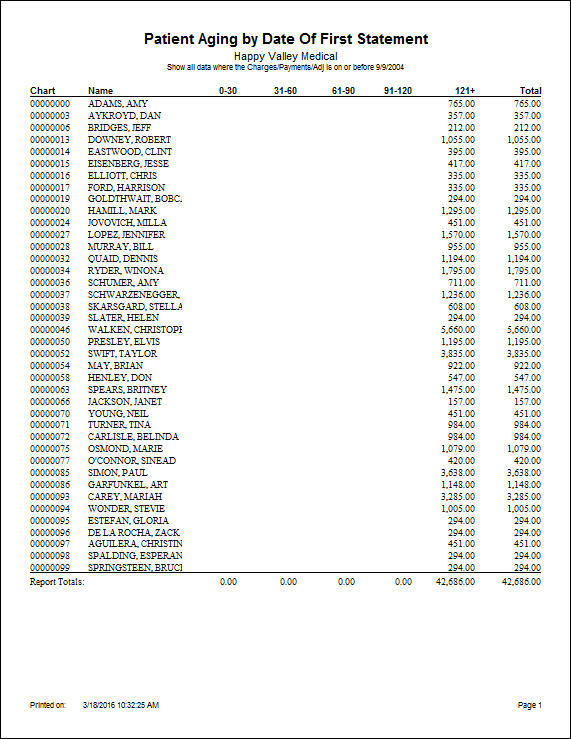 A grand total is also listed. 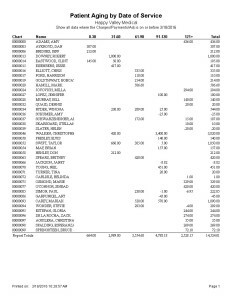 The Deposit Breakdown Detail report shows the payments that were made during the date range selected. 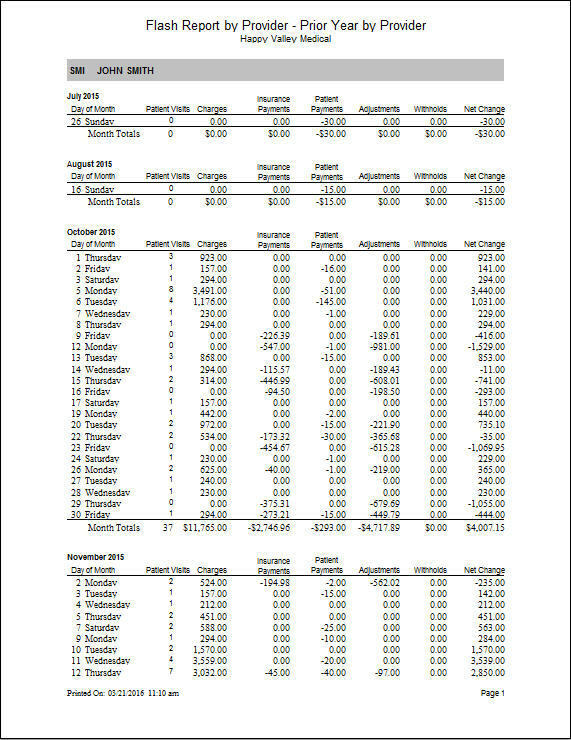 This report breaks down the transactions by month, according to the date of service the payment was applied to. For example, the sample report was filtered for the payments made between 01/01/2016 and 01/31/2016, and the payments are categorized by month starting in November 2015 and ending in January 2016. 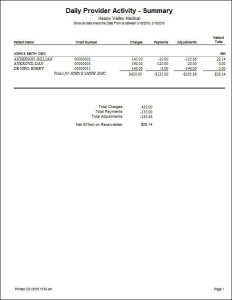 The transaction details include chart number, procedure code, date of service, charge amount, and payment amount. 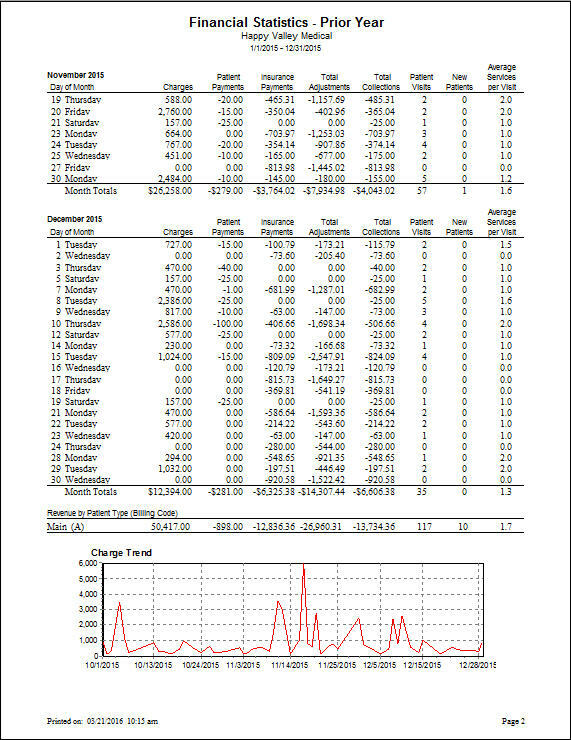 Each month is totaled and a grand total is available on the final page of the report. 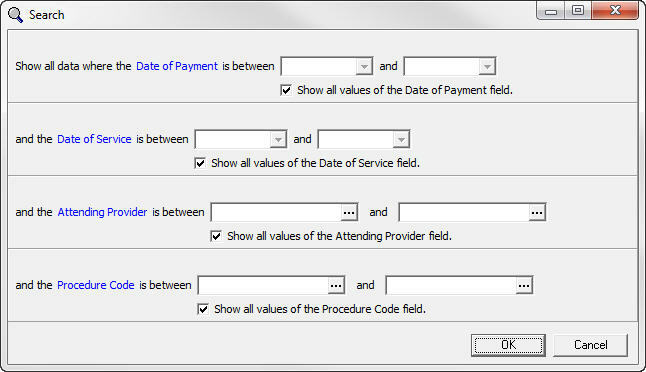 The Daily Provider Activity Detail report will show you all procedures or transactions that are entered under a provider. 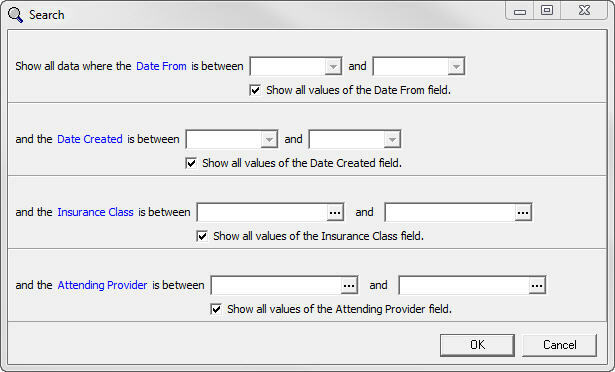 The filters allow you to look at specific days, specific providers, or specific date ranges, among others. 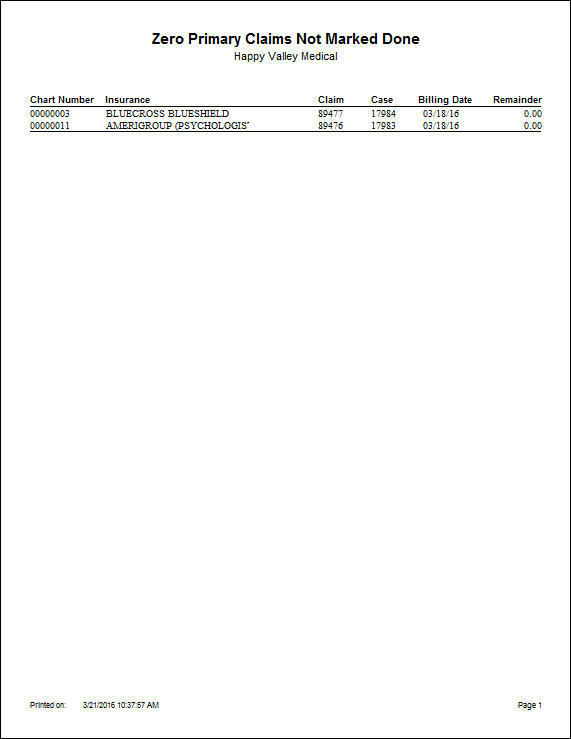 For example, the sample report was filtered for any provider activity on 01/19/2016 for procedures between 99205 to 99215. 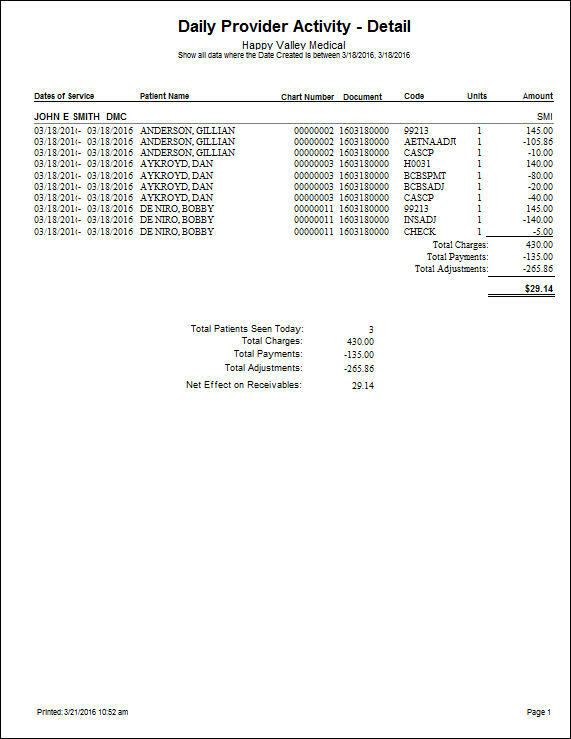 It breaks down transactions and shows the date, facility, insurance, place of service, procedure code, units, and amount charged. 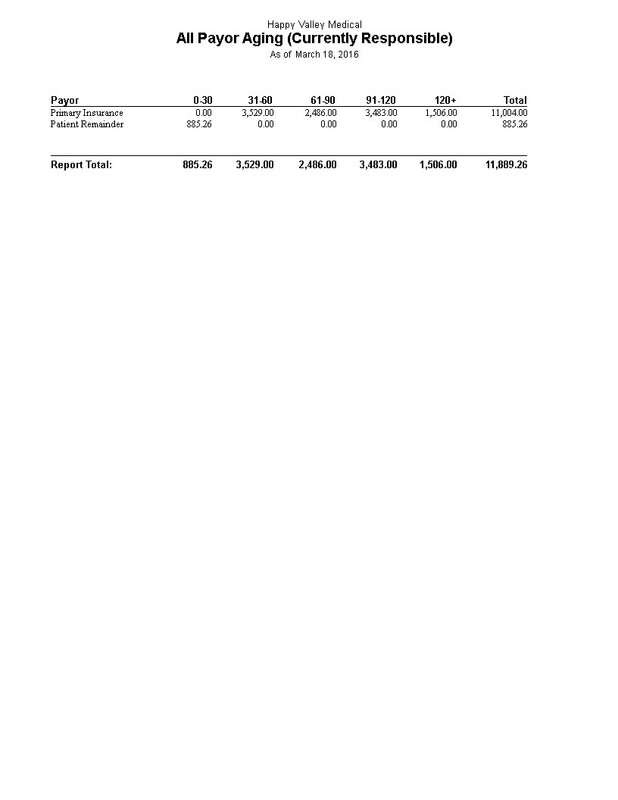 The report also provides a grand total on the final page. 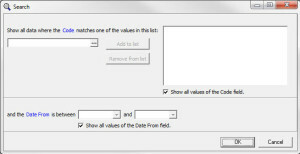 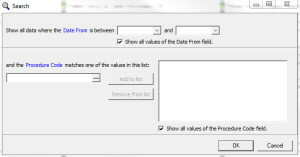 The custom Appointment List report differs from the Appointment List in Office Hours by including a column indicating if the appointment has been marked at “Approved”. 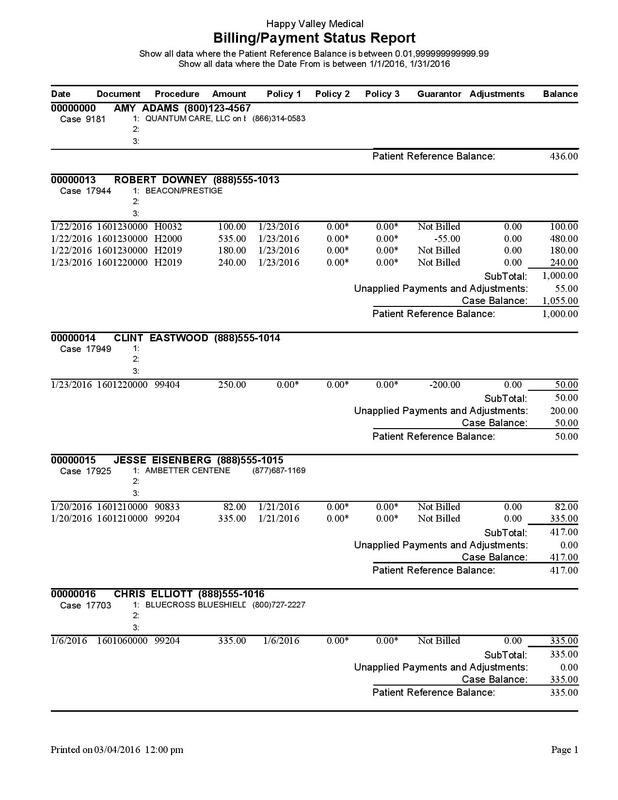 It also includes the patient’s Remainder Balance and Copay Amount. 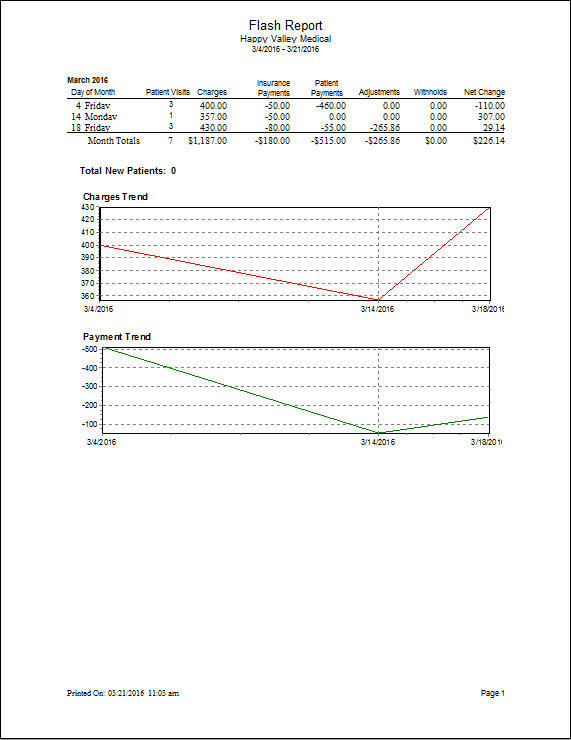 The custom Patient open balance report, allow you to export this report to Excel, it reports gives you line by line, eachCPT code, how much the insurance paid, patient paid, any deductible and adjustments and reminder balance for each line.